After Brandon and I flew back from New Zealand, there were about 4 days in San Francisco to organize and pack for our move to France in January before I would be flying to Valencia for two weeks of full immersion Spanish lessons. 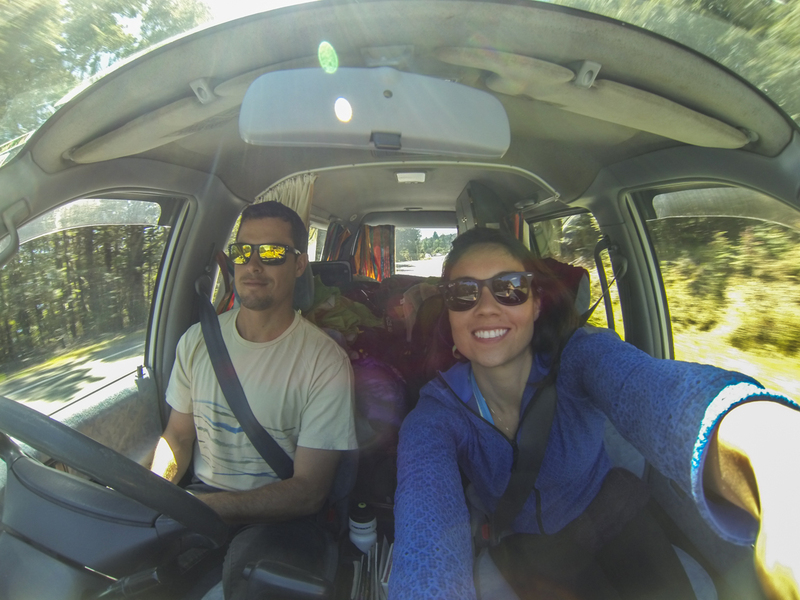 Brandon also had a short turnaround as he would be heading to Colorado for a week-long mountaineering course. 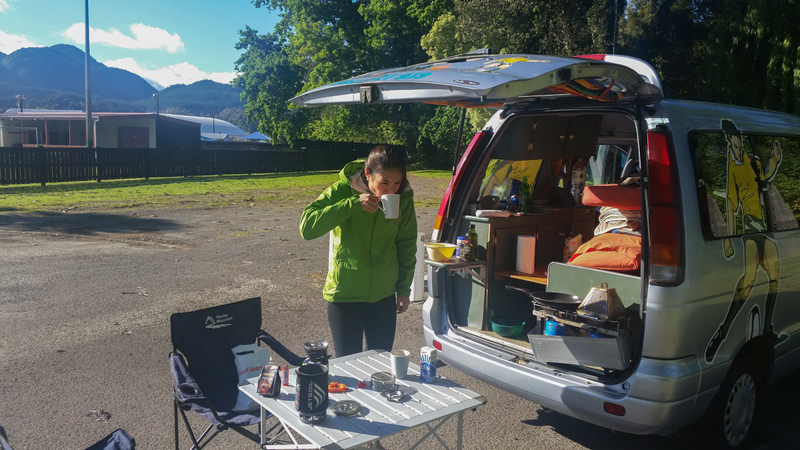 It would be another whirlwind trips for both of us, but this was something we were now familiar with and didn’t bother us much – living out of a suitcase had become the new normal! 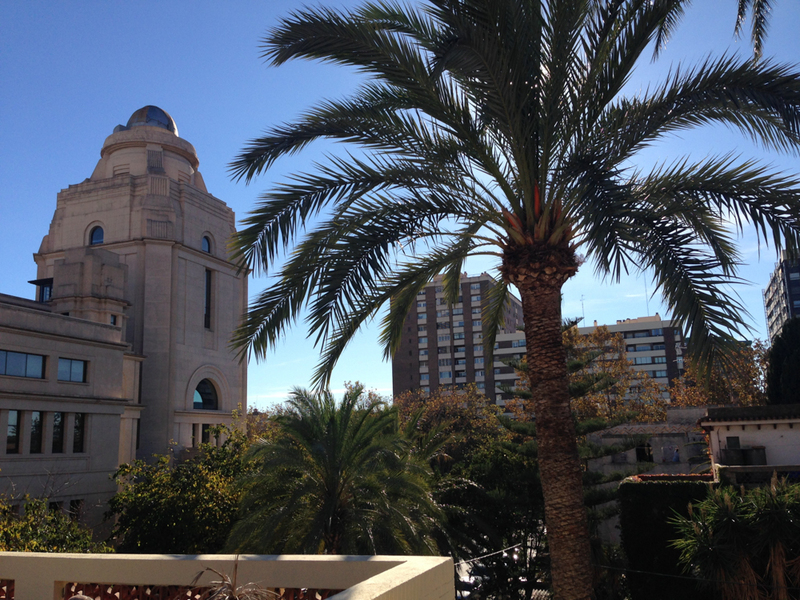 I arrived in Madrid on the morning of Sunday, December 7th. Aside from making a flight reservation through my dad’s benefits at United, I didn’t book anything. 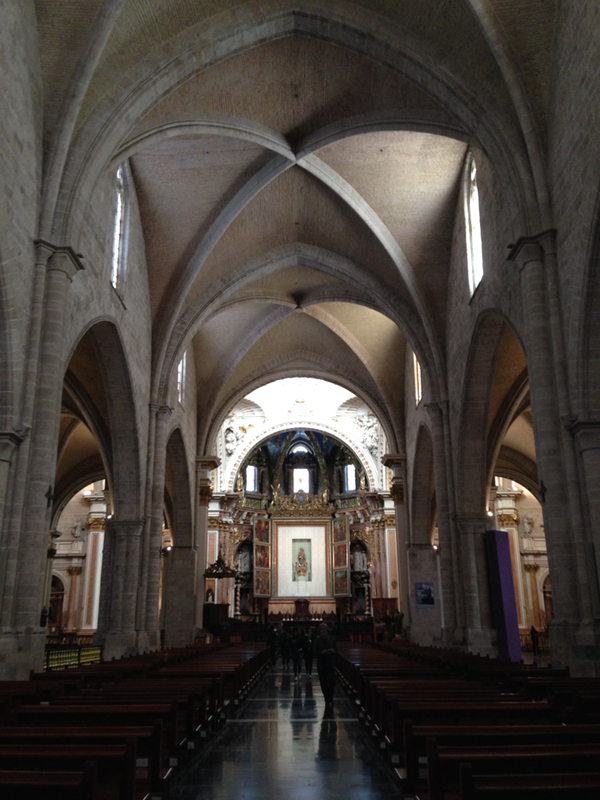 Since Valencia was a large city, my assumption was that English would get me around, public transportation would be reliable and that hostels and/or hotels would be easy and available to book. In hindsight, it may not have been the most prudent decision to make such assumptions especially when traveling alone. 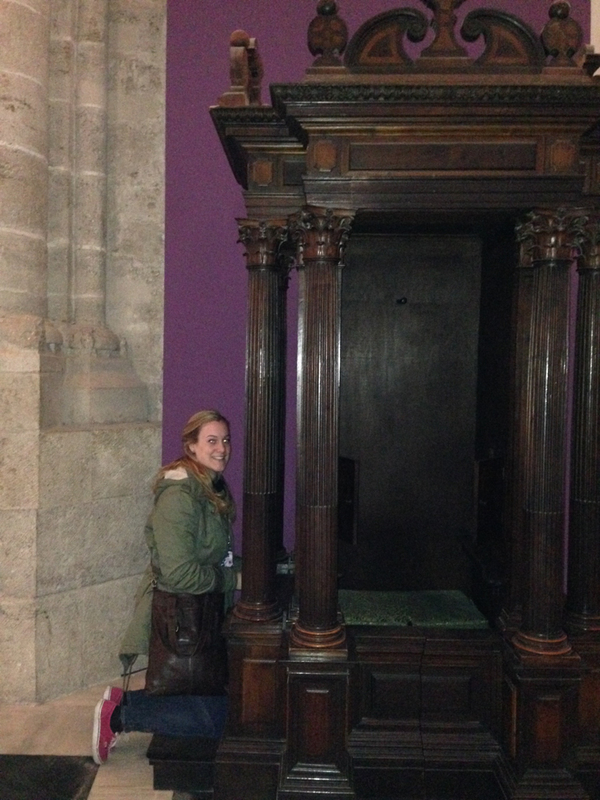 Luckily this time, for the most part, my assumptions were accurate – aside from English being widely spoken. 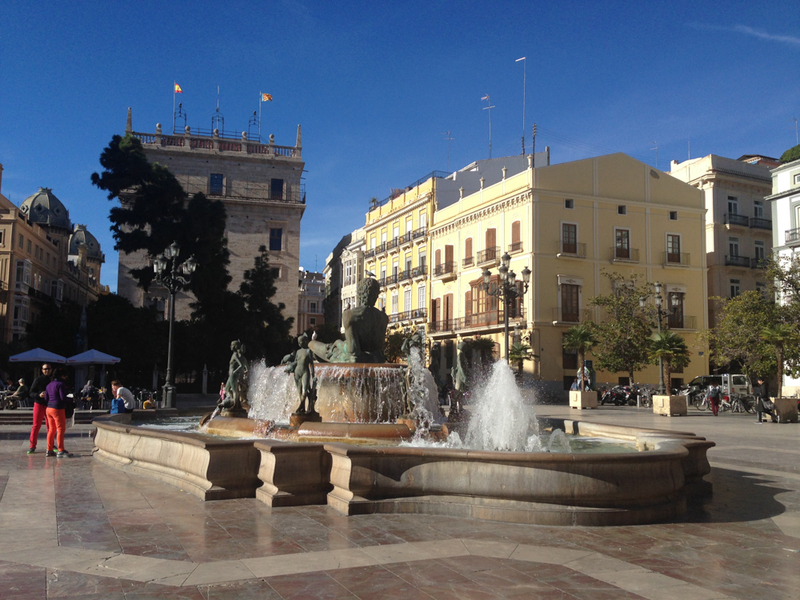 As soon as I arrived in Madrid, I paid 5 euro and took the bus to the center of town where I walked around in circles for about 2 hours until I found the right ticketing desk and platform to take the high speed train to Valencia for 65 euro. 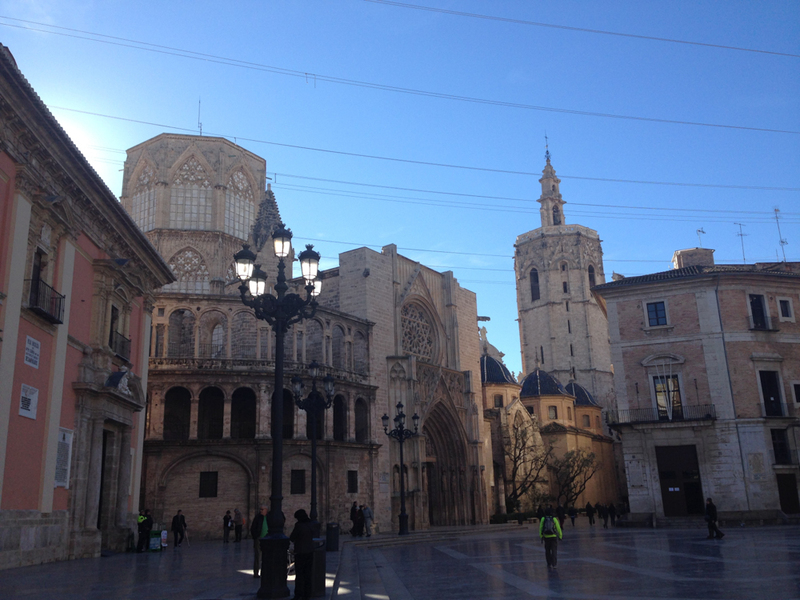 I finally made it to Valencia that afternoon and continued to plan my stay there. 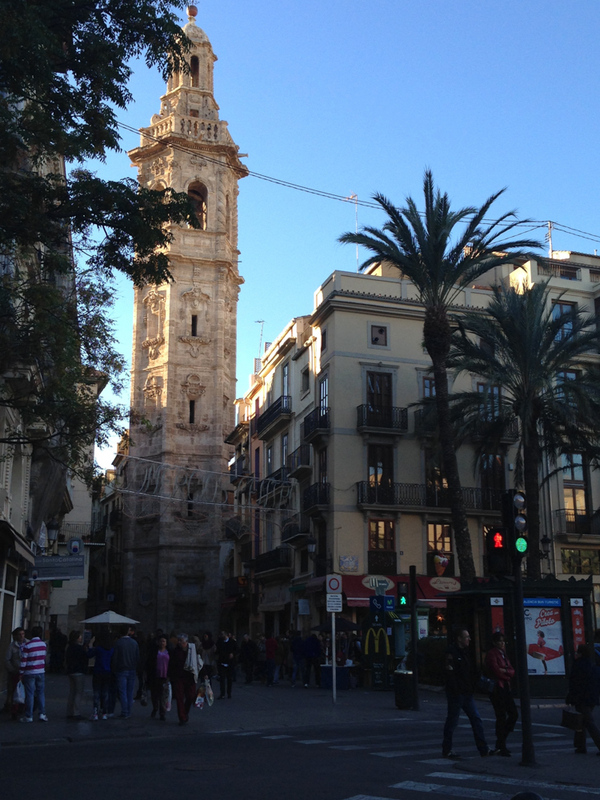 View of the Cathedral’s bell tower in the center of Valencia! 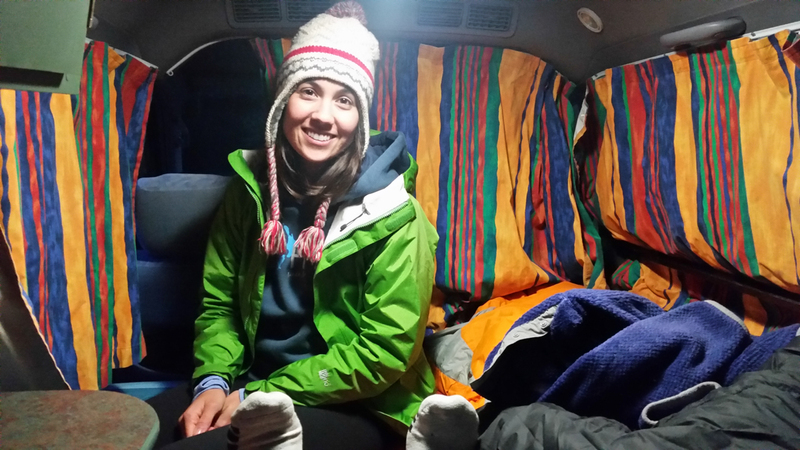 The first step was to find a place to stay for the night. I rolled my one piece of luggage around the city until I found an acceptable hostel with availability. 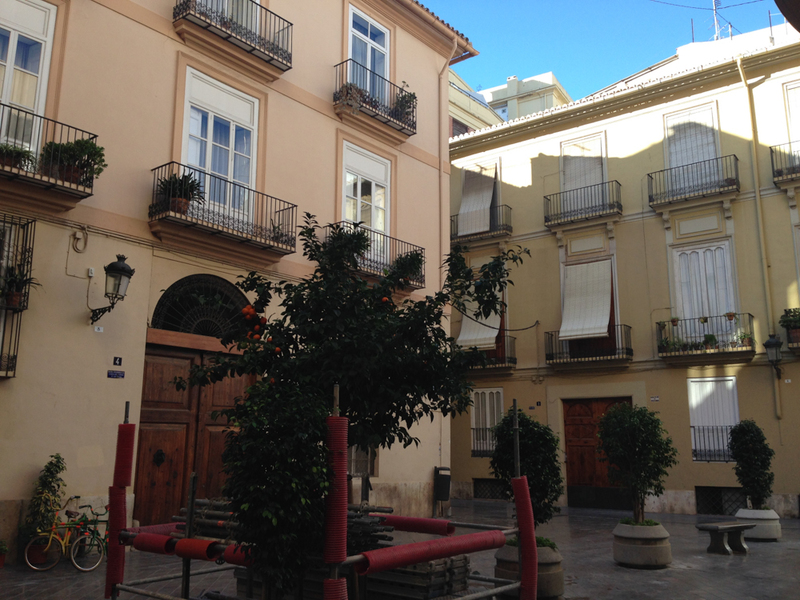 I came across the Orange Hostel near the center of Valencia and decided this would be a nice place to crash until I found a homestay to take me in for the following two weeks. 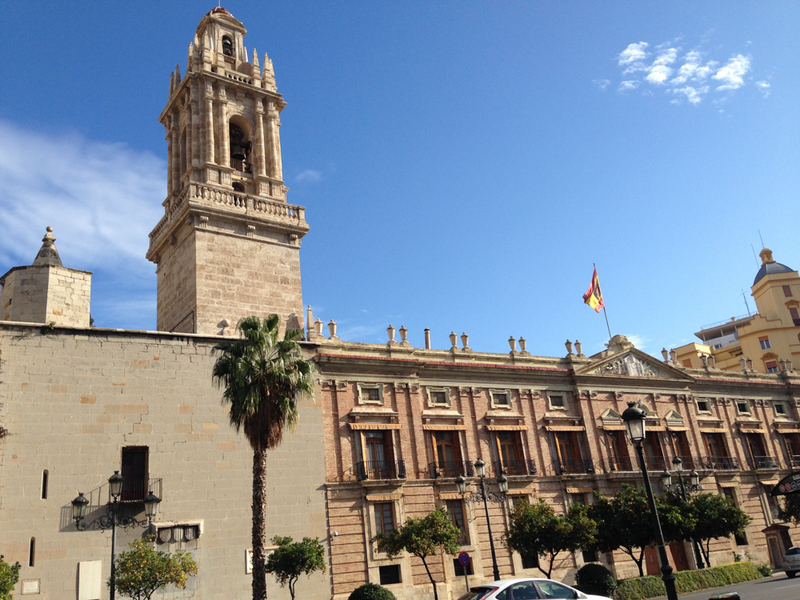 I checked in with the receptionist and we started talking – I explained that I was visiting Valencia for two weeks to learn as much Spanish as possible but hadn’t booked anything yet. Her name was Ida and she was Italian but studying at the University of Valencia. Immediately after hearing my story and checking me in, she was on the phone with her friends in Valencia who were launching a new service for tourists visiting the city called Welcome Spanish. 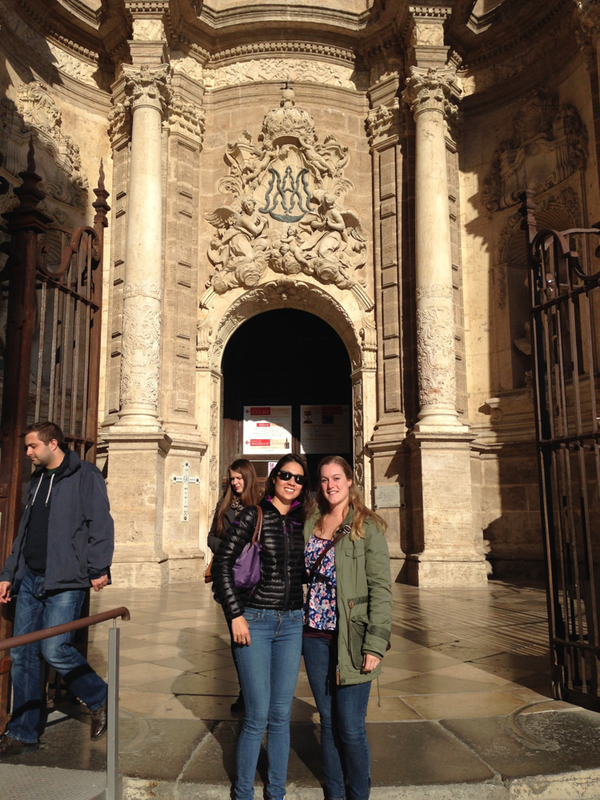 She arranged to have her two friends meet me the following morning for a tour around Valencia and to enroll me in Spanish school. I couldn’t believe it! What a hook up. 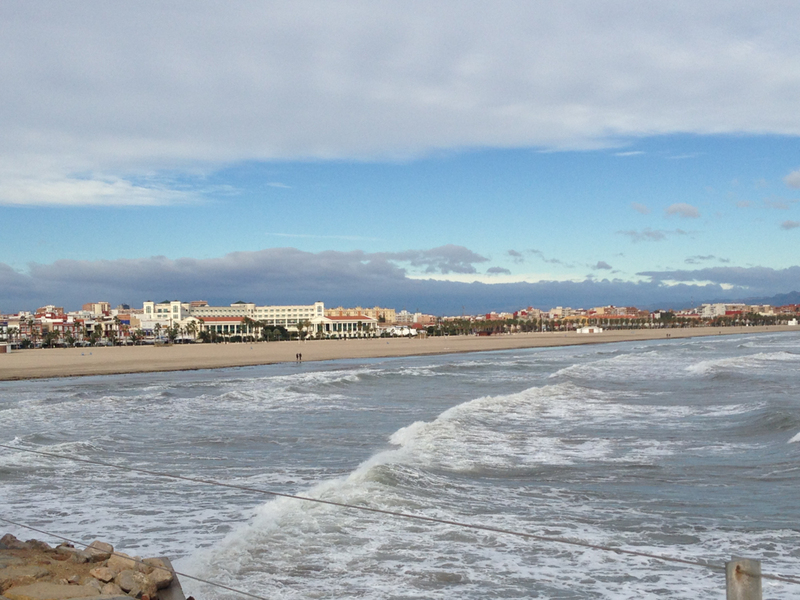 The following morning, I met Rafa and Jorge, who showed me the beaches and marinas in Valencia, the beautiful parks, the massive market in the center of town and other beautiful, historical sites around the city. That afternoon, Rafa and Jorge also helped me enroll in Spanish school. 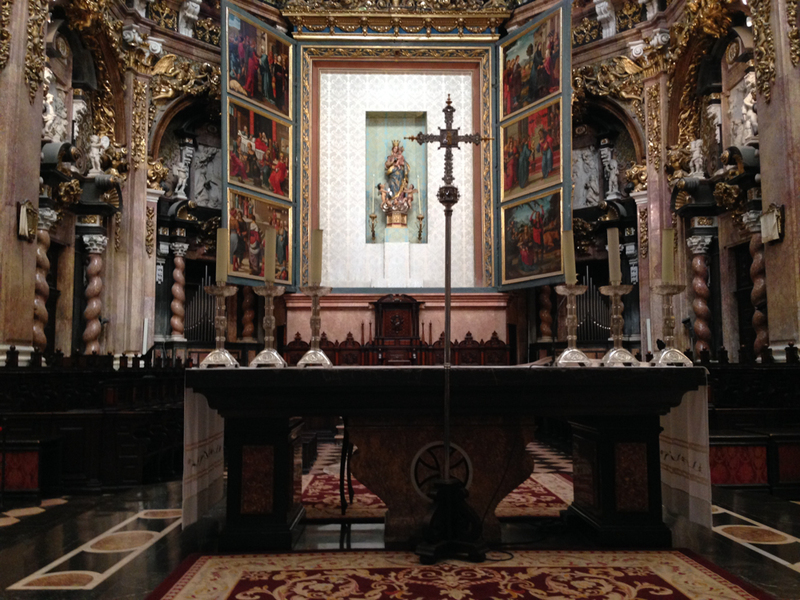 They had done their research and found the best one in Valencia – I just couldn’t believe how friendly and welcoming they were. 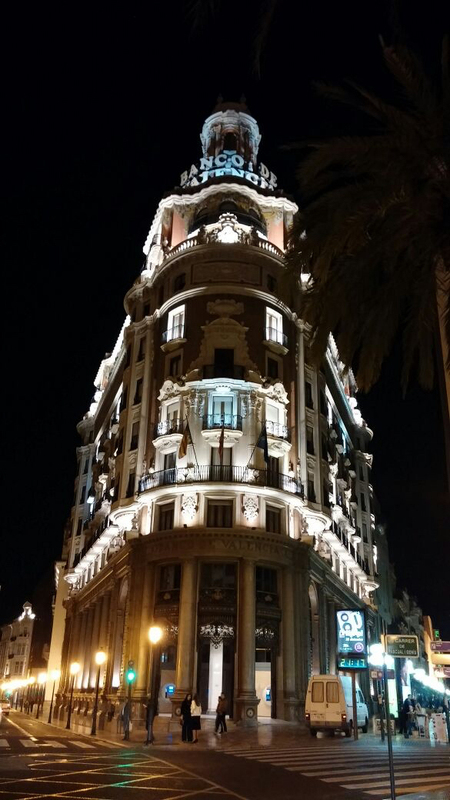 I also sorted out a homestay in Valencia the following day that happened to be 4 blocks away from the Spanish school. 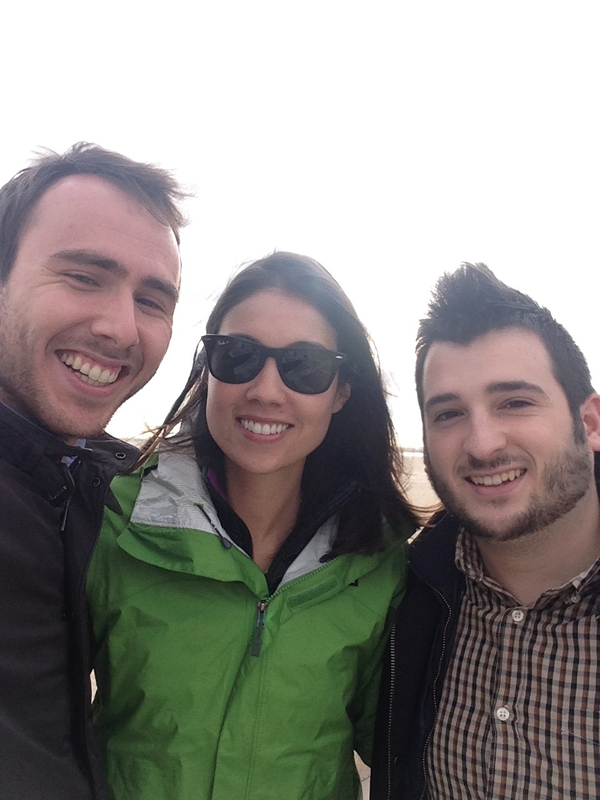 Best tour guides you’ll find in Spain, Rafa and Jorge! 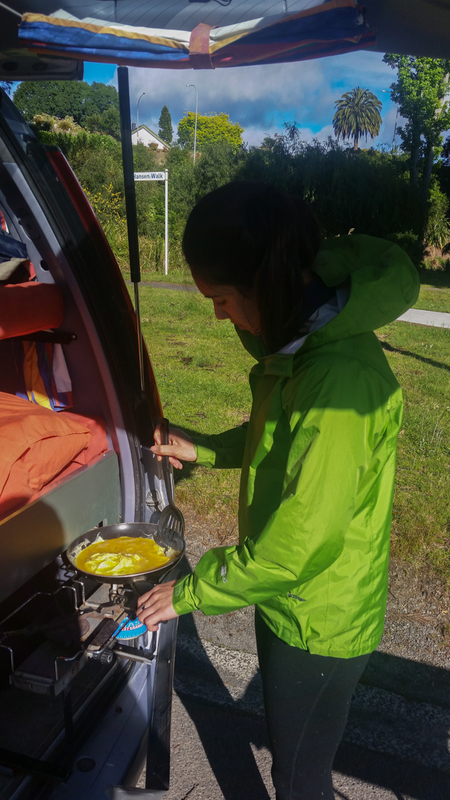 My homestay was an interesting and more challenging experience compared to the homestay experience that Brandon and I shared in Bariloche that past summer. 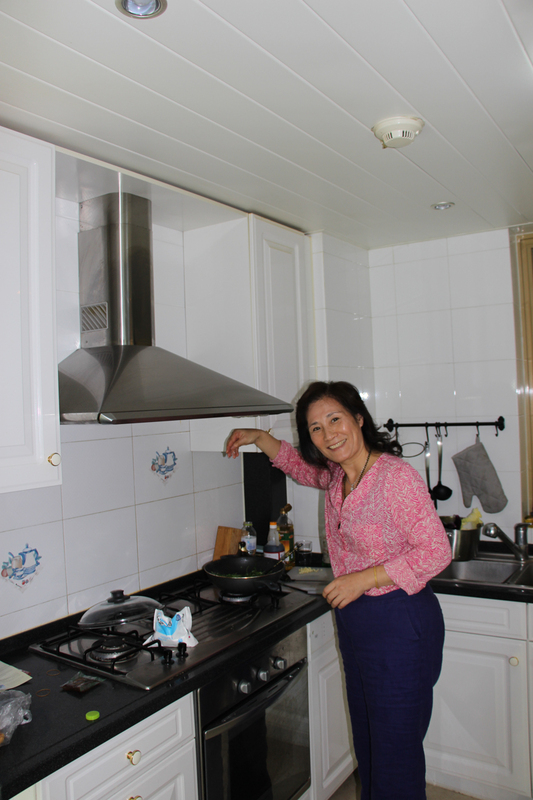 The homestay mother knew about as much English as I knew Spanish, which is to say she knew not much at all. In Bariloche, I would use Brandon as my crutch to communicate with the family. This time, I would have to fend for myself, which to be fair, is what I signed up for. I wanted to be thrown into the deep end when it came to learning Spanish this time. Meanwhile, I was really enjoying the Spanish school (school name) where I registered thanks to Rafa and Jorge. 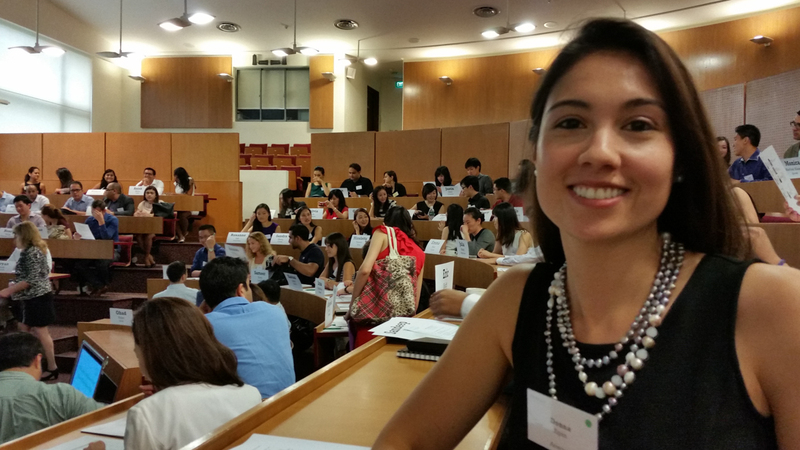 Luckily, I also met a friend, Margot from Holland, in the class. 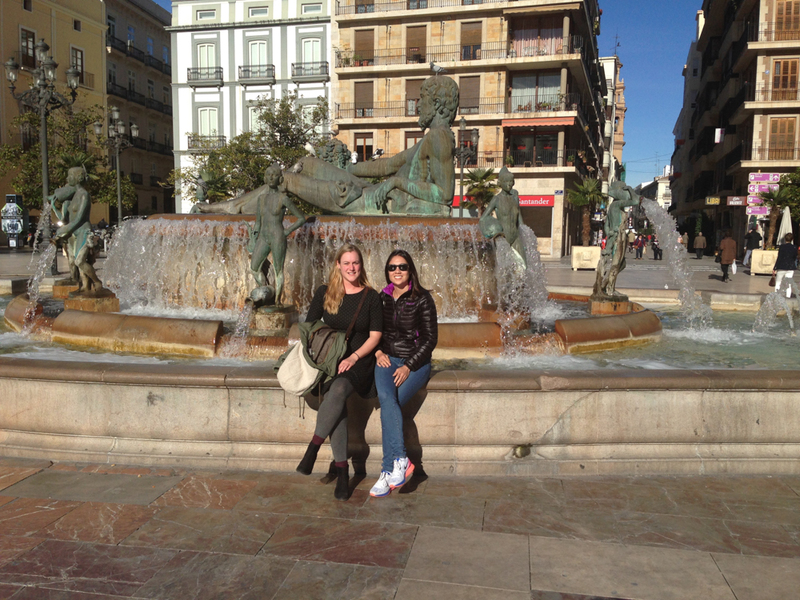 She and I were on the same page in Valencia – we were in class from 9am – 1pm everyday and immediately afterwards, we would grab a delicious café con leche and explore the center of Valencia. 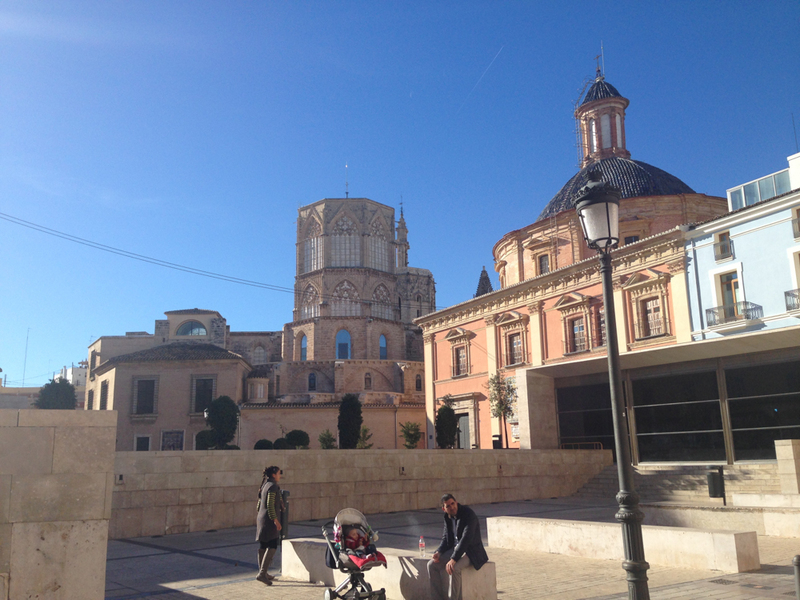 Over the two weeks, we visited the aquarium, climbed the bell tower of the cathedral, shopped at the indoor and outdoor markets, and enjoyed amazing meals in the sun! One night, Raja even invited us to go out salsa dancing with him, which I hesitantly decided to join. It was a good experience, but let’s just say salsa dancing doesn’t run naturally in my veins. Margot and me outside the cathedral! 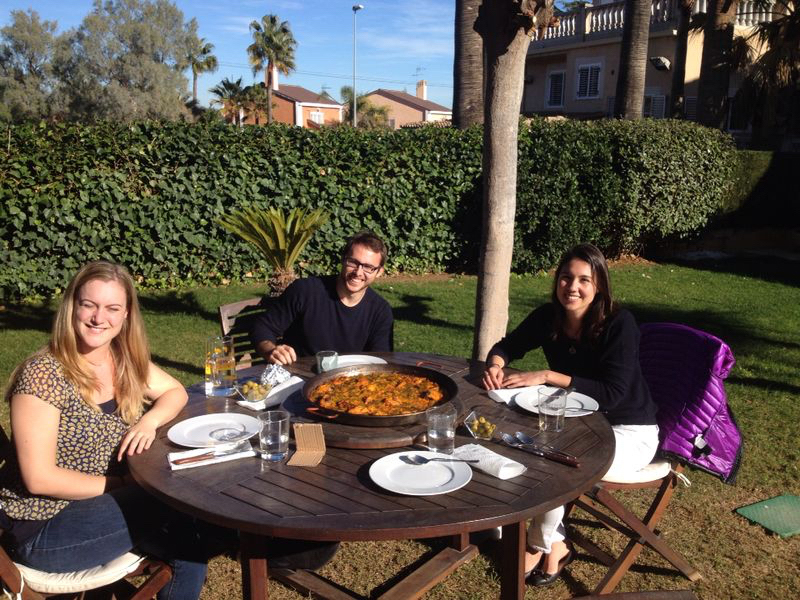 On one of our last days in the city, Rafa so generously offered to have us over to his house on the outskirts of Valencia to enjoy authentic Valencian paella. He said we couldn’t leave before trying paella from the birthplace of the dish. Margot and I drove over to Rafa’s house where we ate an amazing amount of paella outside in his backyard under the palm tress. I was in paradise. The food was delicious, the weather was perfect and I had met friends that I’d keep for a long time to come! 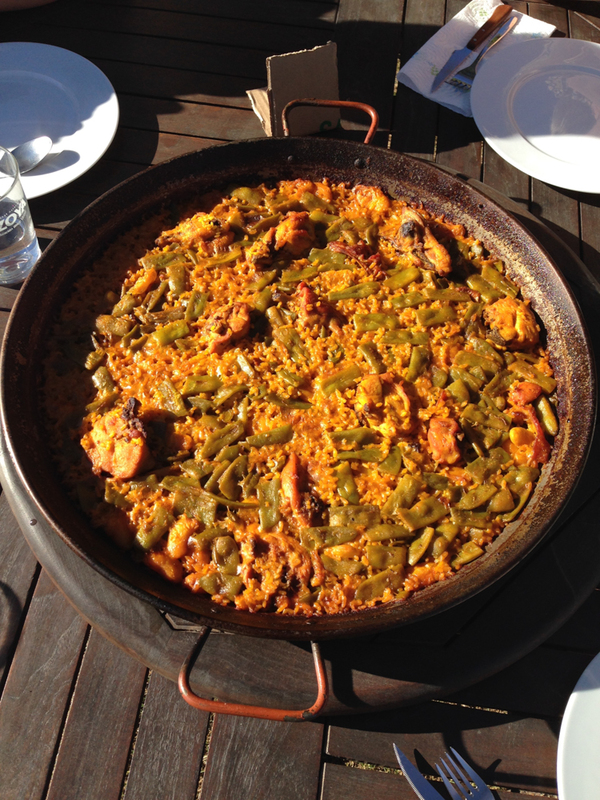 Paella de Valencia!! Me gusta mucho! 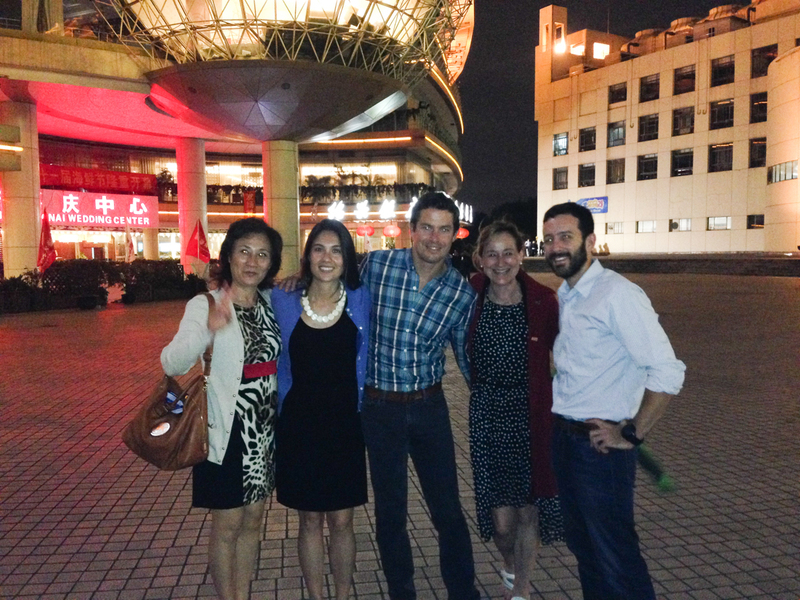 A couple of months ago, Brandon, his mom, my mom and I all decided to do a mini-tour of China together. It would be East meets West in more ways than one! 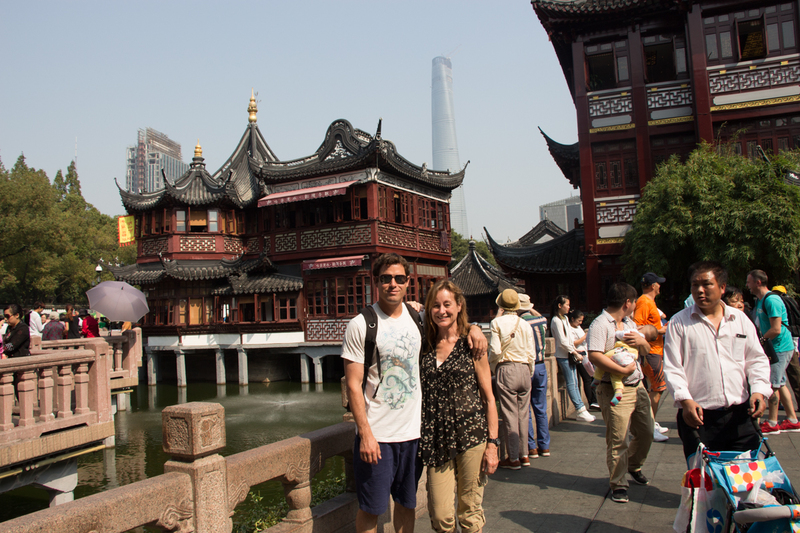 It would also mark the first time our mom’s would meet and the first time Brandon and his mom have been to China. Rather than just dipping our toe into the introductions as is normally done over dinner or a drink, we would have our mom’s hang out continuously for two weeks! In order to arrange the tours, my mom worked directly with the tour groups in China to organize our trip, which would be spoken entirely in Chinese. Kudos to Brandon and his mom for their patience and willingness to participate 100% regardless of the language barrier. Over the next two weeks, we would be visiting Beijing, Shanghai and Zhangjiajie (inspiration behind the floating mountains in Avatar) in Hunan Province. 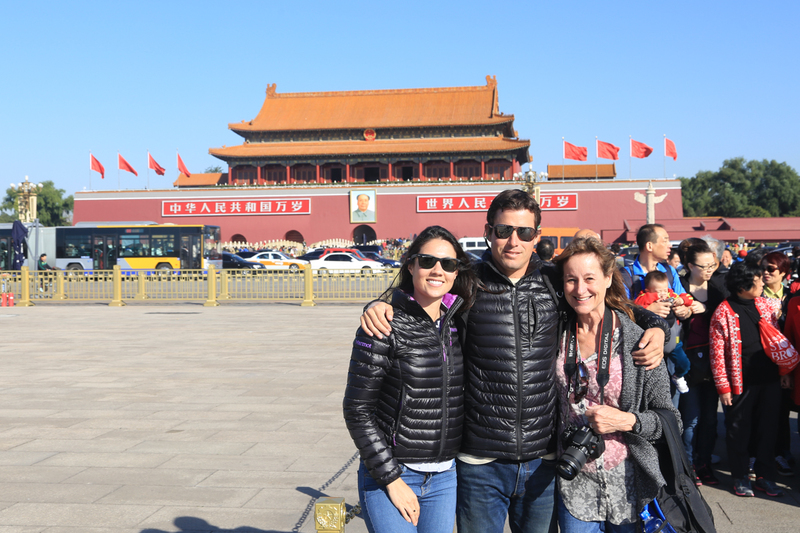 Brandon, his mom and I landed in Beijing from San Francisco on October 15th after a 12.5 hour flight. Out of luck and the connection of my dad working at United, Brandon and my standby seats turned out to be in global first class from SF to Beijing. 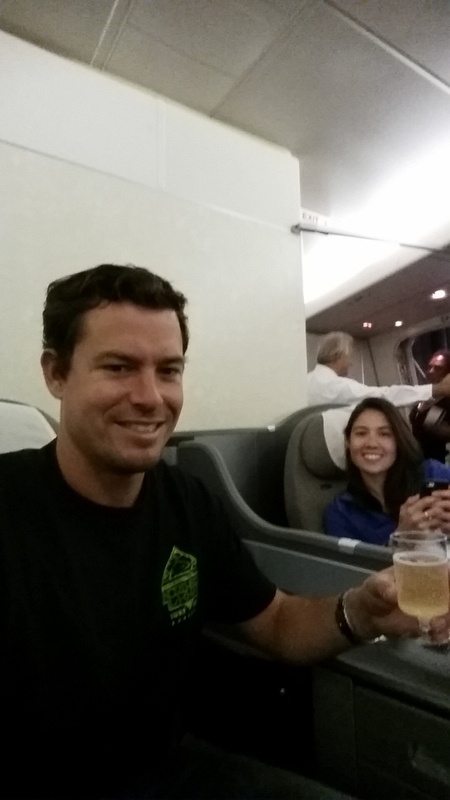 Unfortunately we weren’t able to upgrade Brandon’s mom, Diane, to global first as she booked an actual economy class ticket – that said, the head steward on our flight hooked up Diane with glasses of fine wine and champagne throughout the long flight! 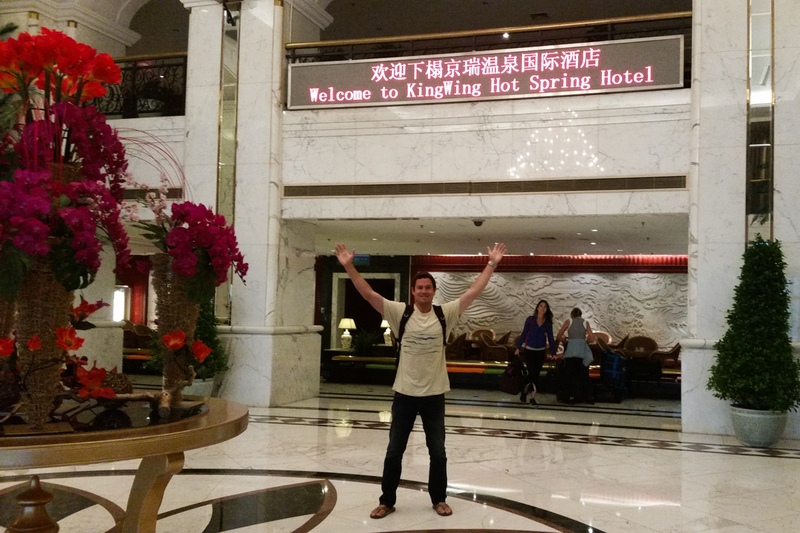 Once we arrived in Beijing, we were immediately picked up by the pre-planned tour guide at the airport. 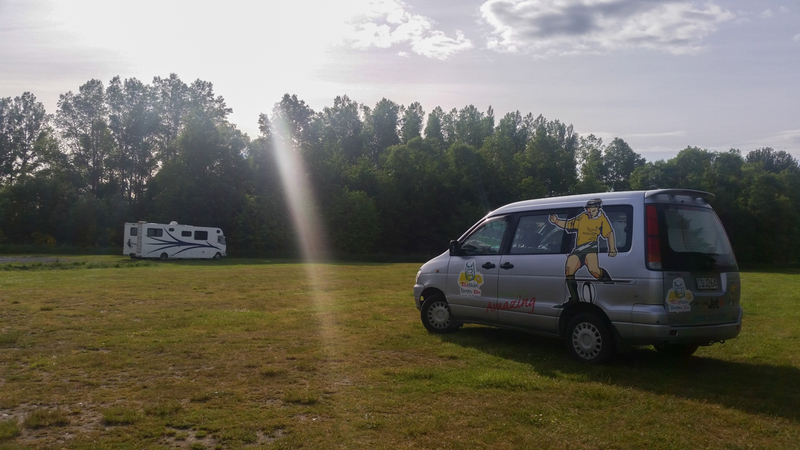 From there, we were escorted by a van to the simultaneously elegant and kitschy King Wing International Hot Spring Hotel, which would be our home for the next three nights. Global First champagne upon arrival to our seats! 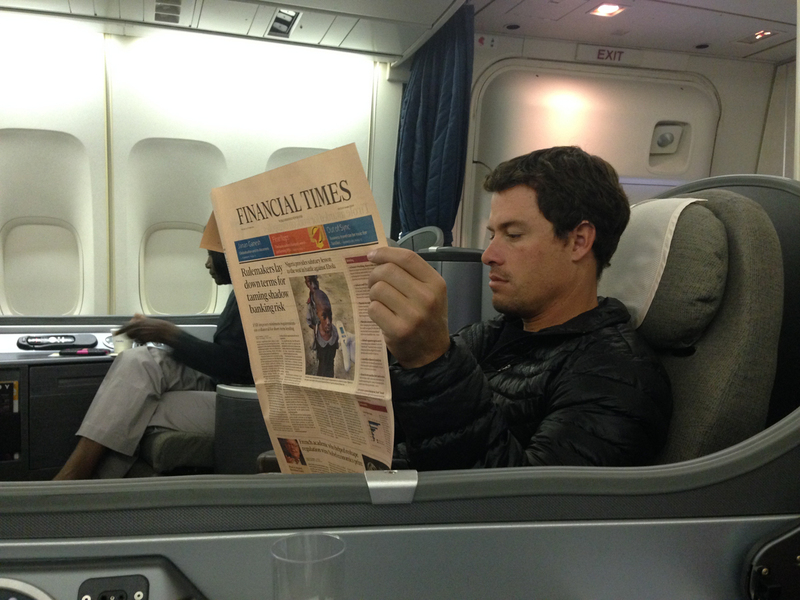 Brandon catching up on the business news. 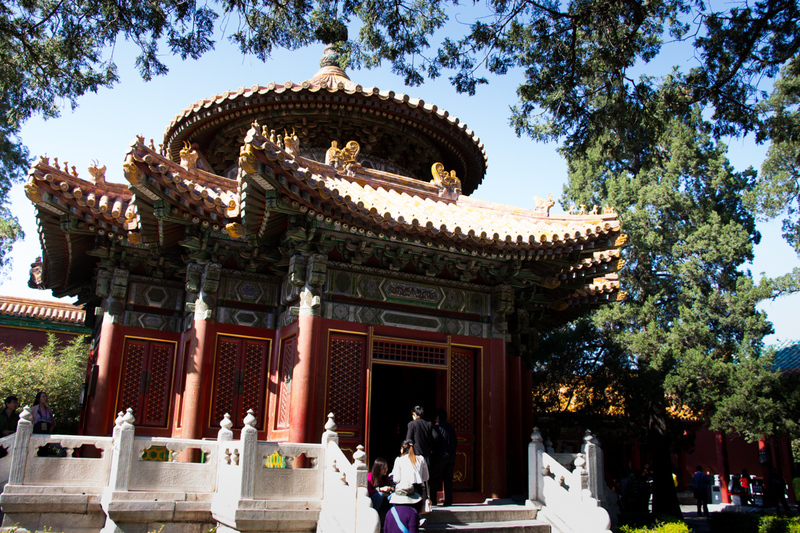 The following two days would be jam packed with Beijing tourist activities. The first day, Brandon, his mom and I (as jetlagged as we were) received our 6am wake-up call to start the day. 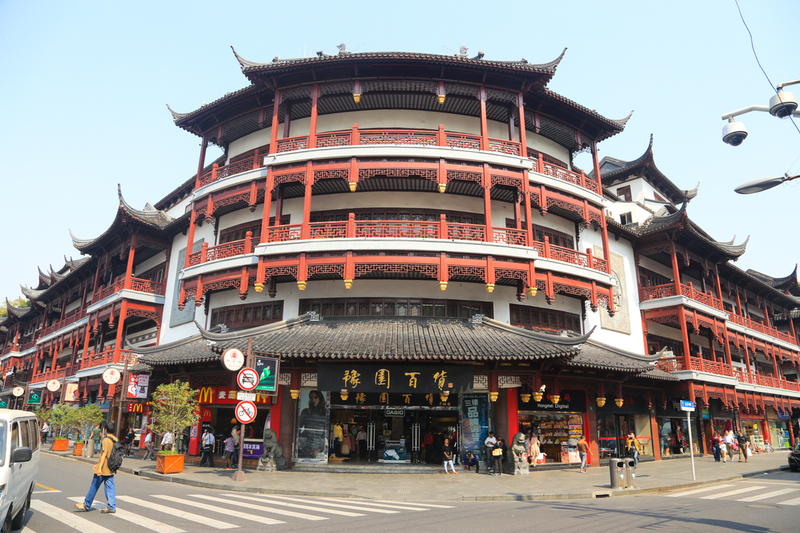 After an enormous buffet breakfast consisting of both East and West style foods, and several cups of coffee, we were loaded onto our tour bus and headed off to check out our first stop: Tian An Men Square. 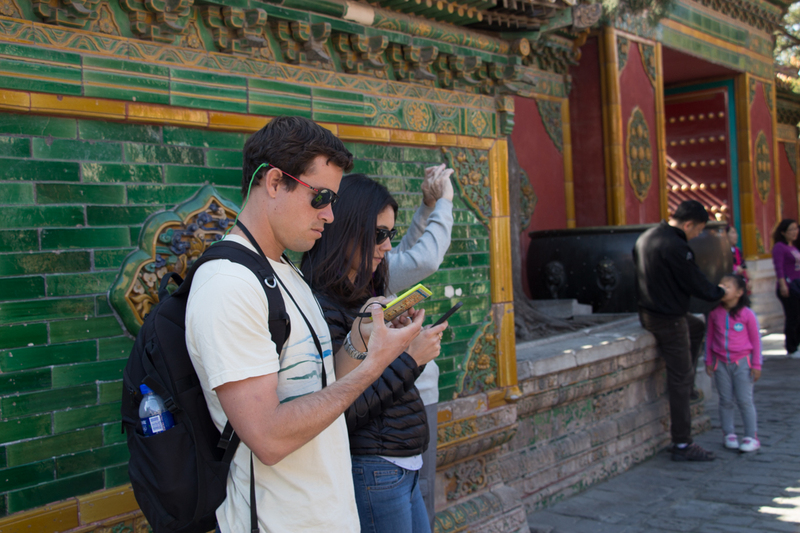 That same day, we visited the Forbidden City and the Summer Palace. In front of the Tiananmen Gate Tower, which serves as the main entrance to the Forbidden City and is characteristically adorned with a portrait of Chairman Mao. 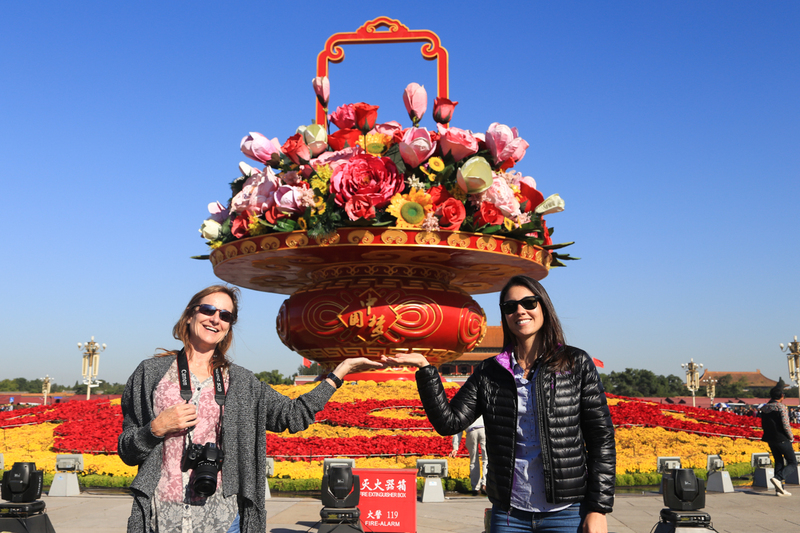 I’m not sure what this huge flower pot is in the middle of Tiananmen Square is supposed to symbolize, but Diane and I felt compelled to get a photo in front of it! 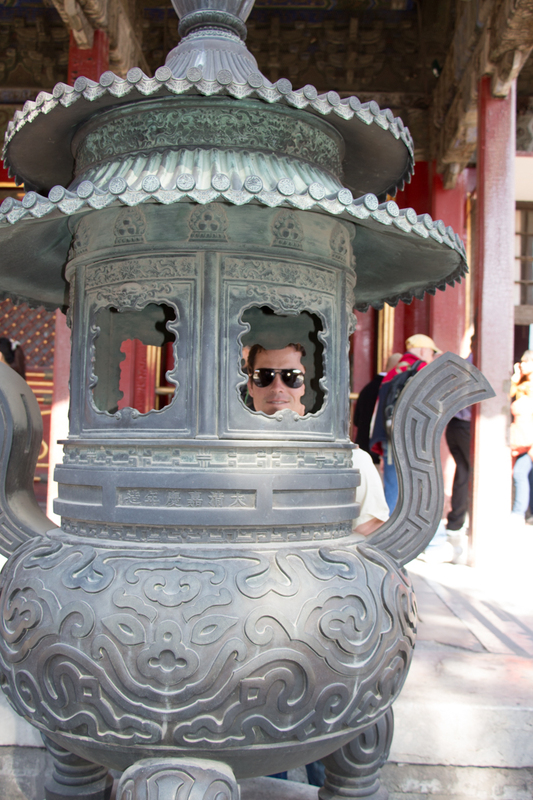 Brandon hiding behind an old and valuable sculpture of some kind. 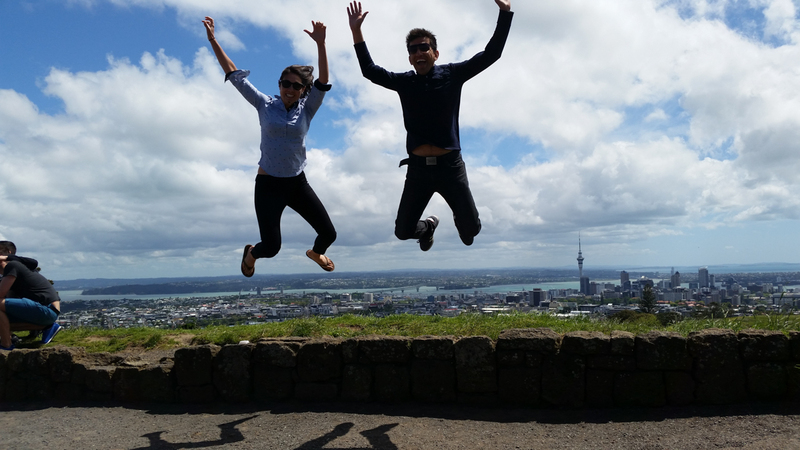 Hey Lauren Willis – Can you guess what those Chinese characters mean? … if you guessed “Starbucks” you’d be right! 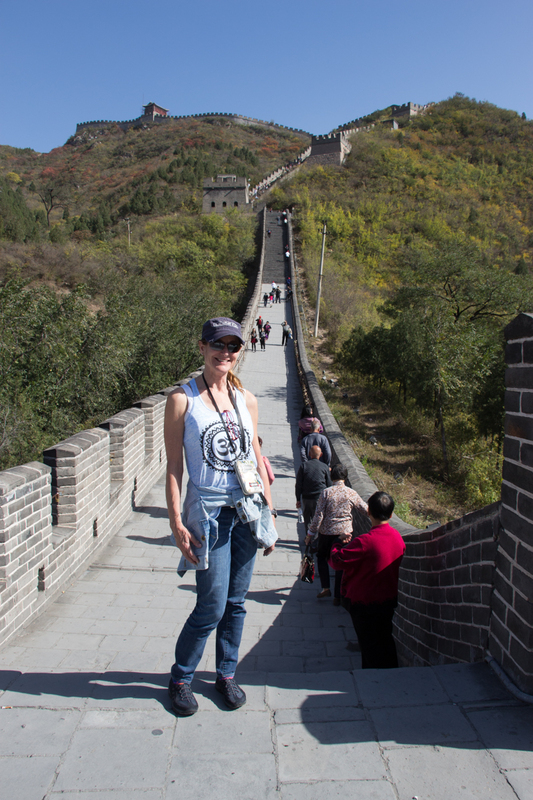 On day two, Diane and I went to visit a small section of the Great Wall about that was an hour drive outside Beijing. 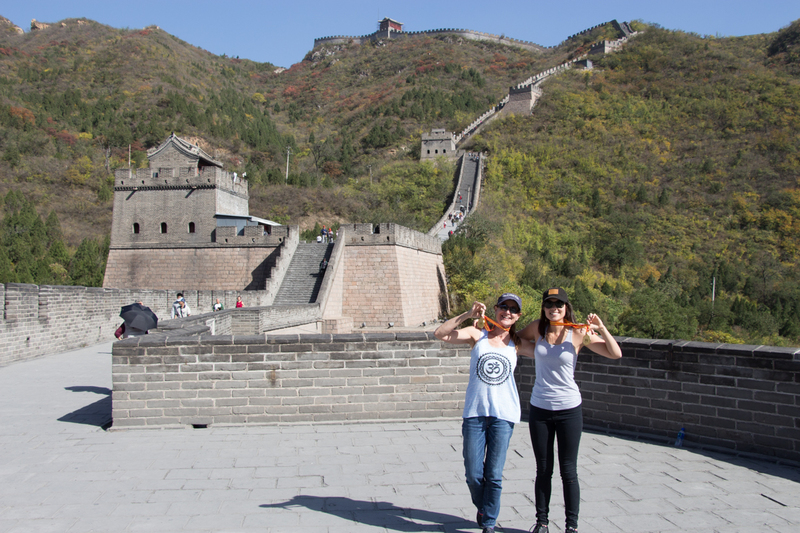 Diane and I climbed to the top of one section of the Great Wall and received personalized medals to prove it! We both agreed that heading down was much harder than walking up. 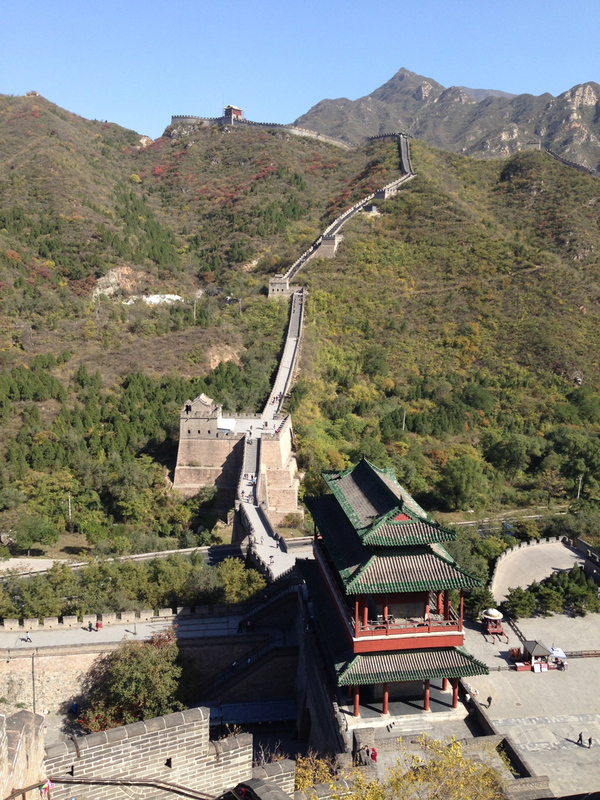 China has a famous saying about the Great Wall: 不到长城非好汉 (He who has never been to the Great Wall is not a true man). 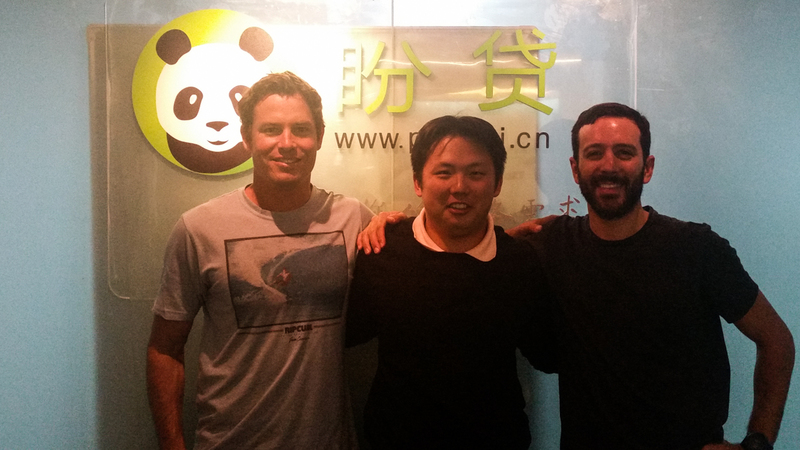 Brandon did not make it to the Great Wall with us that day 😉 He had prior obligations to meet his friend, Roger, who has been running a Chinese peer to peer lending business in Beijing. 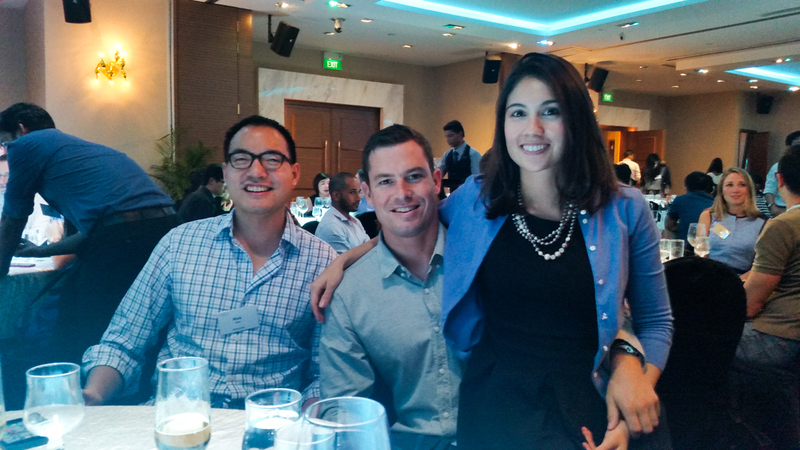 Brandon’s friend, Colin, also joined us in Beijing. The boys spent the afternoon nerding out and discussing the potential for business opportunities in China before an epic dinner of Beijing’s famous, Peking Duck. Diane and myself climbed all the way to the top of what you see in this picture and earned medals for our achievement! 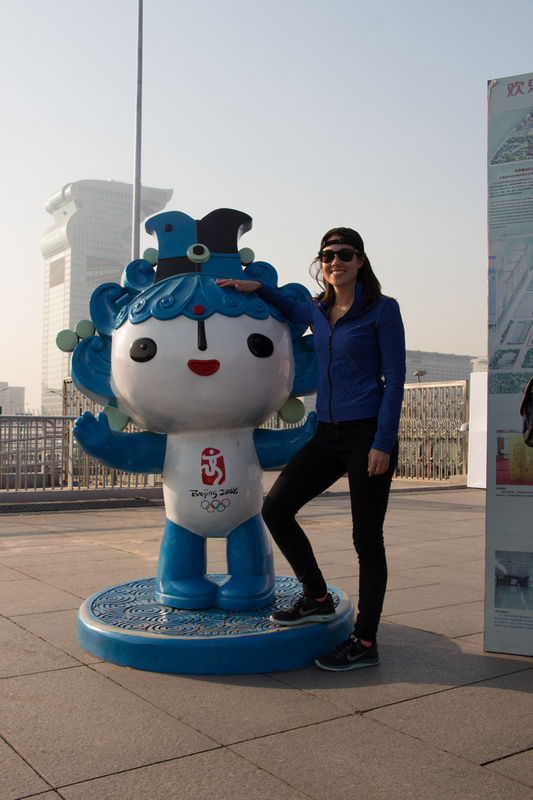 Me posing with the strange Chinese mascot for the 2008 Beijing Olympics. 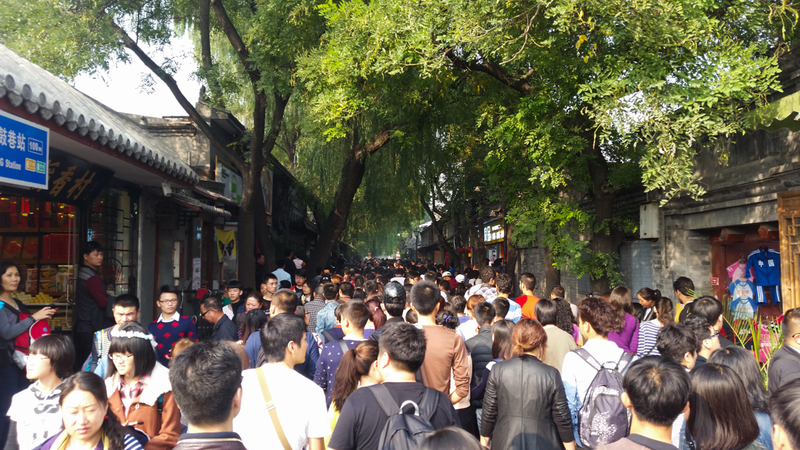 As with pretty much everyplace in Beijing, the classic Nanluogo Lane shopping street was completely packed with tourists. 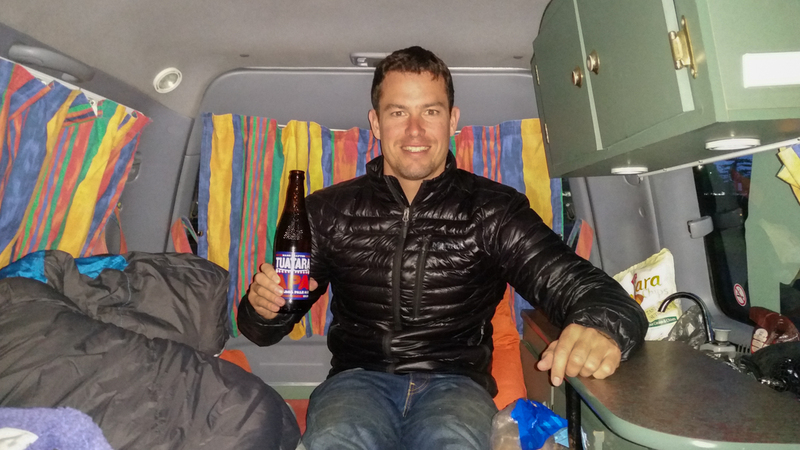 Brandon was happy to find a good beer spot to have a drink at! Found this guy all dolled up along Nonluogo Lane. 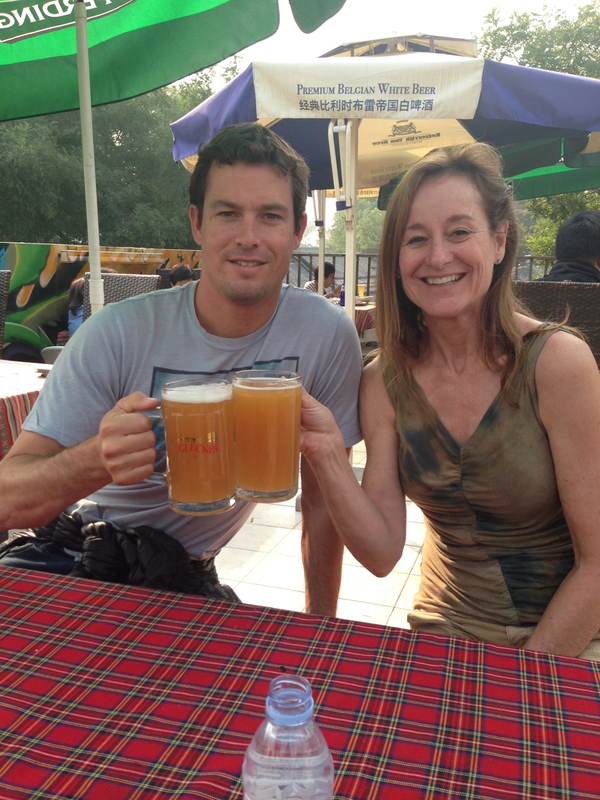 Brandon and Diane toasting to a refreshing beverage along Nanluogu Lane. 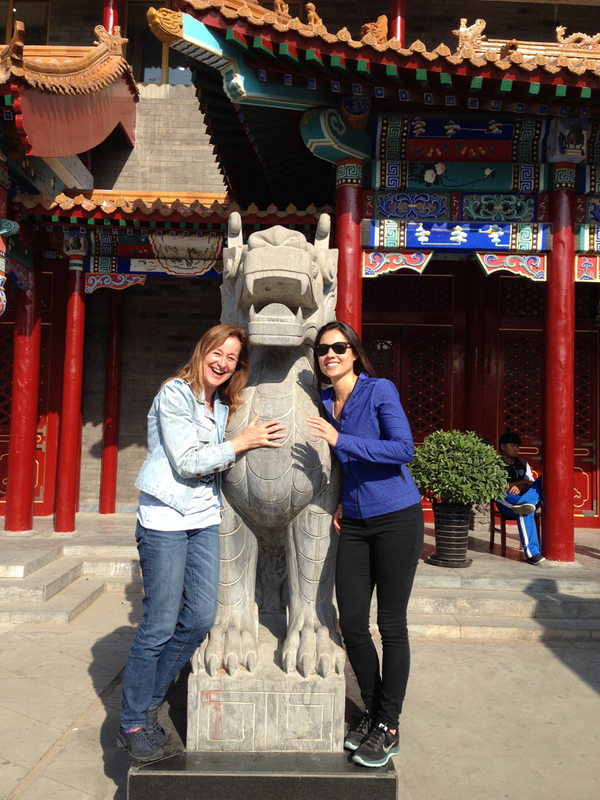 All in all, it was a fun and eye opening trip to Beijing. 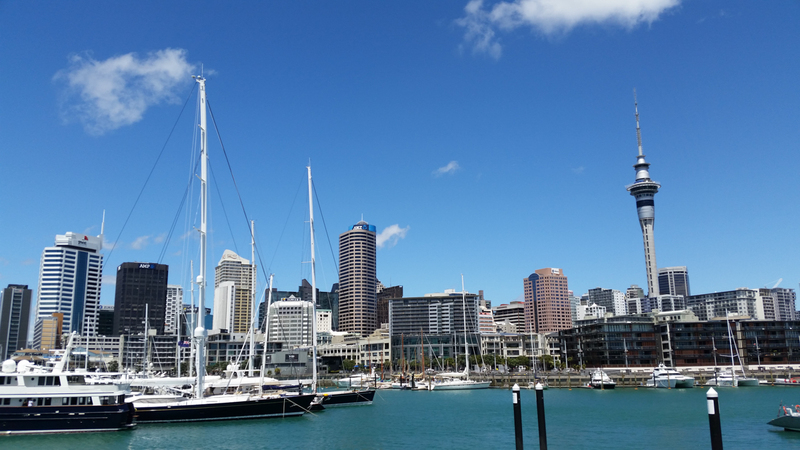 We were lucky with the weather – the first two days were blue skies! 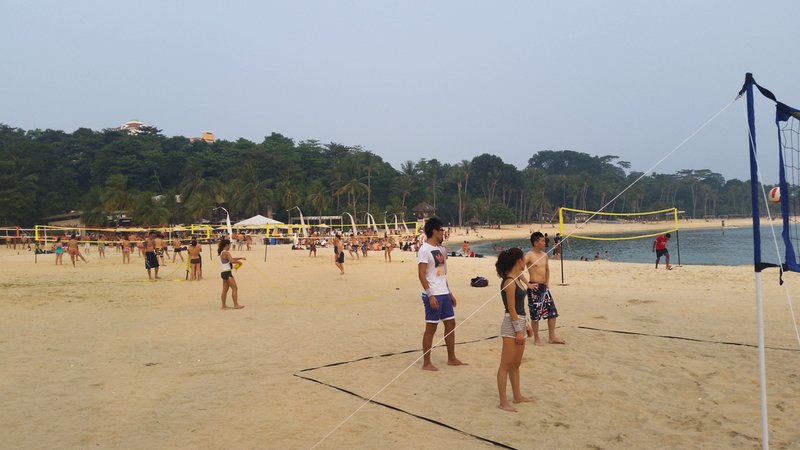 The pollution skyrocketed on the fourth and last day we were there (411 on a scale of 1000 – extremely hazardous). 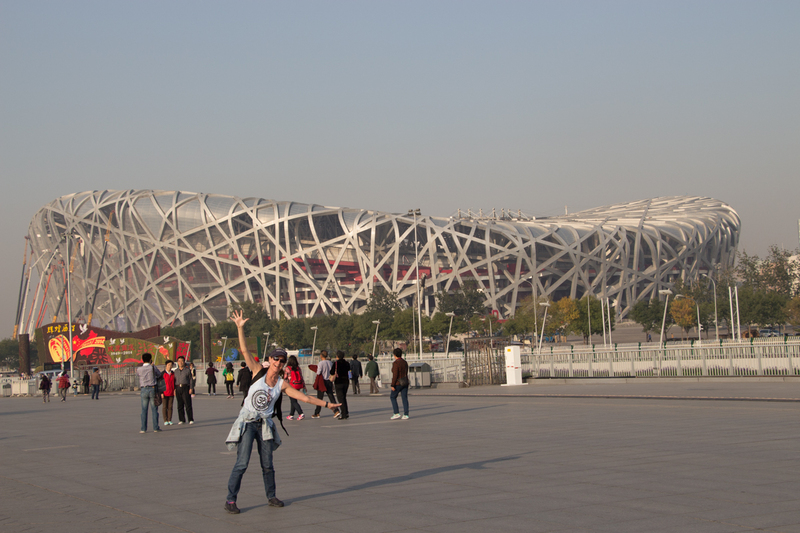 It also happened to be the day of the Beijing marathon… turned out that 80% of the runners didn’t finish the race. Although Beijing has a lot of character and thousands of years of history, the pollution makes it difficult to live there. 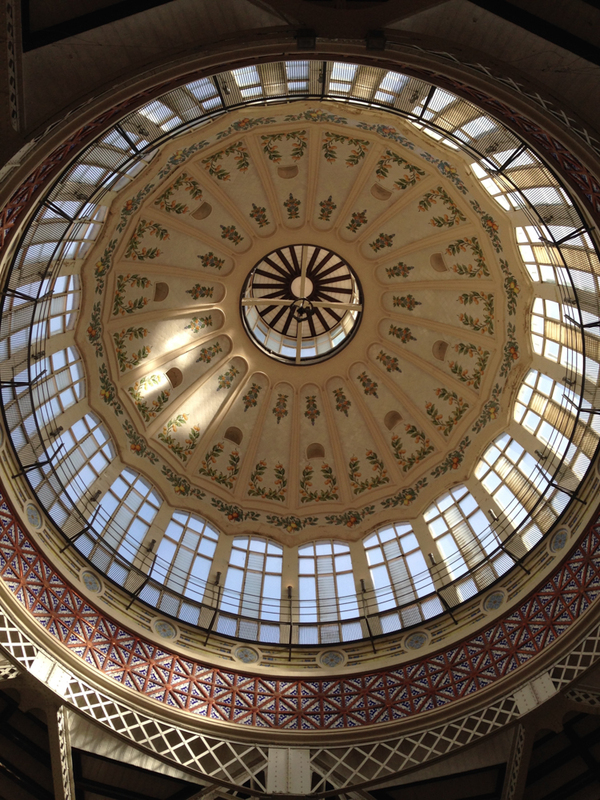 However, it’s certainly worth a visit if you haven’t been before! 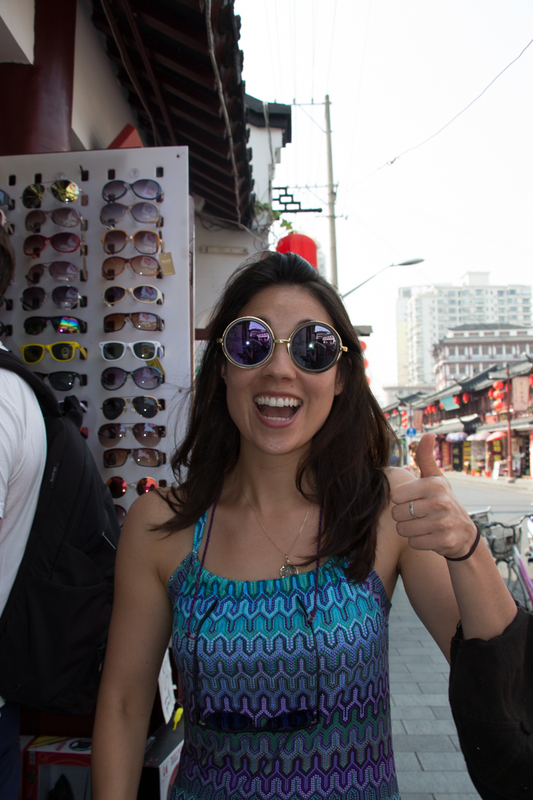 Our next stop along the tour de China was Shanghai. This place was my jam. 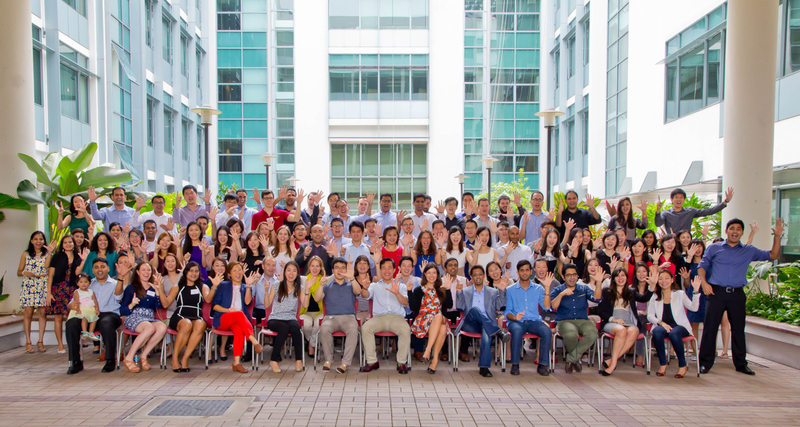 After having spent three and a half weeks in a future INSEAD classmate’s centrally located Shanghai apartment earlier this summer, it was the one city in China I sort of knew. I had only scratched the surface of the city in that time period, but I liked what I saw. 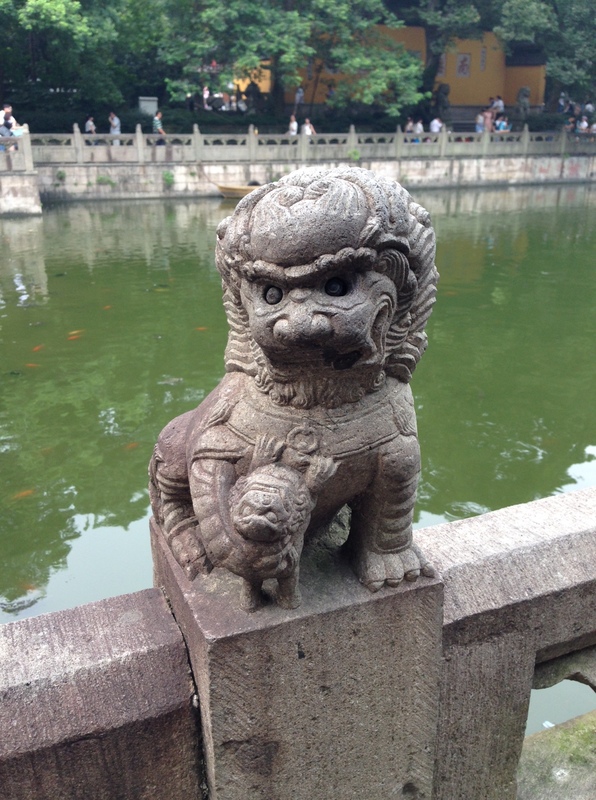 I had made great friends there who showed me the ropes and gave me a chance to experience the real Shanghai from the perspective of a young adult. These guys knew how to have a good time and it was my turn to show Brandon, his mom, Colin and my mom, who I was most excited to show the new Shanghai! Bullet Train station in Beijing. 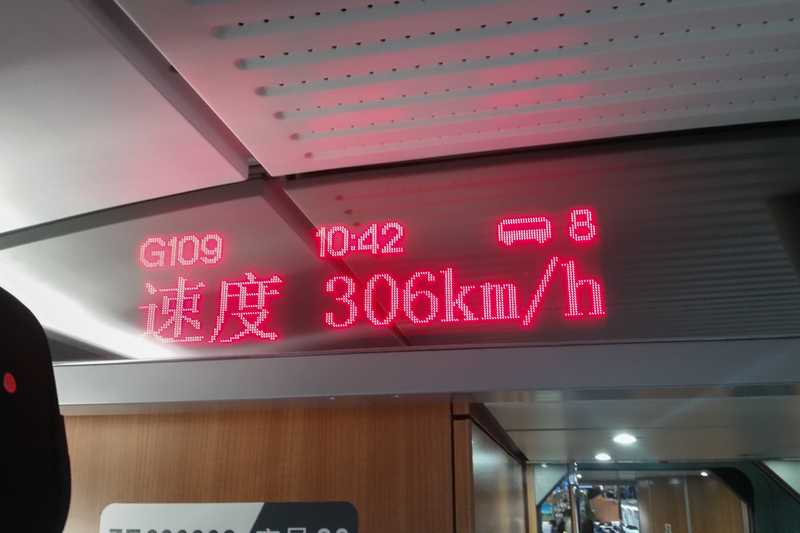 The bullet train brought us from Beijing to Shanghai at a cool 306 km/h. That’s 190 mph. 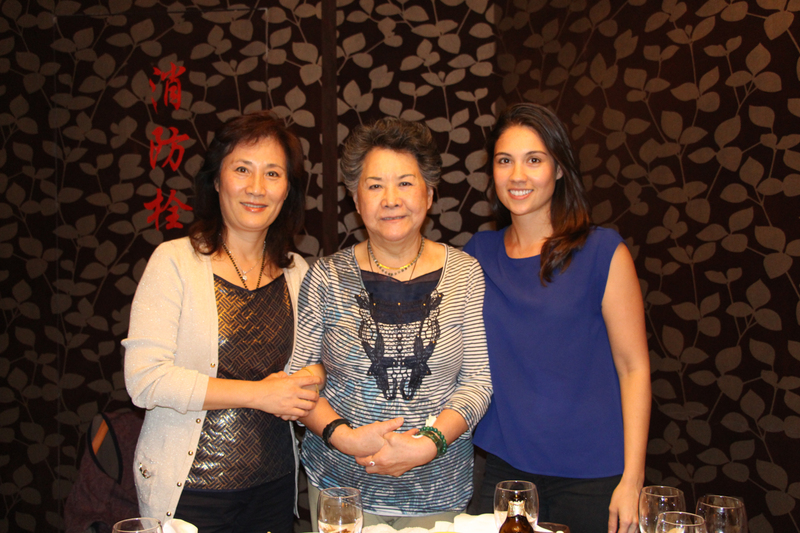 My mom was born and raised in Shanghai from the mid 50’s – late 70’s before moving to Hong Kong and ultimately New York with her family. It goes without saying, her city has undergone such massive changes over those years that, were it not for street names remaining the same, she wouldn’t have recognized her childhood neighborhood! 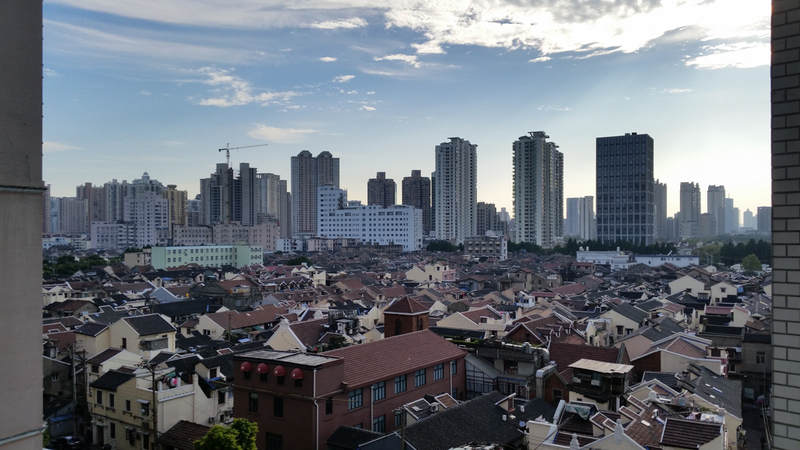 It was a strange feeling to know more about my mom’s hometown than she did, but that simply shows how rapidly Shanghai has developed in the last couple of decades. 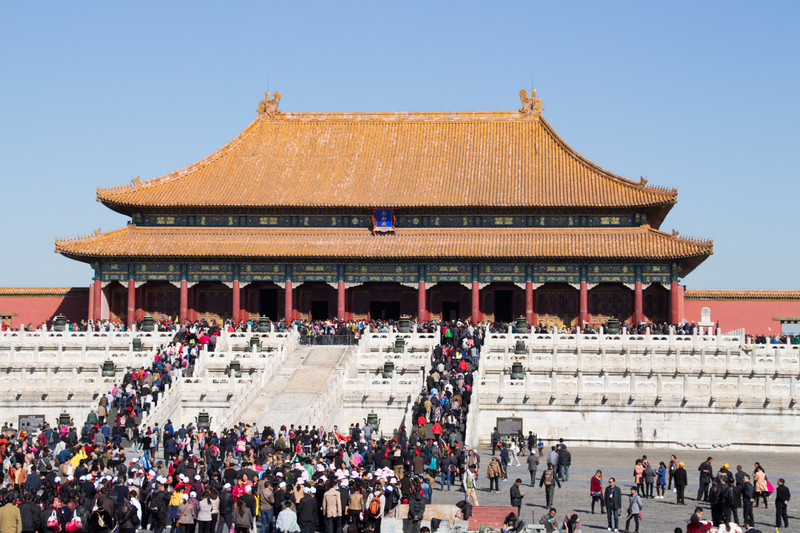 It’s now considered the business capital of China with a population growth rate of 20% per year. At that rate, it’s no surprise that high rises and retail shops can be seen for miles on end in every direction you look in Shanghai. 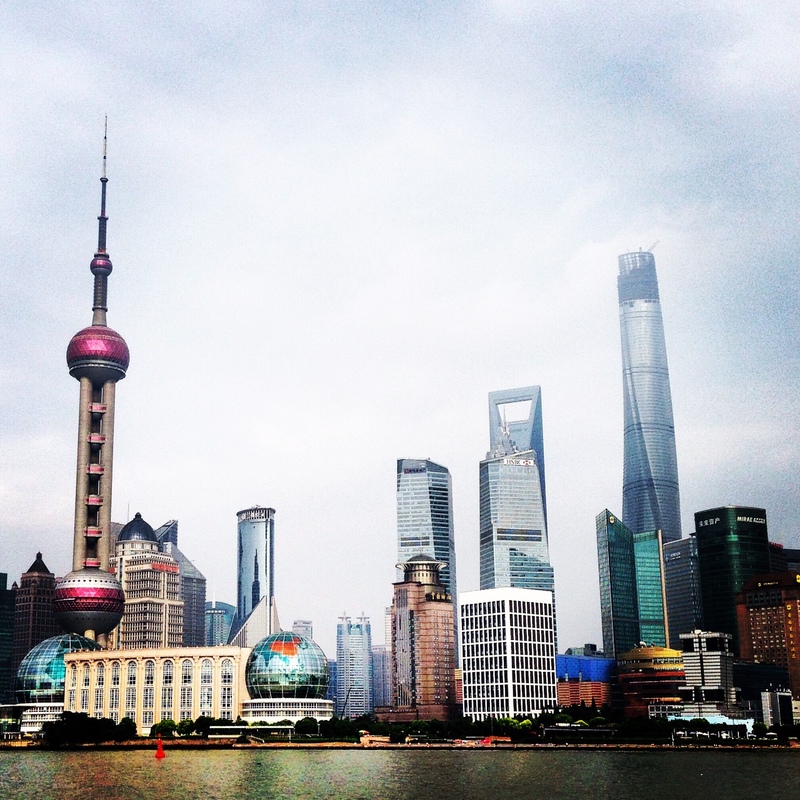 The classic view of the Pundong business district which sits just across the Shanghai Huangpu River from The Bund. 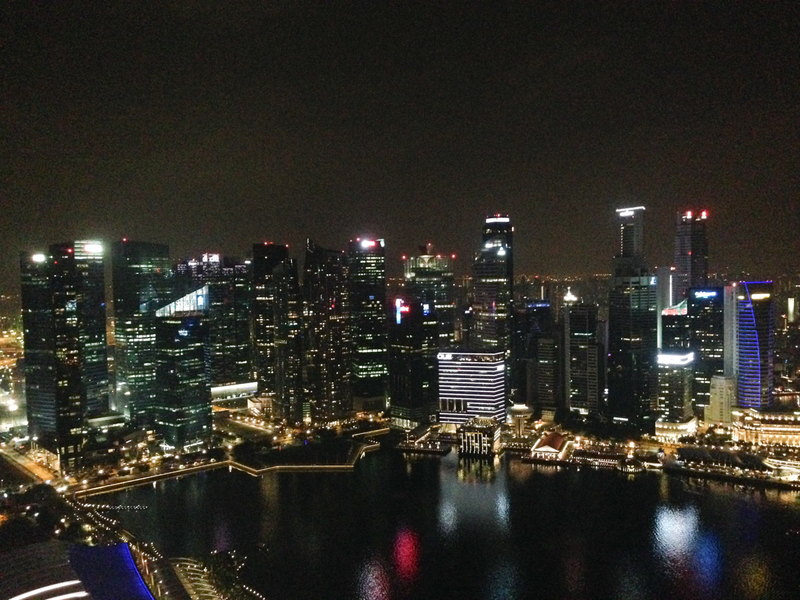 None of those high-rise buildings existed when my mother lived in Shanghai 30 years ago. We lucked out on our Airbnb accomodations in Shanghai, staying in a 4 bedroom luxury apartment overlooking the famous skyscape, The Bund. Every morning my mom picked up hot Chinese breakfasts for us all before we went exploring the city. 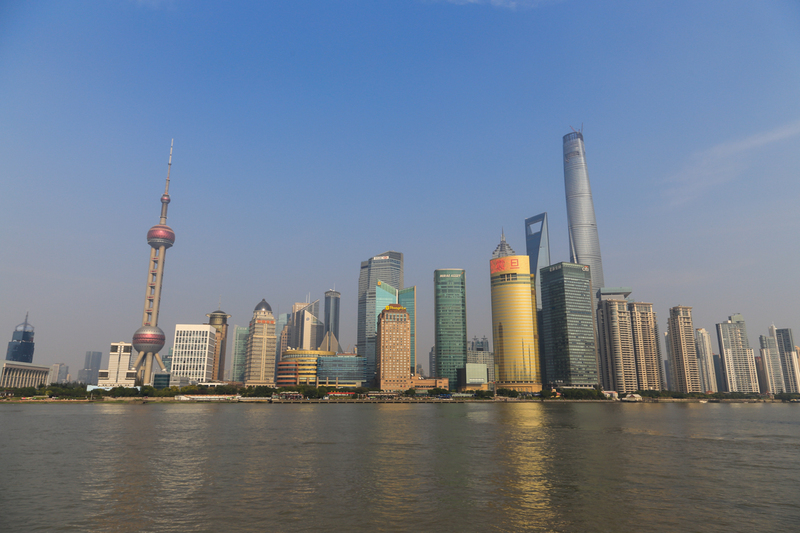 We took pictures along The Bund, rode a ferry across the river to Pudong, walked through Old Shanghai, and checked out an aggressive fake market where you could buy everything from faux-(ro)lexes and drones to iPhones and chopsticks. At one point, we found Brandon getting chased down the aisle by a fake rolex merchant after a negotiation went wrong. 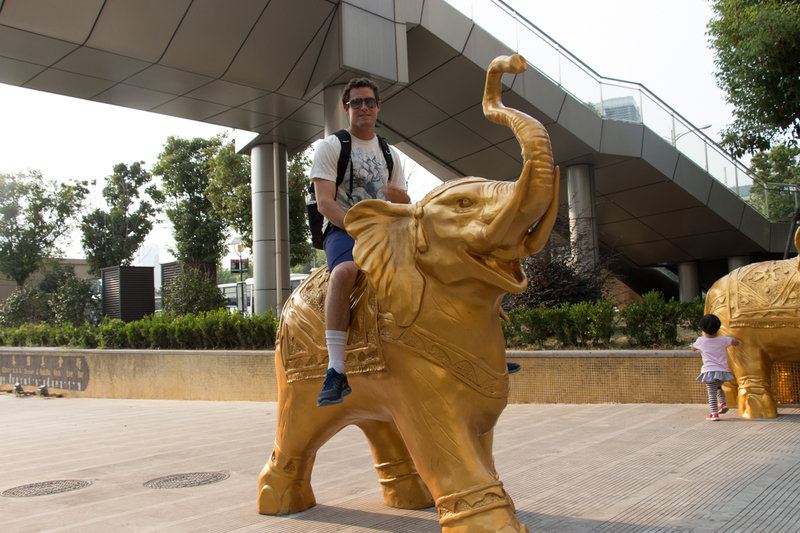 The price started at 600rmb ($100), but Brandon asked for 150rmb ($25), at which point the chase commenced. Brandon won the negotiation, but ultimately lost in the end when two out of four of his fake rolexes stopped ticking under 30 minutes after the purchase. 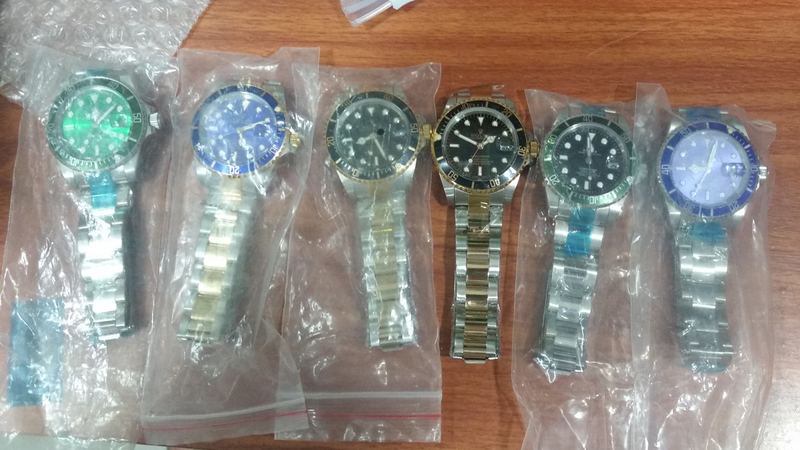 Luckily he was able to get a refund for the two broken Rolexes! 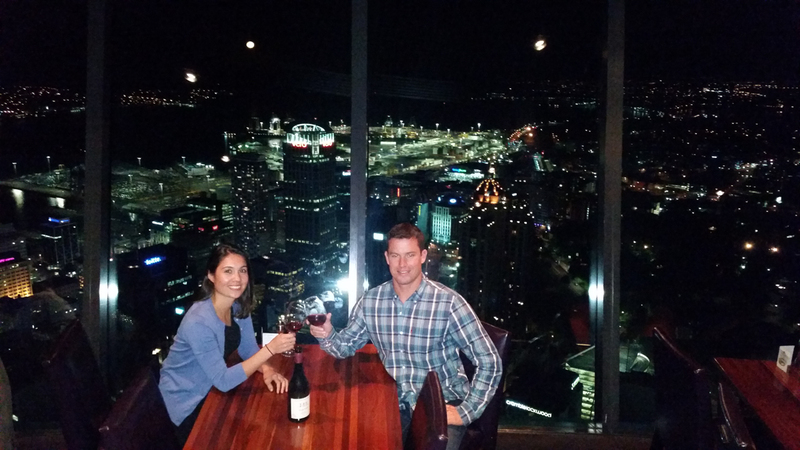 We were on the 8th floor of this luxury apartment building thanks to AirBnB! 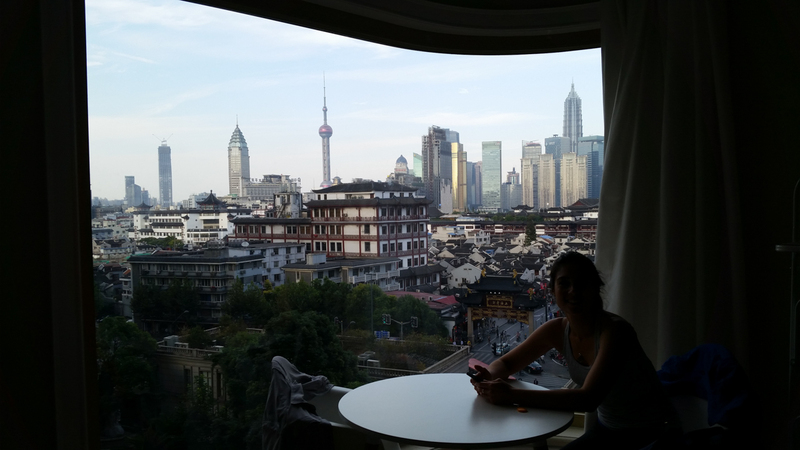 The view from the breakfast nook inside our Shanghai luxury pad. 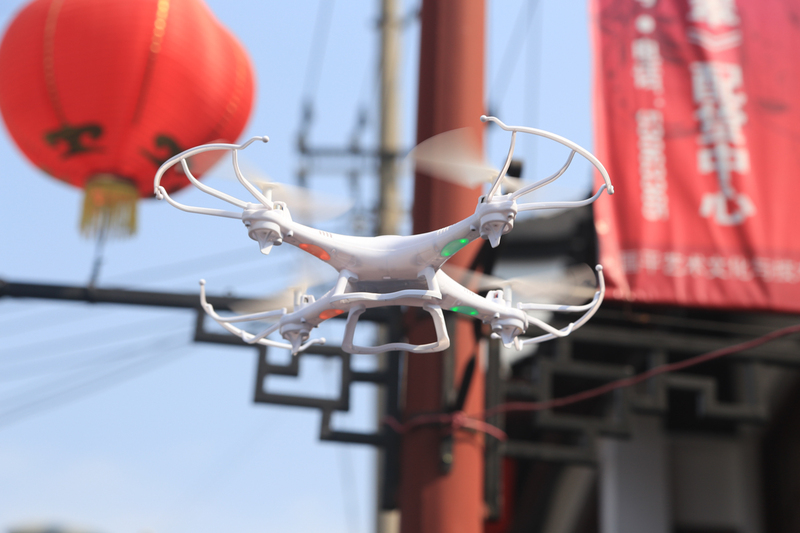 Brandon and Colin found these drones for sale in Old Shanghai and bought 2 of them, plus 5 extra batteries. They provided hours of entertainment. 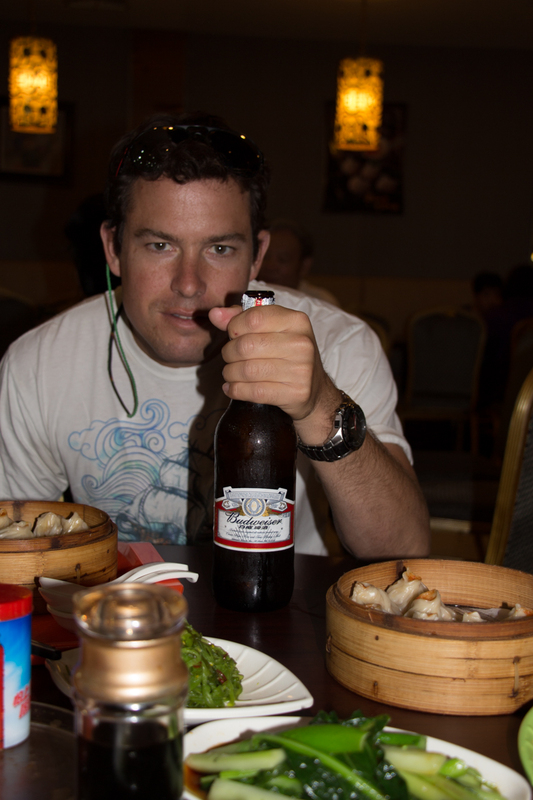 It cracked us all to see that Budweiser is still one of the beers of choice in China. 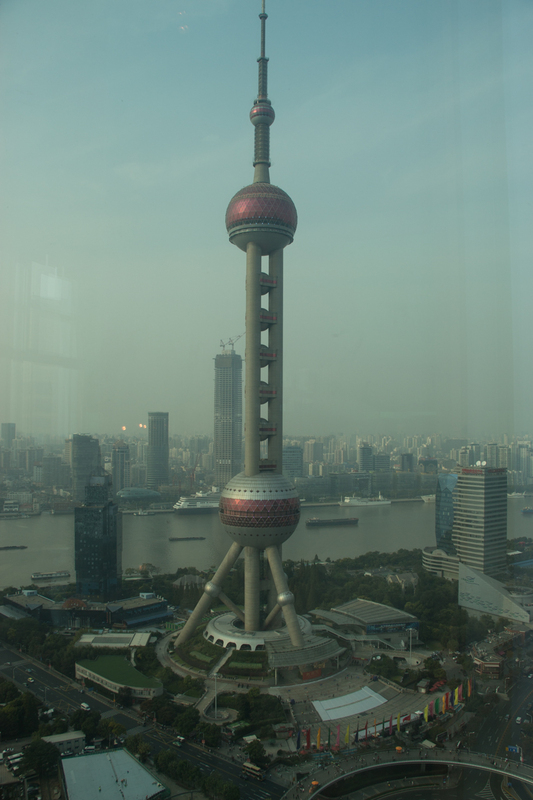 View of the Oriental Pearl Tower from the 38th floor of the Shangri-La Hotel. 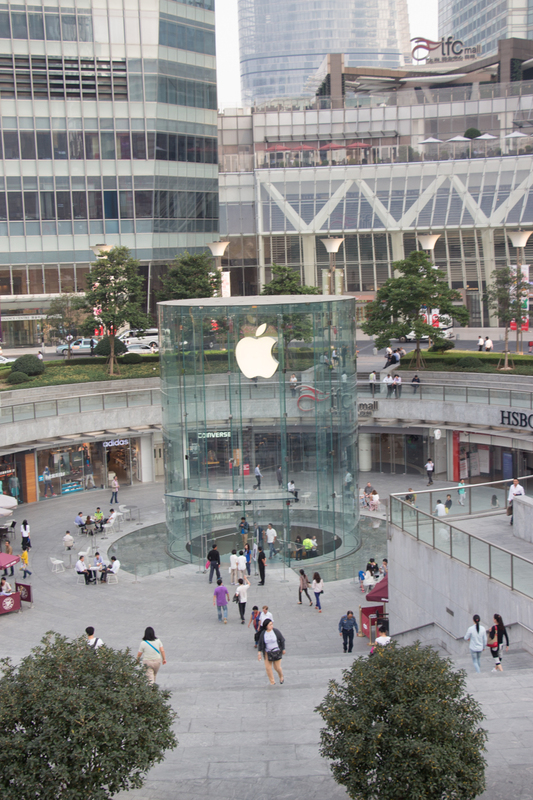 At the center of the biggest mall in Pudong… you guessed it, an Apple Store! 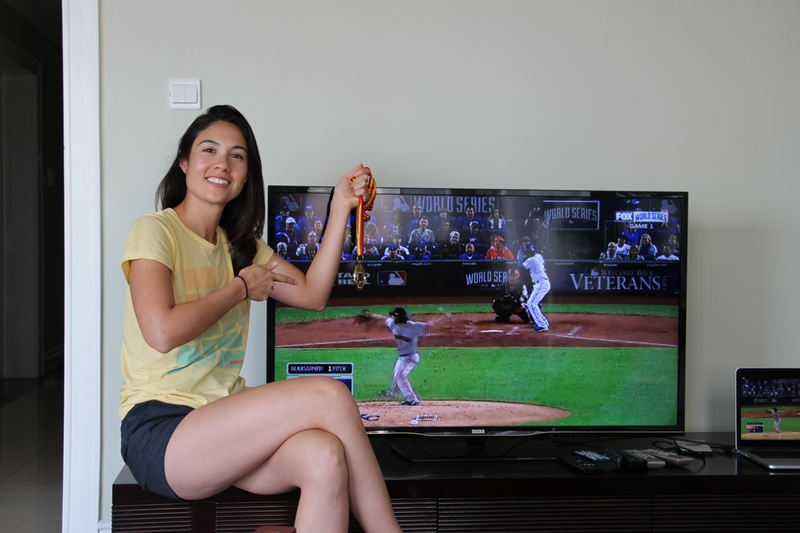 With the San Francisco Giants in the World Series, Brandon got to work hacking the Great Firewall of China and getting an MLB.com post-season package so that we could stream the game live to the TV in the Shanghai apartment! Group Pic after the amazing acrobatics show! Brandon and me under the spot light at a movie premier my friends got us into during fashion week in Shanghai! Movie premier with famous Hong Kong actors who we didn’t know – we got into the premier with badges that said we were working for my friend’s ad agency! 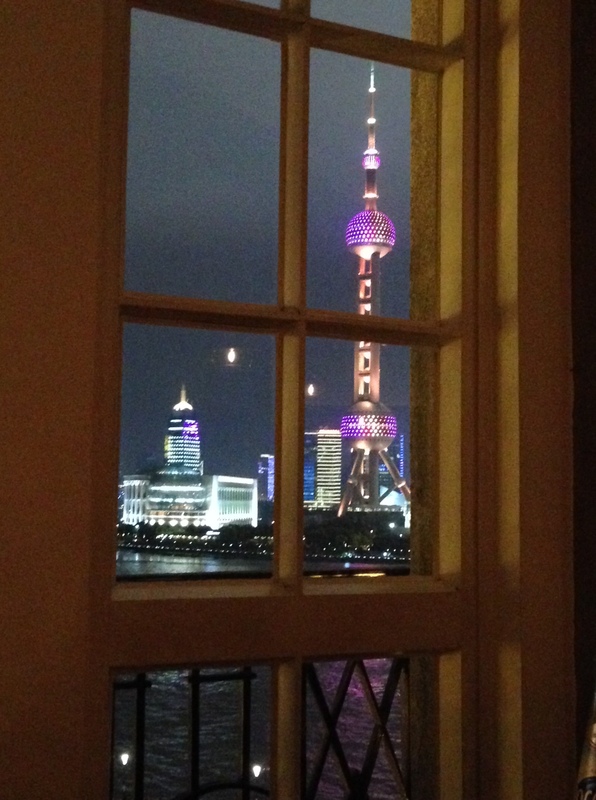 Other highlights of Shanghai include an impressive acrobatics show after dinner at the famous Old Jessie restaurant. 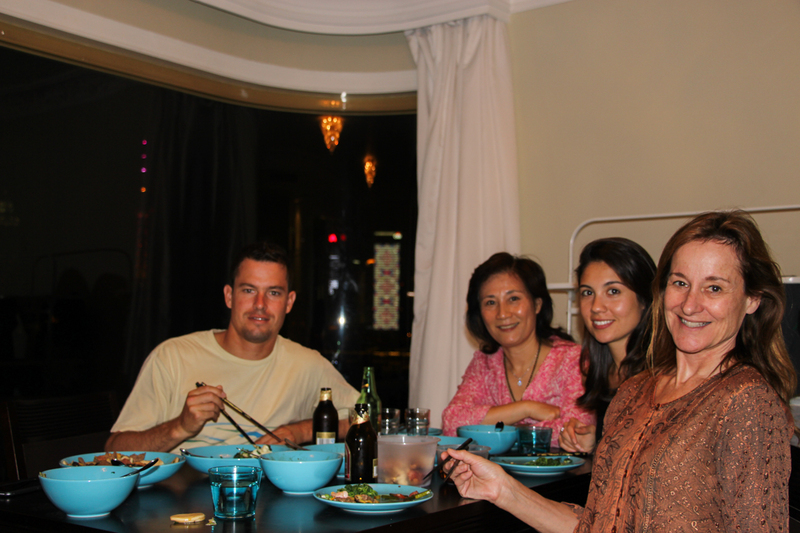 My mom also made a Chinese feast of epic proportions for us all one night at the apartment. It was then that Brandon realized I should be a good cook given my roots, but I haven’t yet shown him my capabilities. Thanks to my mom, the bar is now set quite high! On one of our final nights in Shanghai, my uncles Jack and Franck, treated us to a delicious dinner at Jade Garden restaurant in Xin Tian Di, which is a very trendy area of Shanghai. 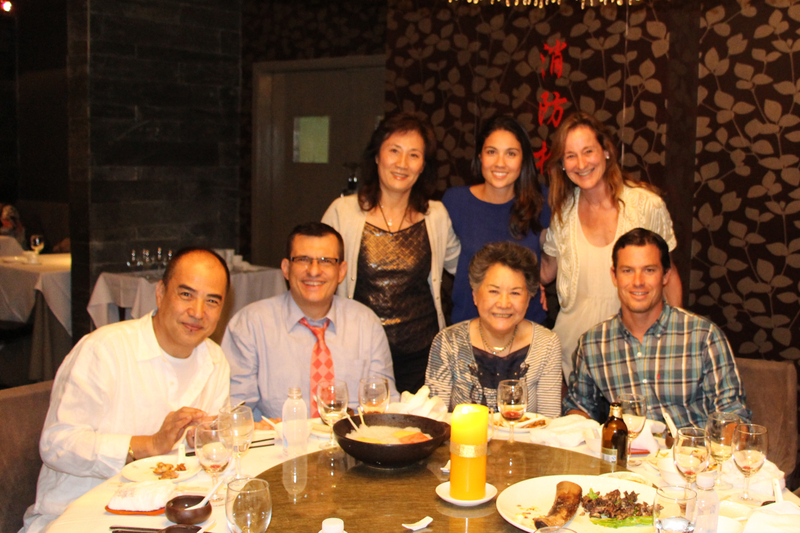 The entire family was together to enjoy each other’s company over good Shanghai-style food and wine that I had brought from California. It was great to see Jack and Franck. Brandon and I will be seeing more of them next year in Paris as they spend quite a bit of time in France. 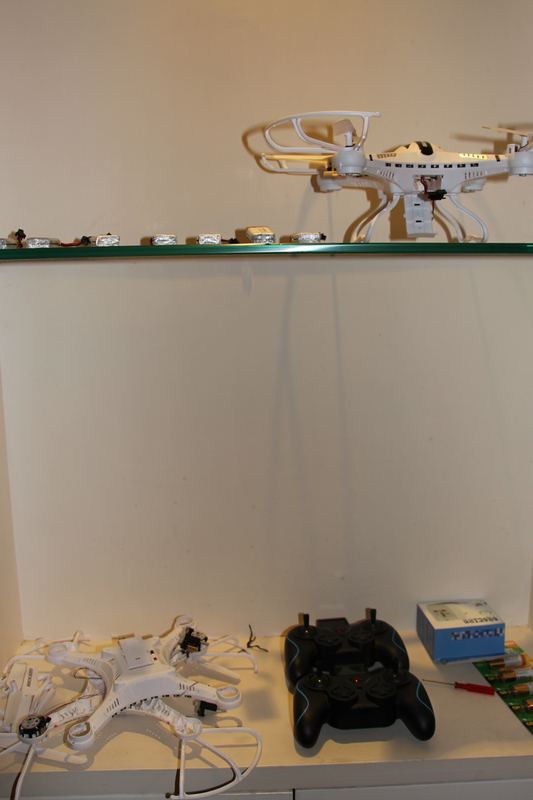 These were the two drones that Brandon and Colin bought. The one on the bottom was the first one purchased and eventually broke due to constant abuse at which point Brandon dissected it to see how it was built. 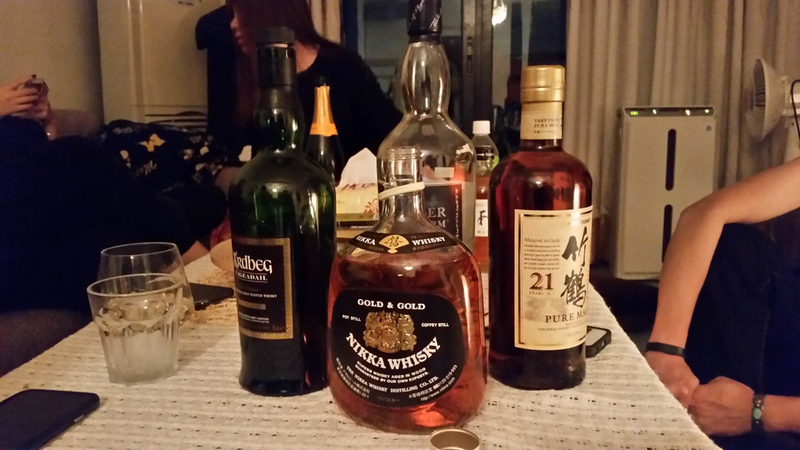 On our last evening in town we stopped by my friend Monnie’s apartment, where I lived when I was in Shanghai the previous month, and enjoyed the whiskey and company of Monnie and a few of her friends! 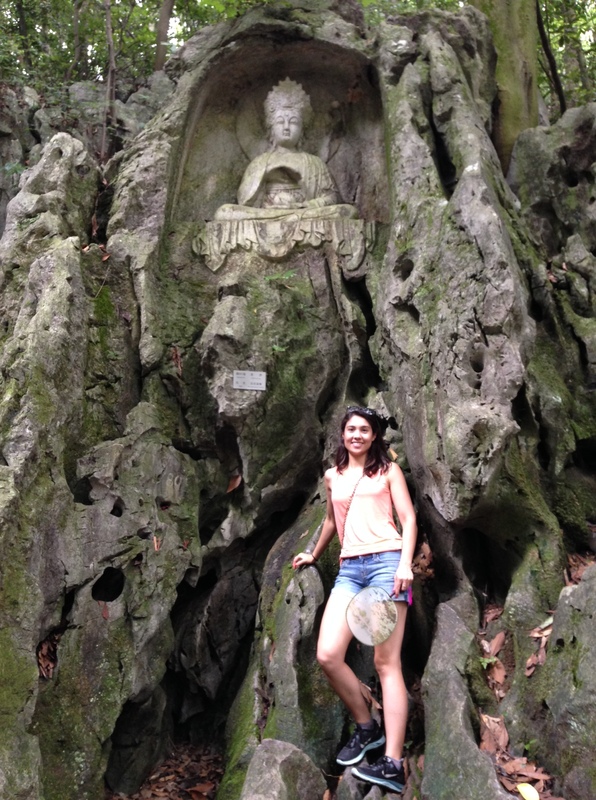 We left Shanghai for Zhangjiajie with many wonderful memories of the city and of the time we spent with family there! 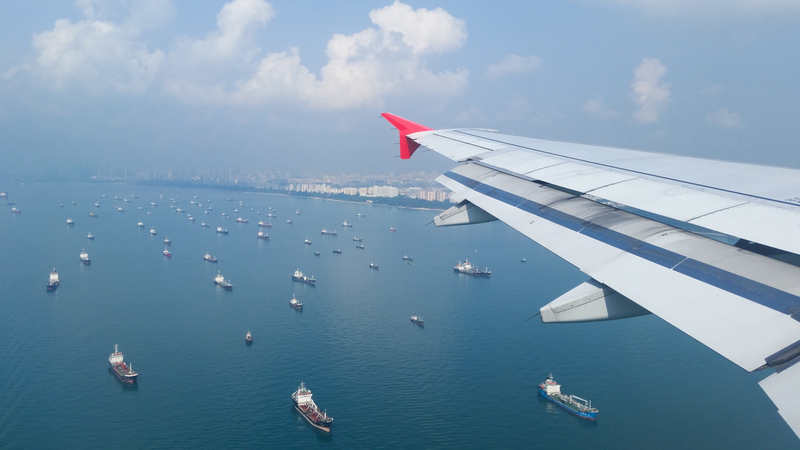 I decided the most efficient and guaranteed way to brush up on my Mandarin speaking, writing and reading skills was to leave South America early and move straight to the heart of China’s largest commercial city. I flew back to SF for 42 hours to pack my bags for Shanghai. 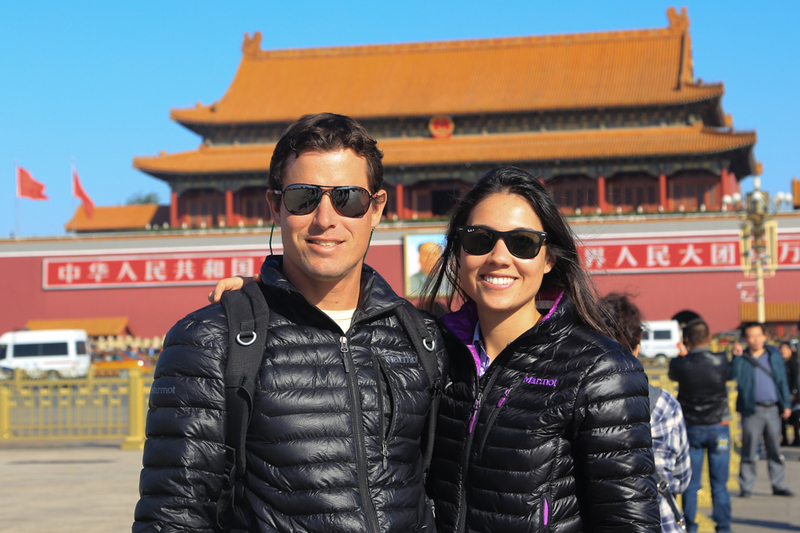 Although it wasn’t my first choice to skip out on exploring Chile with Brandon, in the end, the impromptu visit to China paid off. 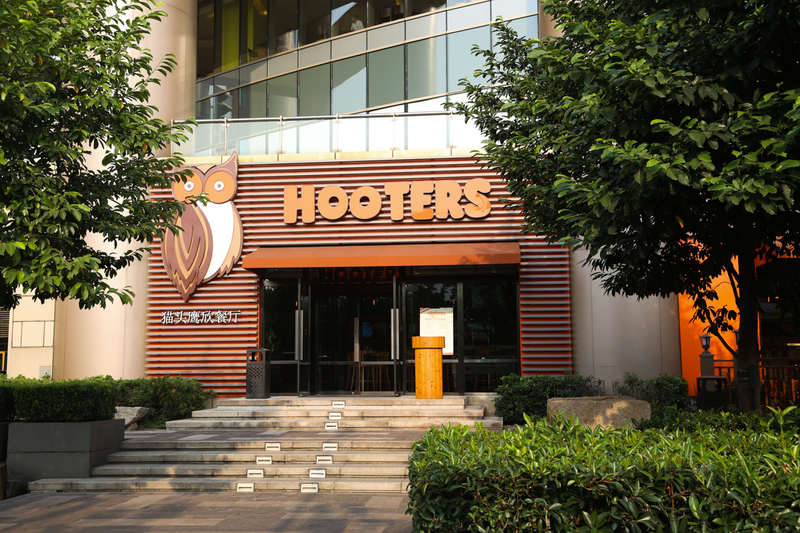 Shanghai is an incredibly vibrant, international and vivacious city where you can get just about anything you want at your fingertips. 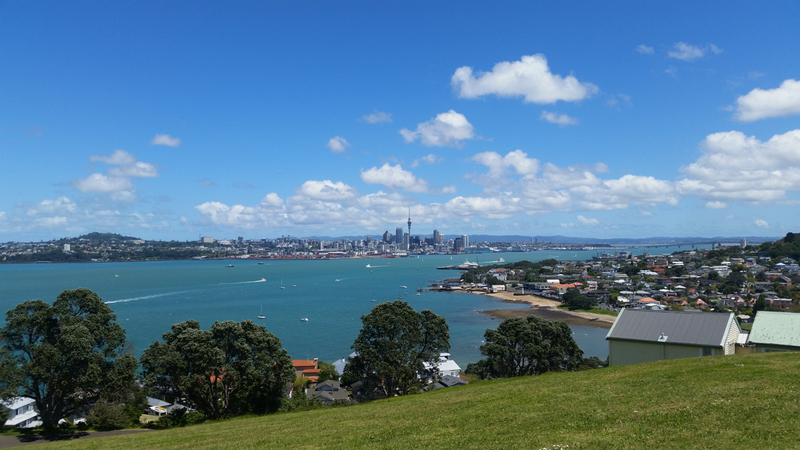 I was fortunate enough to explore a small fraction of the city over the past 3+ weeks. 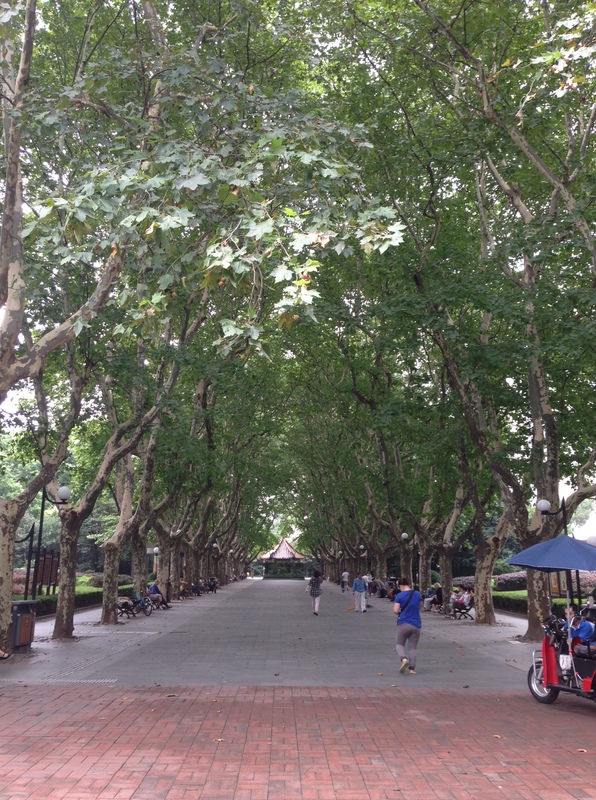 The greenest street I saw in Shanghai happened to be just down the street from my apartment! To be honest, I thought these were going to be a rather mundane and tedious few weeks of re-learning how to read and write Chinese. It turned out to be everything but dull and redundant! 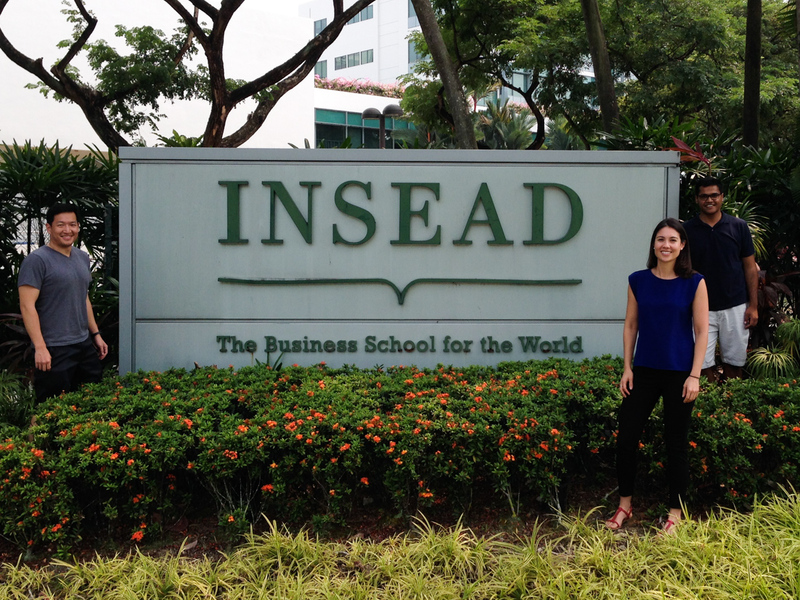 A few days before arriving in Shanghai, I had reached out to Jacqueline, a future INSEAD classmate living in Shanghai, on Facebook to see if we could meet up during my visit. Ironically, she would be traveling to Argentina at that time, but she so generously offered for me to stay in her room in Jing’An, Shanghai – essentially as central as it gets in Shanghai! Her roommate, Monnie, was the first person I met in Shanghai, and she couldn’t have been more welcoming or well connected in Shanghai, having moved there two years ago from Hong Kong. Monnie also had one of her good friends, Melissa, staying at the apartment for two out of three of the weeks that I was in Shanghai which was a treat for me. 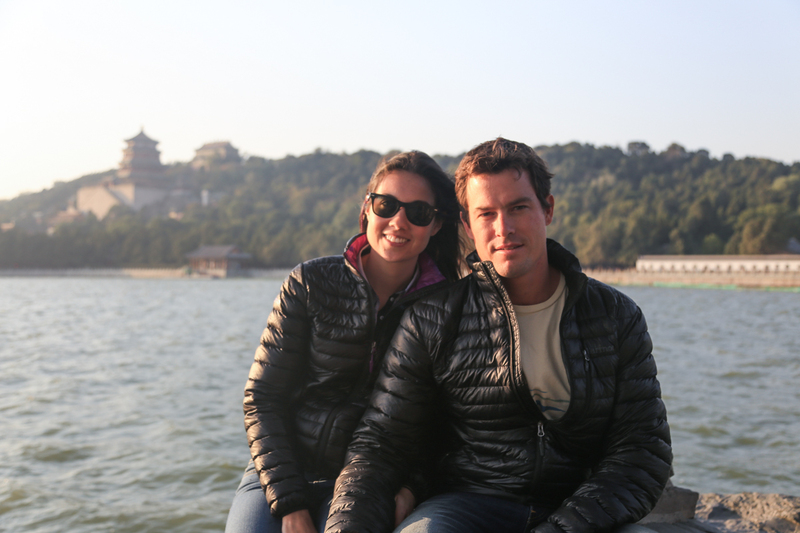 Melissa and I would spend hours chatting in Mandarin and exploring Shanghai – mainly she was correcting my poor grammar and laowai enunciation – through her, I learned a lot about life in Shanghai and China. And finally, our last roommate, Tanaka-San, was always excited when we decided to have a low key night at home. 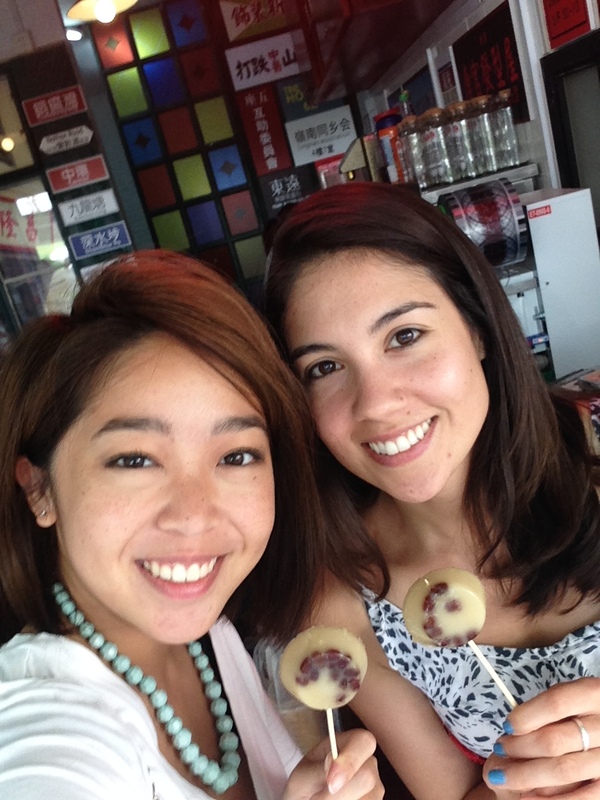 My roommate, Monnie, and me enjoying a Hong Kong styled desert on our way home! 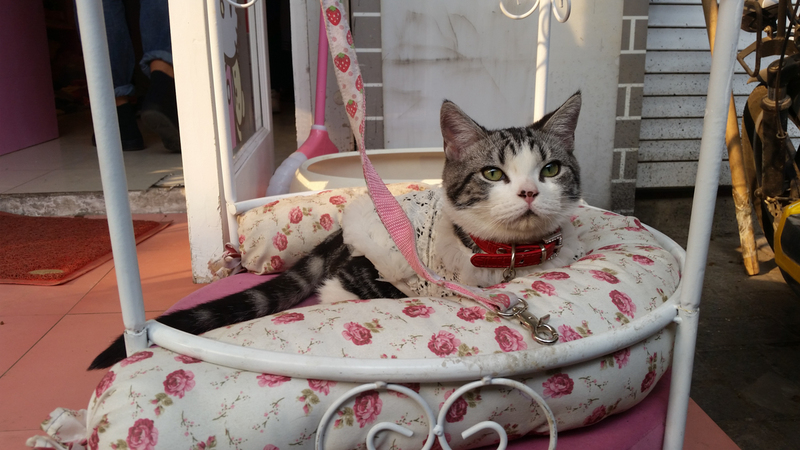 Tanaka-san, doing what she does best in her comfortable Jing’an apartment – lounging. 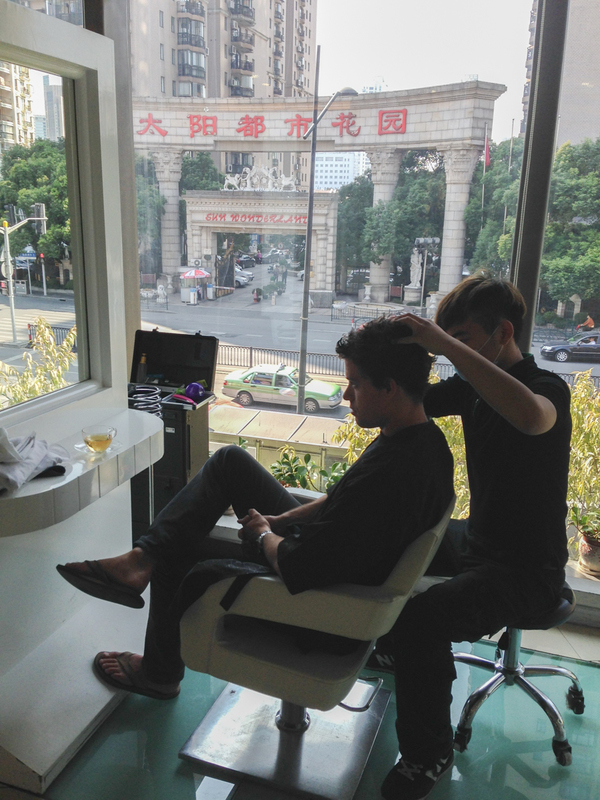 After taking one day to settle into Shanghai, intensive Chinese classes began. I spent the first four hours of each weekday in a Mandarin school called Miracle Mandarin, which I found through a simple Google search online. The 30 minute walk to and from class was a daily battle between the endless cars, scooters, bicycles and flexible traffic laws, which I’m happy to report I won simply by surviving! 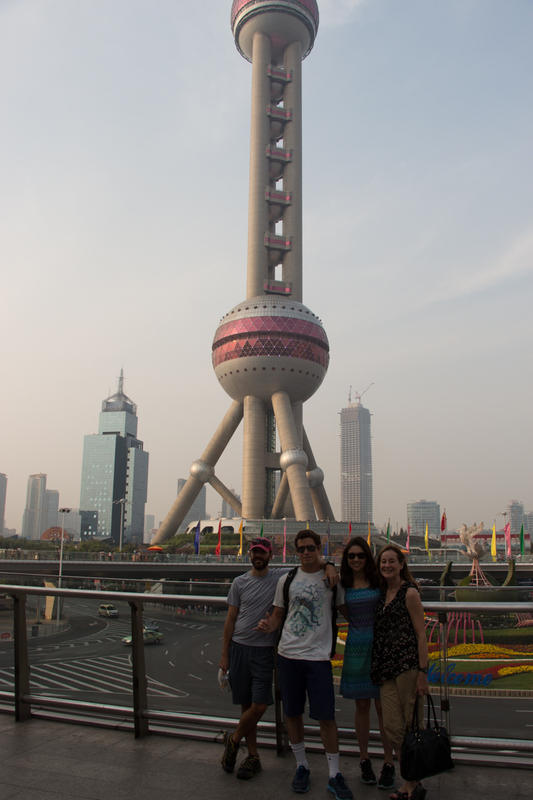 In addition to learning Chinese reading/writing at a rapid pace, I met a few new friends at the school from Germany, England, Venezuela, Indonesia, Brazil and Spain who were fun sidekicks to explore the touristy aspects of Shanghai. 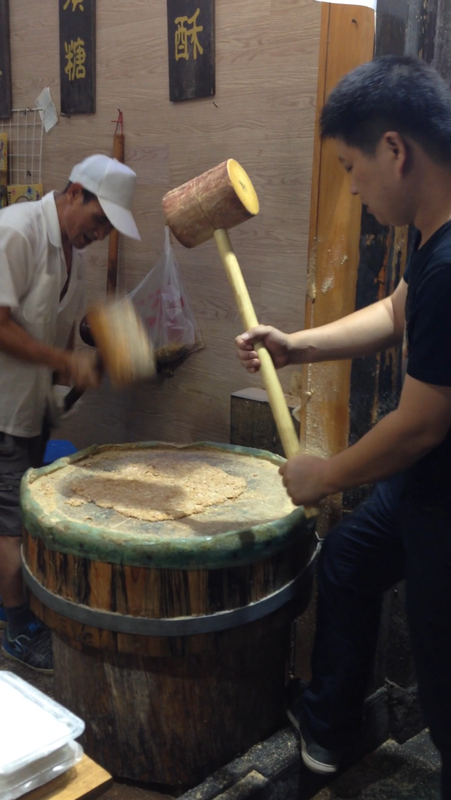 We visited the Bund to execute an ice-bucket challenge, and also to visit Shanghai’s fake markets to have custom jackets made and bars to get a taste of the ex-pat culture in Shanghai. 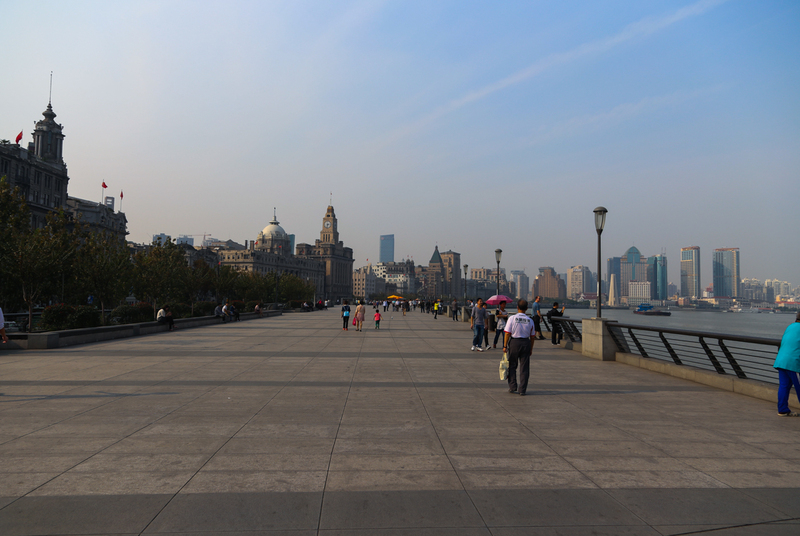 You’ll see from the two photos below of The Bund. Although I’m told the pollution in Shanghai is significantly better than Beijing, there is no hiding the fact that the city does struggle with some pollution particularly during the hot and humid summer months. In one of the photos below I had to increase contrast because the smog was dampening the colors! 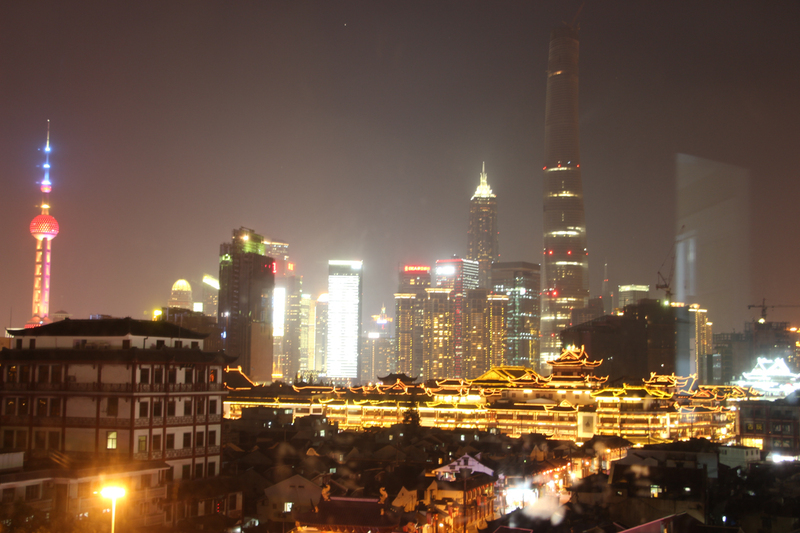 By the end of my stay in Shanghai, I had two days of blue skies and even saw stars on my last night in the city! 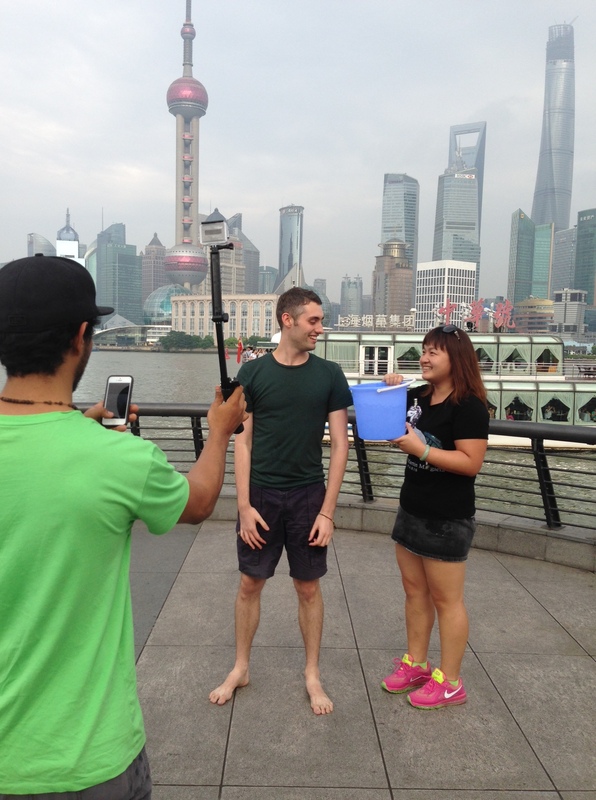 Executing the ice-bucket challenge along the Bund! 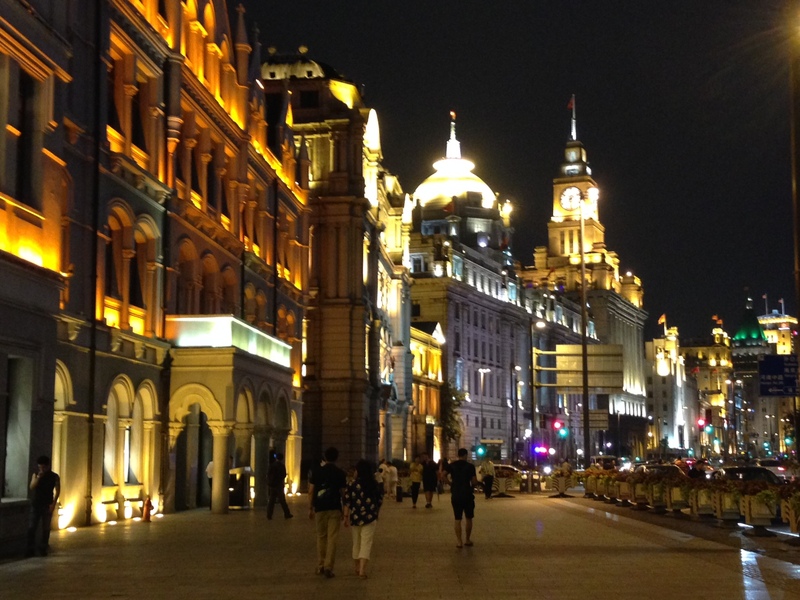 The Bund looking beautiful at night! 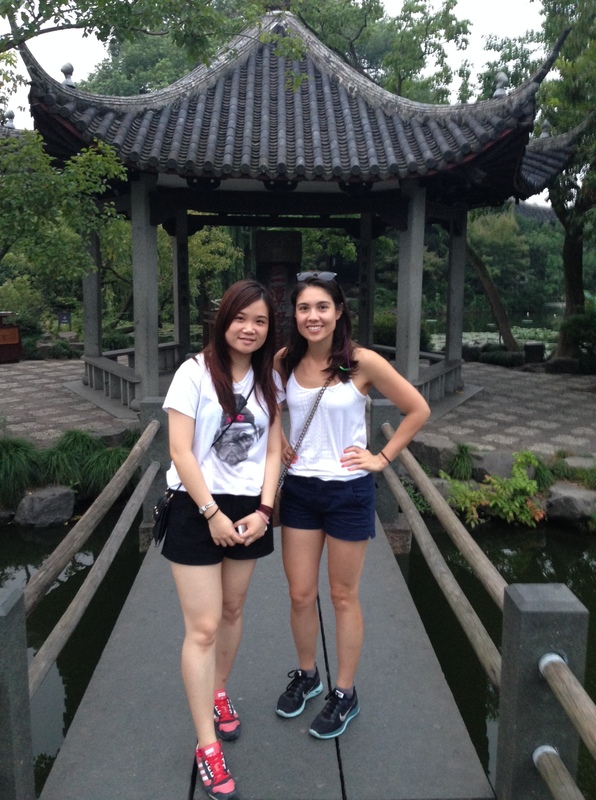 Through Monnie, I met many of her friends who grew up either in Shanghai or another large city in China. This was by far one of the coolest parts of the trip. 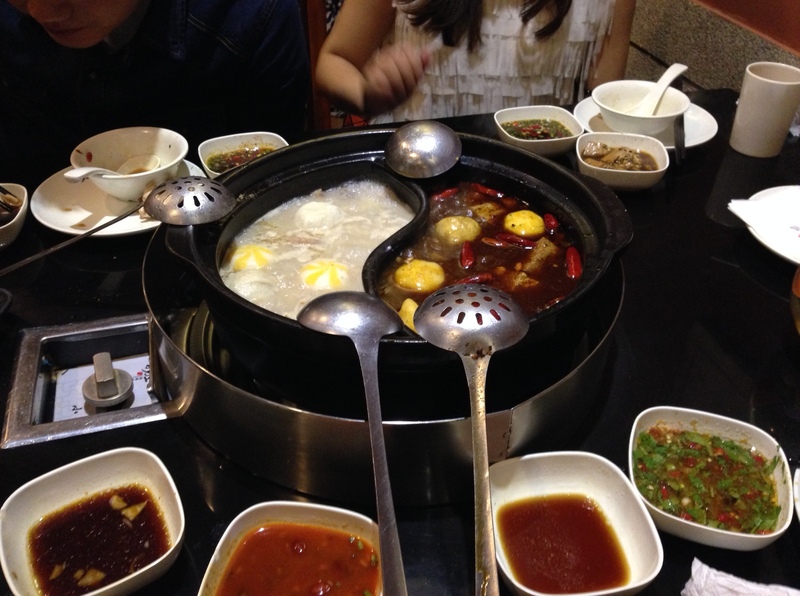 I would spend hours talking to them in Mandarin, learning about their life and culture in Shanghai over a steaming bowl of hotpot (similar to shabu-shabu, but way better!) 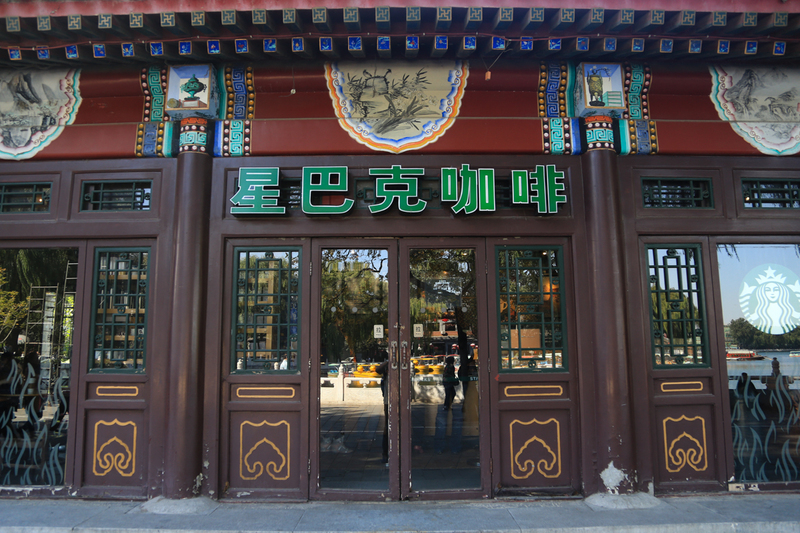 or a traditional Shanghai styled restaurant. 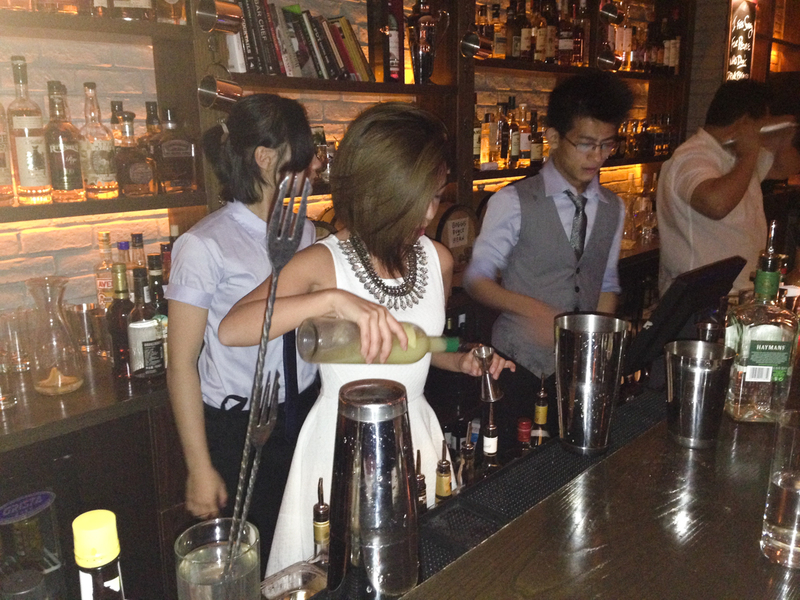 Shanghai’s culture is centered around the enjoyment of good food, drinks, company and of course, KARAOKE! On my last day in Shanghai, Monnie and her friends threw me a surprise farewell party at a swanky Karaoke (pronounced Ka-La-OK in Chinese) Bar so that I could experience one of their favorite outings with friends. We sang, we ate and we drank Tsingtao beers – I had to sit out during the Chinese songs this time, but I look forward to the time when I can also participate! 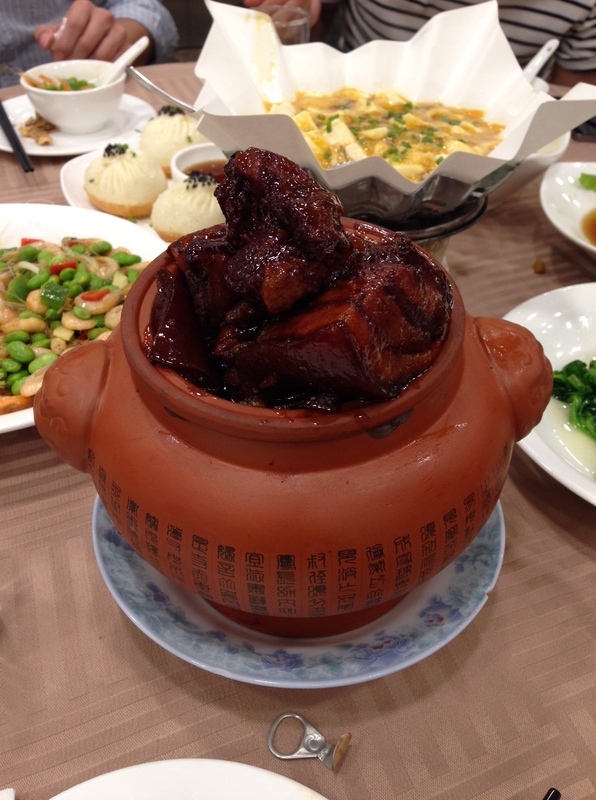 Chinese styled hot pot (i.e. shabu shabu, but better!) with one side spicy, one side mild. Making peanut brittle in the most authentic way possible! Swanky karaoke club entrance. 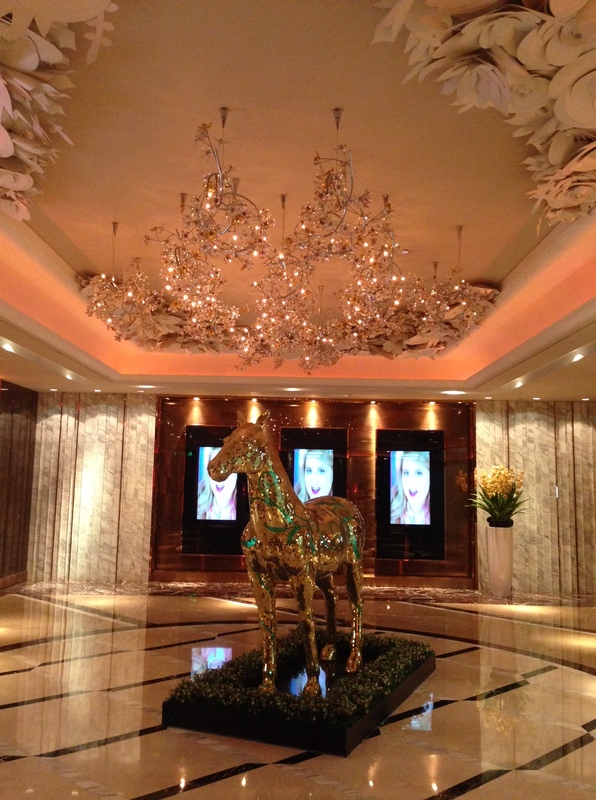 When it comes to Karaoke, China ain’t horsin’ around!! Another highlight was a weekend “getaway” to Hangzhou Melissa (Monnie’s friend), who is originally from Fujian province in the South of China. I was hoping to escape city-life for a weekend, but it turned out that “getting away” got me to a city that had more people than NYC and all of it’s surrounding boroughs combined. 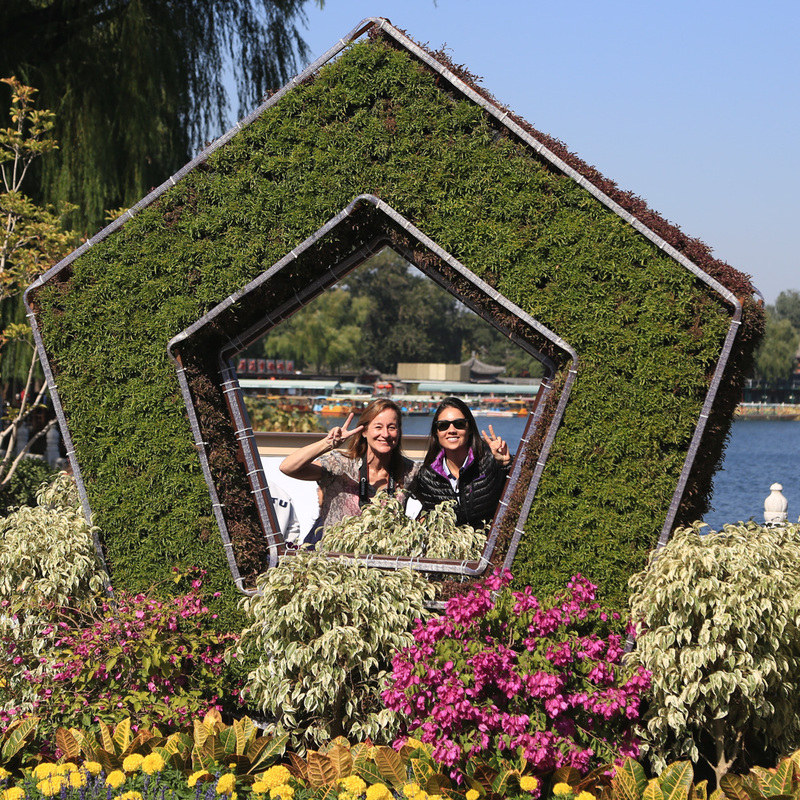 Hangzhou is a city about 100 miles outside of Shanghai, though it only took us about an hour to get there by train. At one point on the train, I looked up and a saw a sign that displayed our current speed: 296km/hr. Impressive! 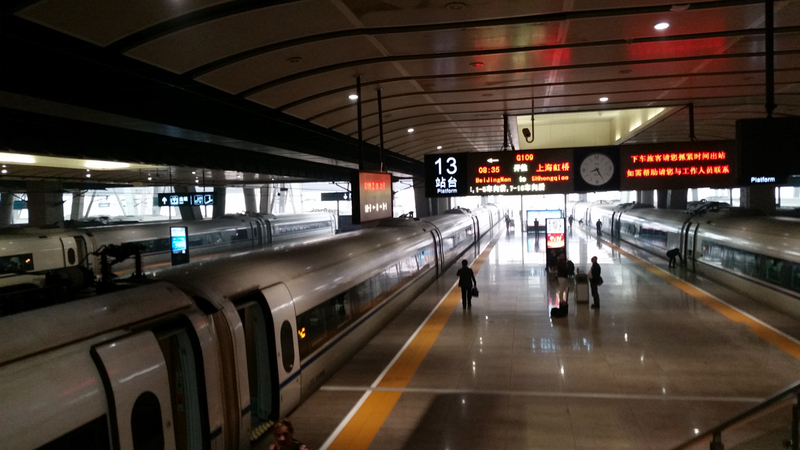 China has something like 16-18 high-speed trains; the U.S. has some work to do to catch up! With 1.4 billion people, 24 million in Shanghai alone, I understand China’s commitment to building efficient modes of public transportation from their subways to high-speed trains that run like arteries throughout China. 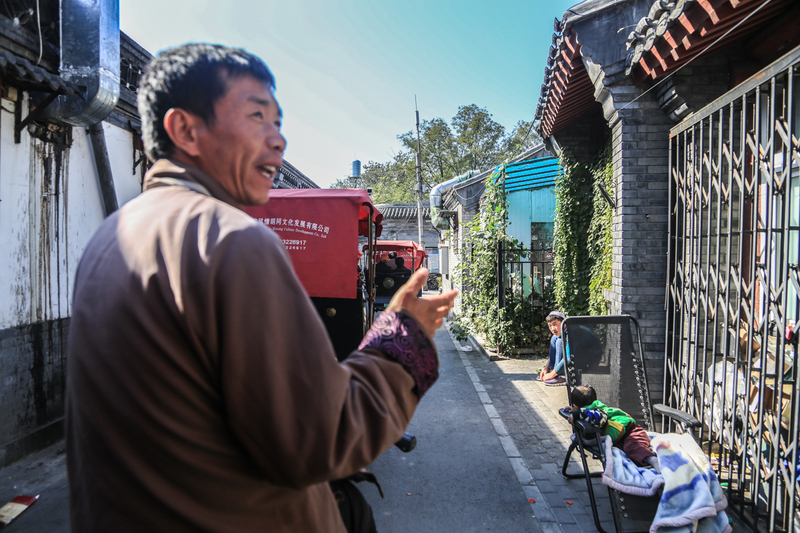 Once we arrived in Hangzhou, we explored around their famous Xi Hu (West Lake) and their historic temples dating back thousands of years (though many have been restored in the last decade). 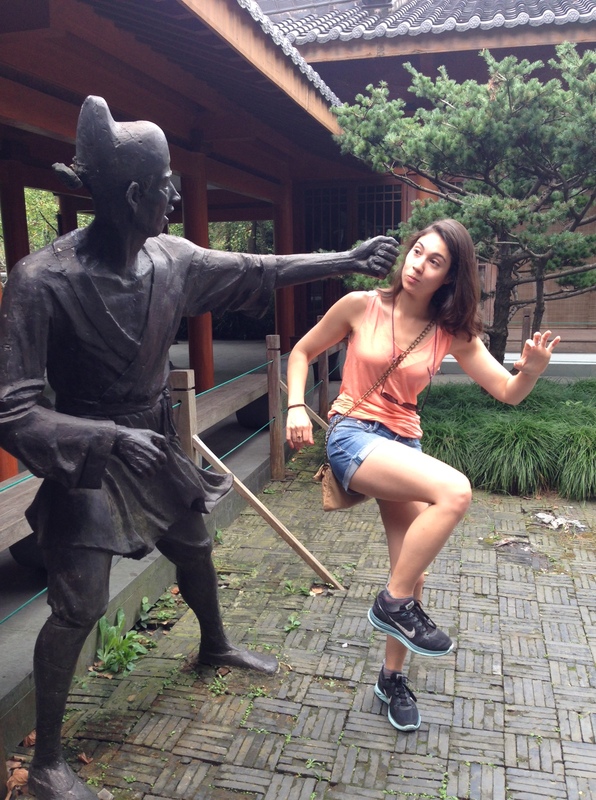 Practicing my kungfu moves with the ancient stone statue. Statue 1, Donna 0. 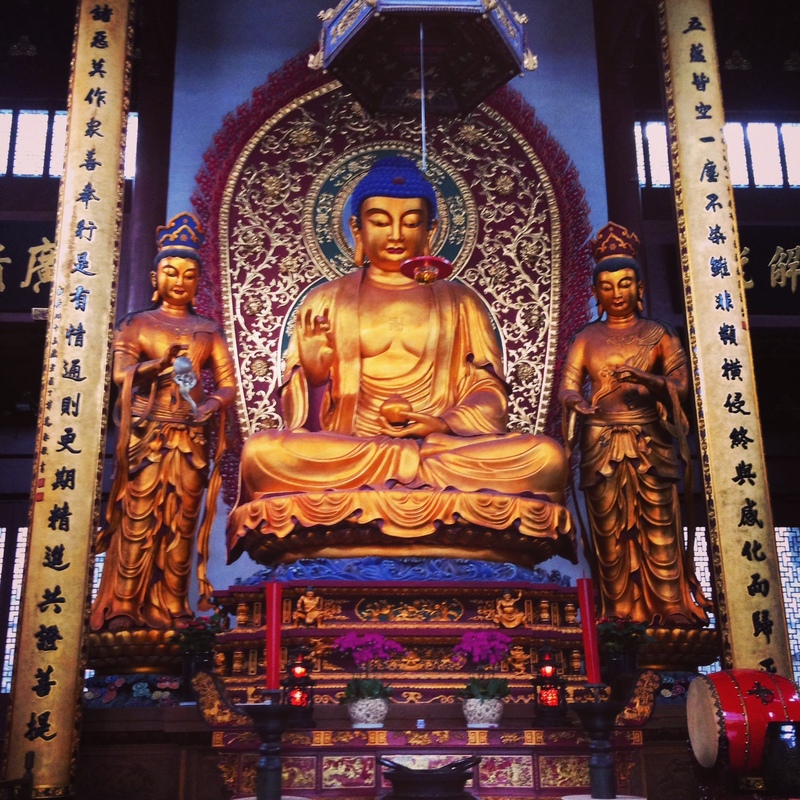 My time in Shanghai flew by and I felt that I had hardly scratched the surface. The good news is that I’ll be heading back there with Brandon, my mom and his mom in a few short weeks to show them a few highlights in the city before we take a local airline to Zhangjiajie for a week long tour. 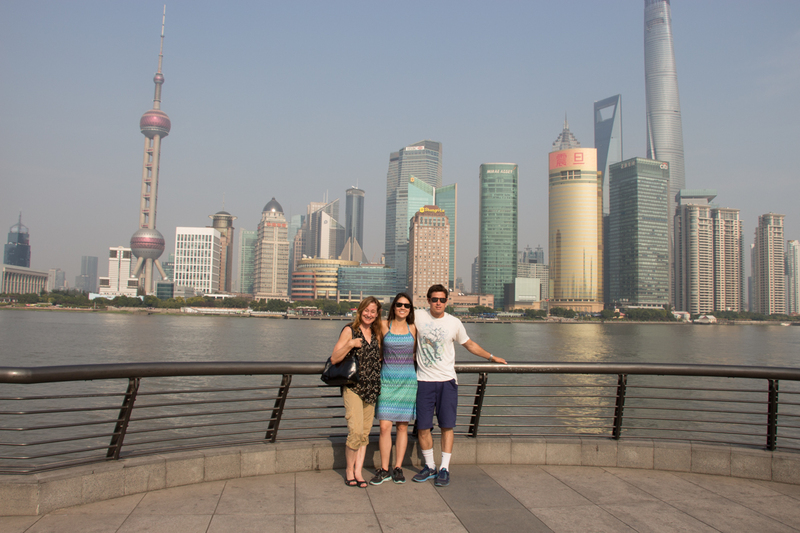 Shanghai has changed significantly since my mom lived there nearly 30 years ago, so I am looking forward to showing her, Brandon and his mom the new Shanghai that I so fortunately had the chance to explore with the amazing friends that I met here over the past three weeks! 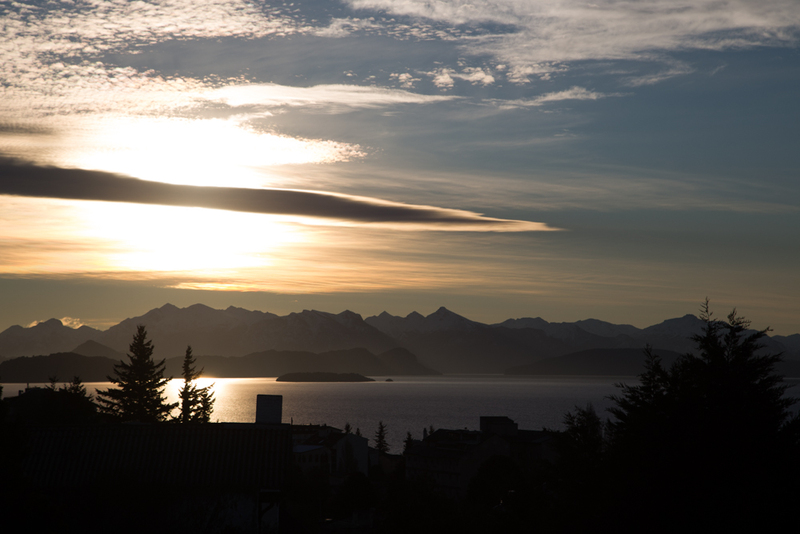 It’s difficult to know where to begin writing about Bariloche to give the place the description it deserves! 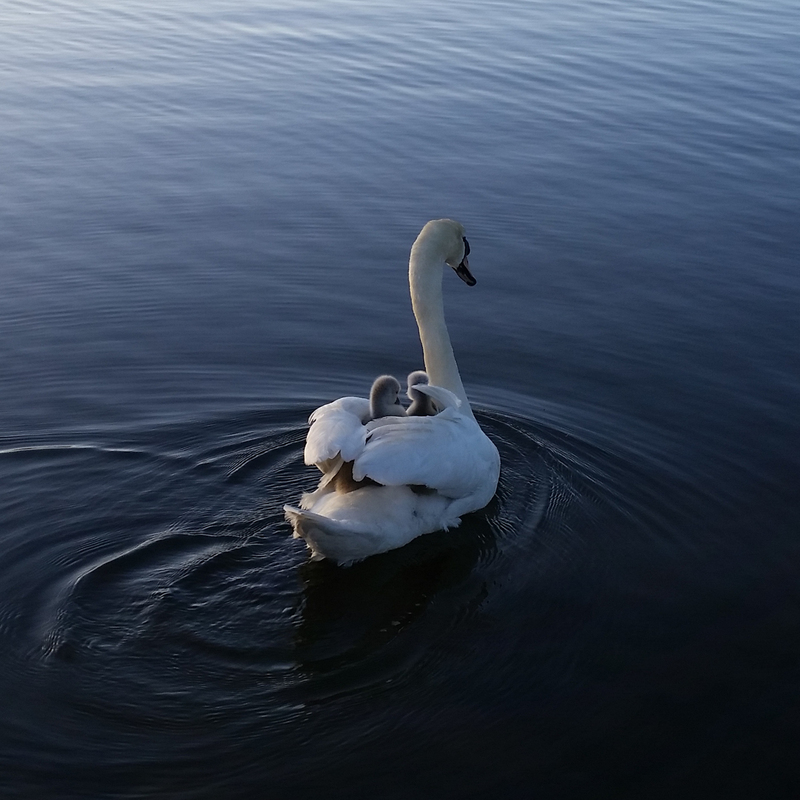 My hope is that through the writing and photos in this post, you will all have a good understanding of a few things this amazing place has to offer and that you will one day visit. There’s something for everyone here! 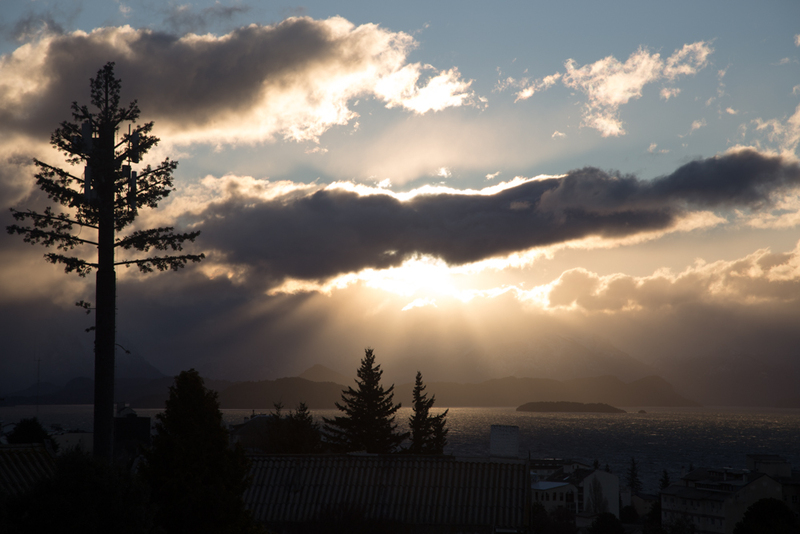 As I write this, Brandon and I have enjoyed just over two weeks in Bariloche, Argentina, which falls in the northern section of Patagonia. 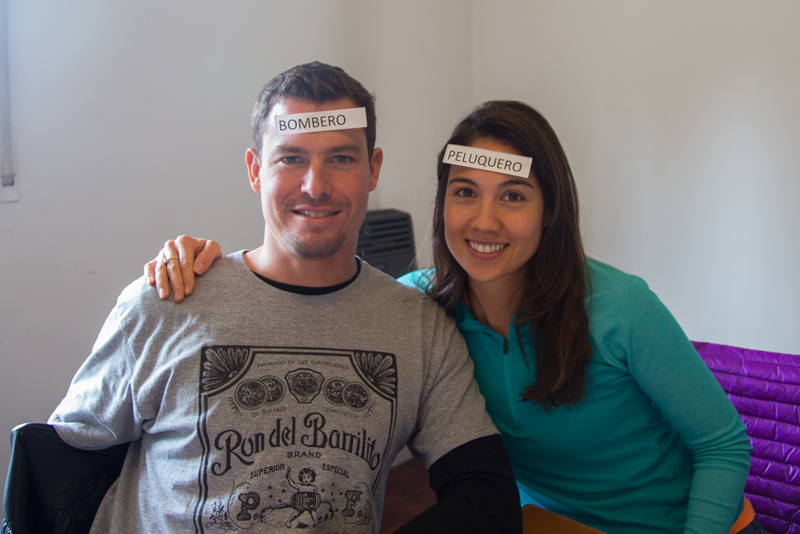 We decided to give full immersion Spanish learning a try in Bariloche, signing up for a homestay and Spanish school. 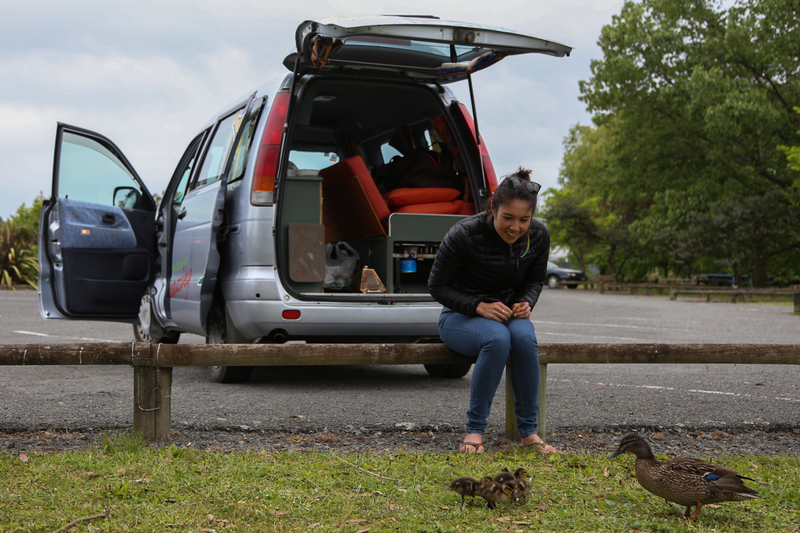 We lucked out with our decision – Mara (our homestay mother) welcomed us into her home with open arms. 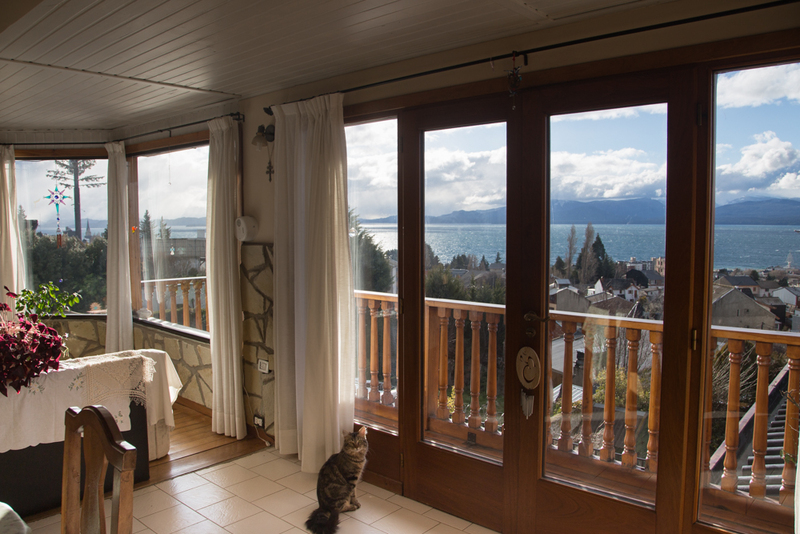 Every morning, we woke up to breathtaking views of Lake Nahuel Huapi from her balcony followed by a light breakfast and every flavor of tea you could imagine. For mate drinkers, there’s no shortage of mate in Argentina. Every night, Mara home-cooked a massive spread of dinner ranging from traditional empanadas and pizzas to Argentinian beef paired with potatoes and Argentinian-styled shepards pie. I will certainly miss her cooking. 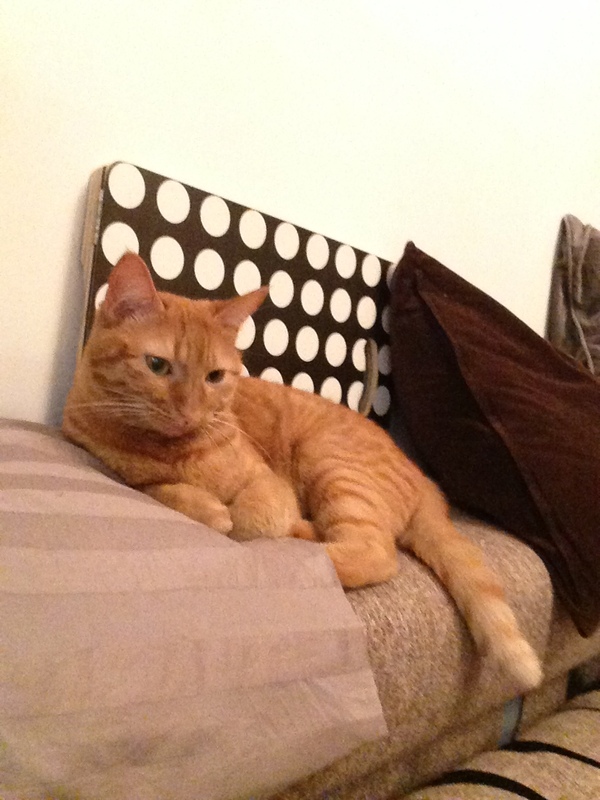 Naturally, I befriended Mara’s cat, Poncho, spending many hours relaxing with him at the house. It was a full house. 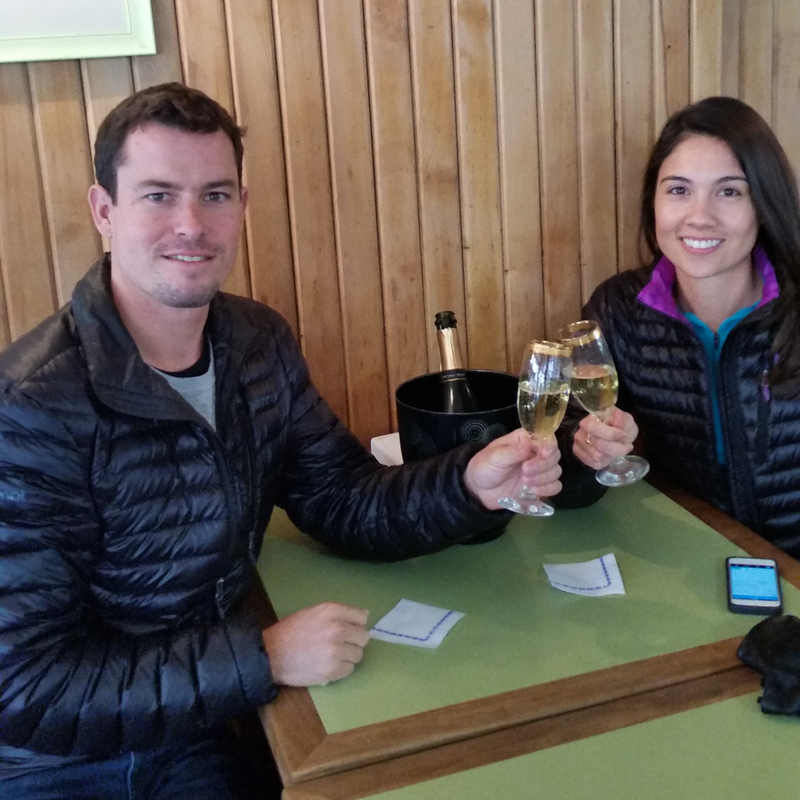 In addition to the two of us and Mara, her two daughters, Belen and Paula were also living there for the ski season which made it a lot of fun for Brandon and me to learn about life in Bariloche. 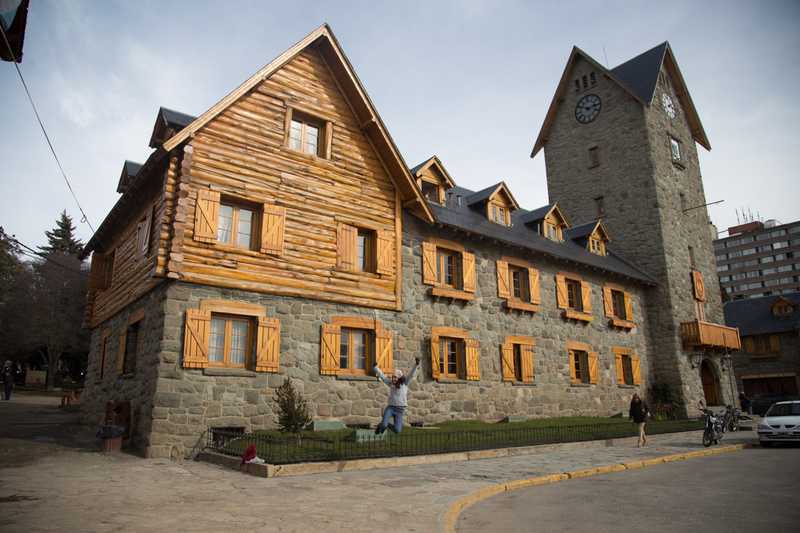 Additionally, Mara is renting another two rooms to Martin, an Argentine who works as a ski instructor, and Gonzalo, who returned to Bariloche from Buenos Aires to work at Cerro Catedral for the South America winter. 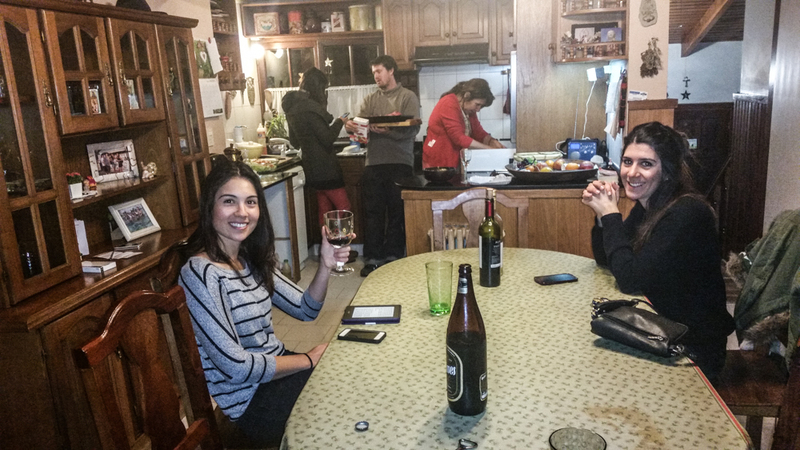 Nightly dinner discussions ran the gamut from conversations around their healthcare system to the government’s decision two years ago to limit the possession of USD among the Argentinians. 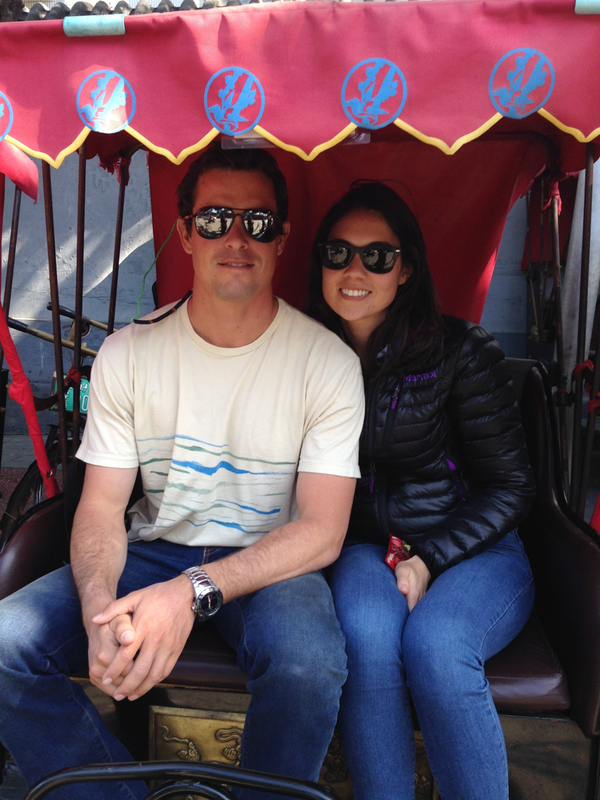 On the lighter side, we learned about the history of Cerro Catedral and where to ski. 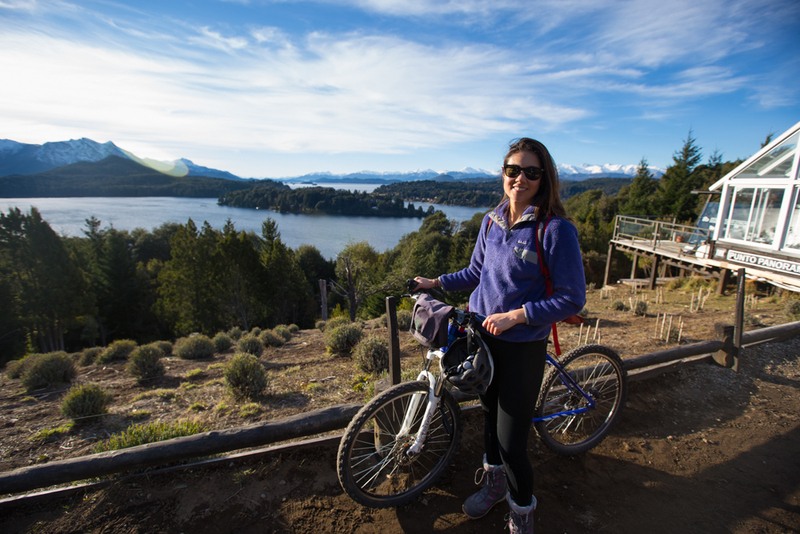 We also learned about Bariloche in the summer: epic mountain bike trails, white water rafting, sailing on Lake Naguel Huapei and accessing hidden beaches, and waterfalls along day-long hikes through the mountains. 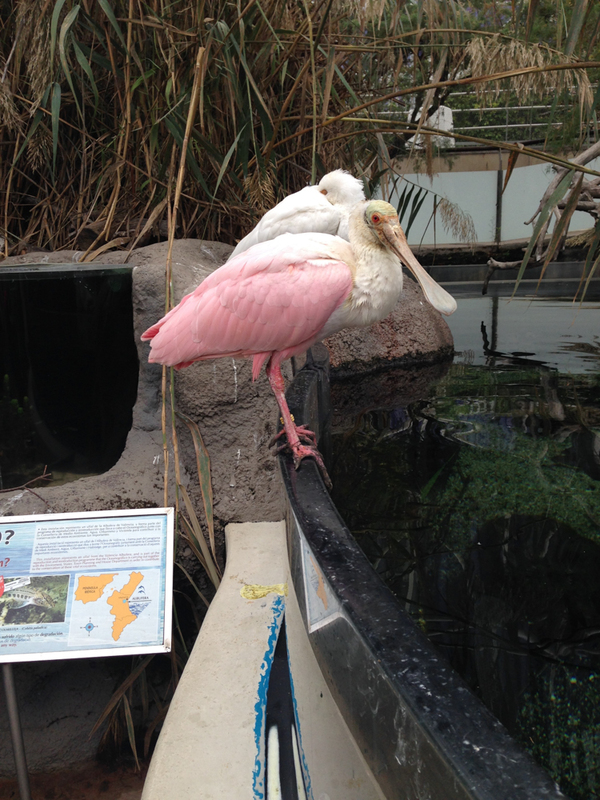 For nature lovers, it’s breathtaking and all here at your fingertips to enjoy! 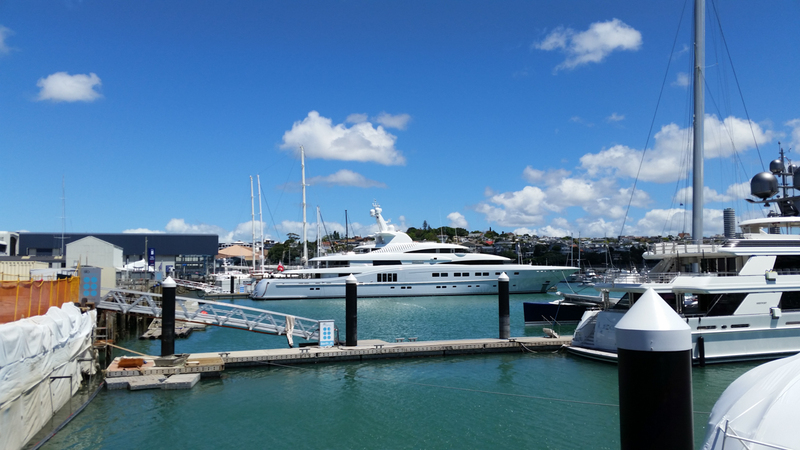 View from the dining room. Pancho is a lucky cat and he knows it. 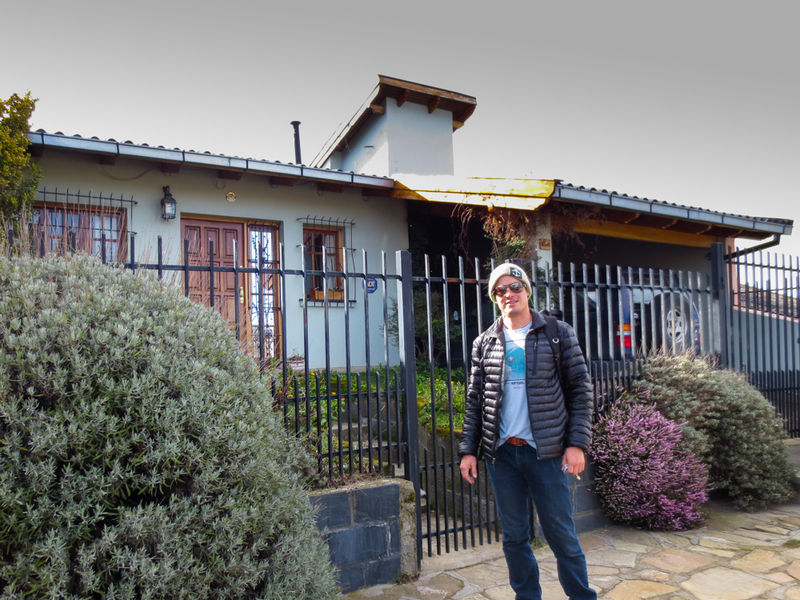 Brandon in front of our Bariloche homestay: Casa de Mara! Fine wining, dining and conversing in Casa de Mara! On this night we enjoyed a traditional Argentinian Asado (bbq) cooked by Gonzalo! 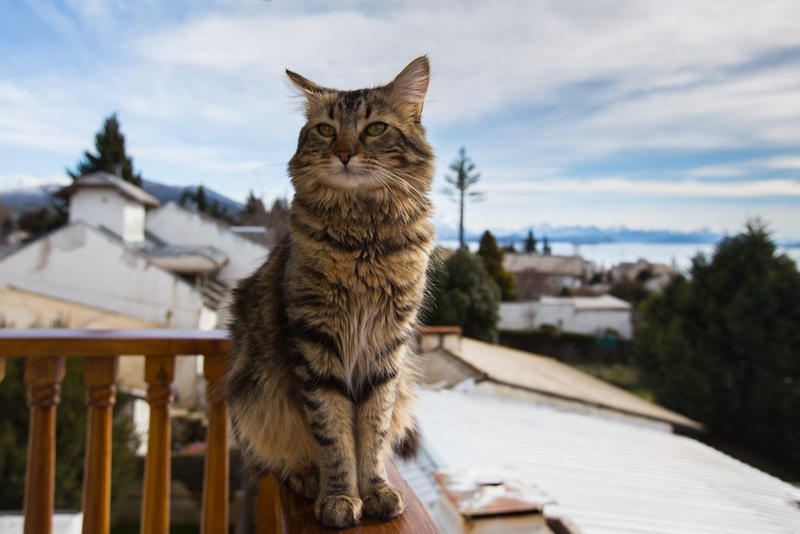 Looking regal and majestic, this is Pancho, the king of Casa de Mara! 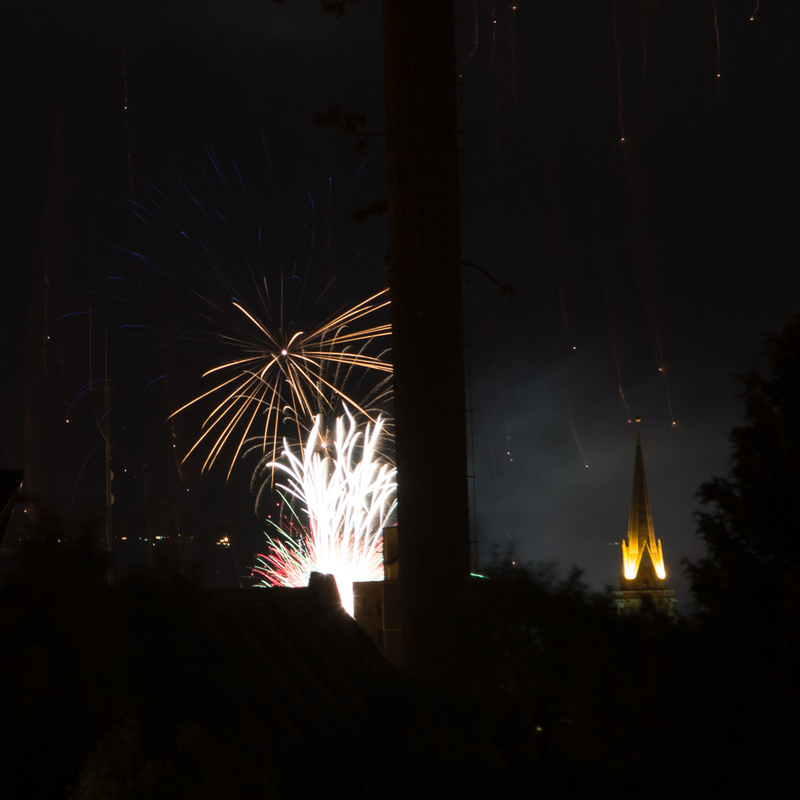 Fireworks on the last day of a SnowFest celebration in Bariloche. The Cathedral is beautifully lit on the right! Sunset from Casa de Mara! 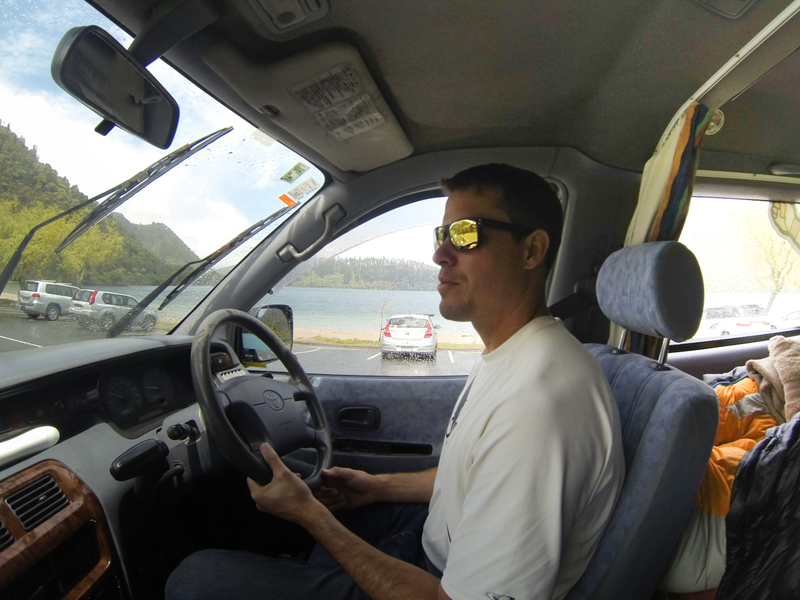 Surf-able waves on Lake Naguel Huapei! 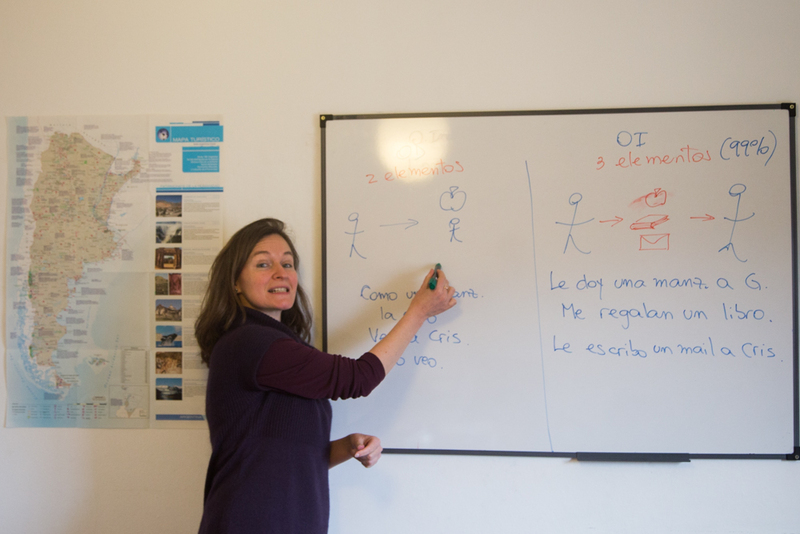 Brandon and I filled our weekday mornings in an intensive Spanish school at the Academia Bariloche (muchas gracias to Mike Stewart for the recommendation). My Spanish went from hola and gracias to a few full sentences and Brandon’s has improved drastically! Because Brandon was the only intermediate student signed up for the course the last two weeks, he had private lessons with his Professor, Sol (pictured below). For my first week, I had solo lessons with my Professor Fatima before Stefano, an Italian, joined my class the second week. Although Stefano and I had the same number of hours learning Spanish (approximately 15 hours EVER), he picked up the language as if he knew it from a prior life. Clearly because Italian is so similar to Spanish, those speaking Italian can pick up Spanish faster than English speakers! Overall the Spanish school was challenging and I found that I enjoy learning a new languages and I hope to continue to study Spanish over the coming months. The last day of class was interactive as we played guessing games entirely over Spanish where I overused the phrase, “Como se dice en espanol?” Also on “graduation day,” we learned to make beef empanadas, so when Brandon and I return to SF or visit any of you in your respective cities, we promise to whip up some homemade, piping hot empanadas! Interactive Spanish Learning. 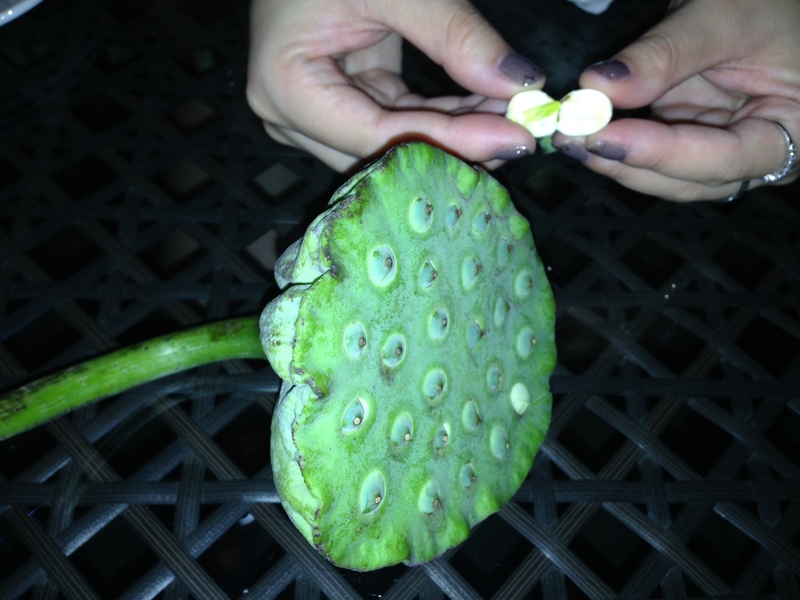 Do you know what we are?? Brandon’s Spanish teacher at Academia Bariloche, Sol. 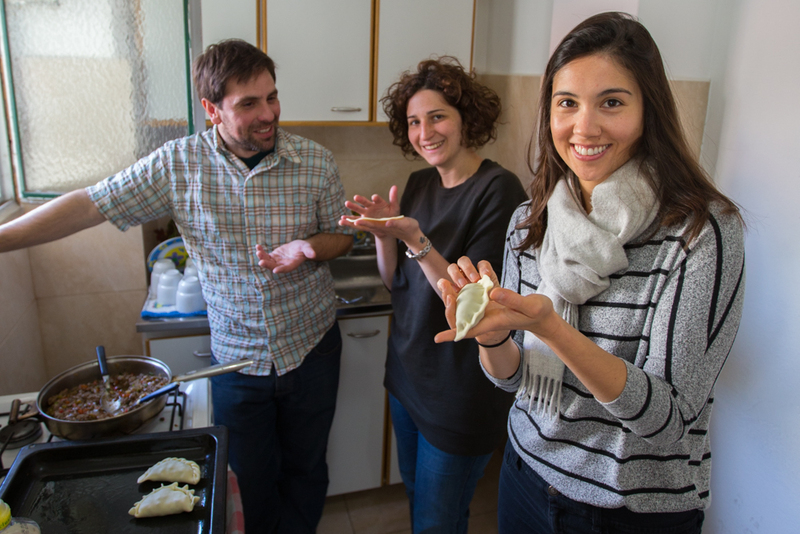 Learning to make empanadas with our classmates on the last day of Spanish school! 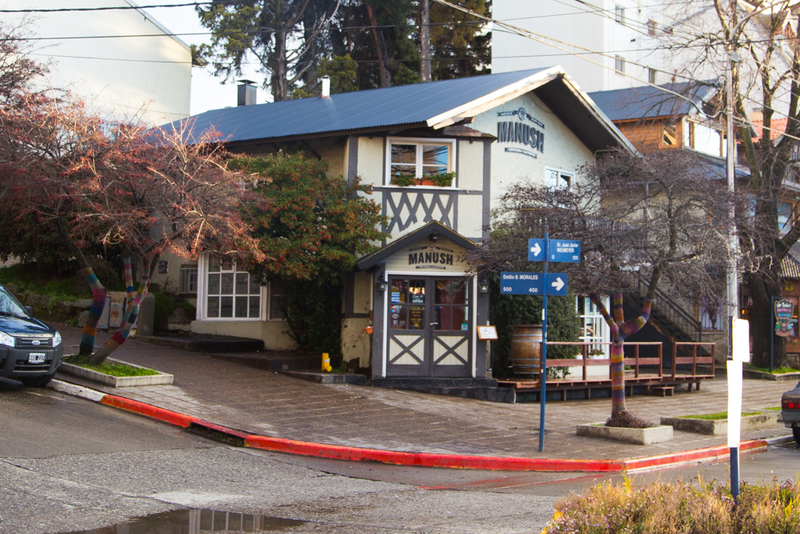 A Bariloche post wouldn’t be complete without discussing the massive quantities of beer that this town produces! 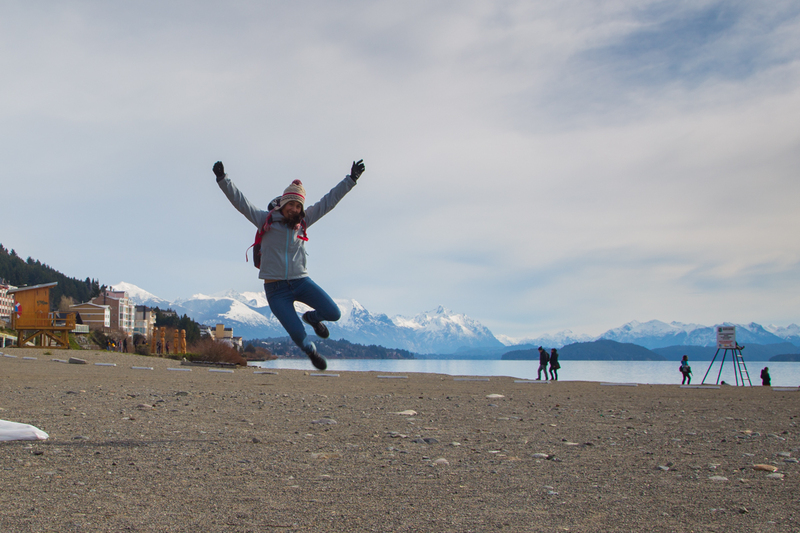 When we decided to come to Bariloche it was primarily because we wanted to check out northern Patagonia and do some skiing. 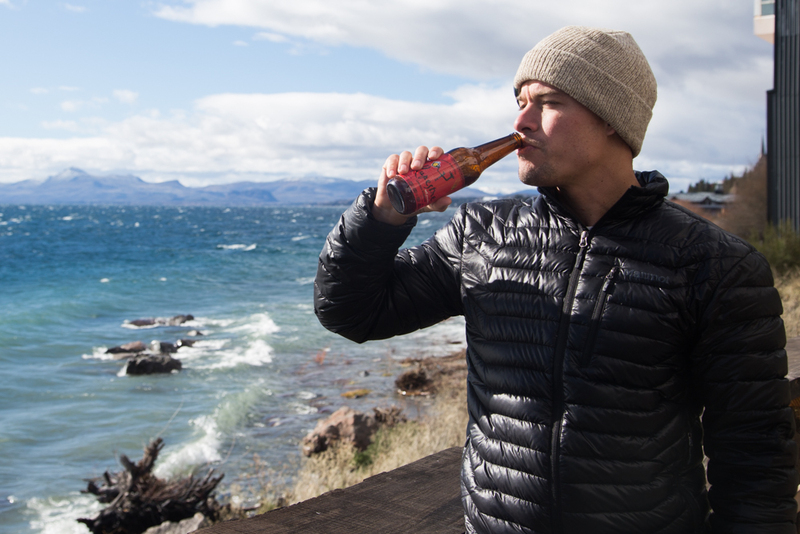 Unbeknown to us, Bariloche also happens to be a beer connoissuer’s heaven, which certainly made Brandon very happy. 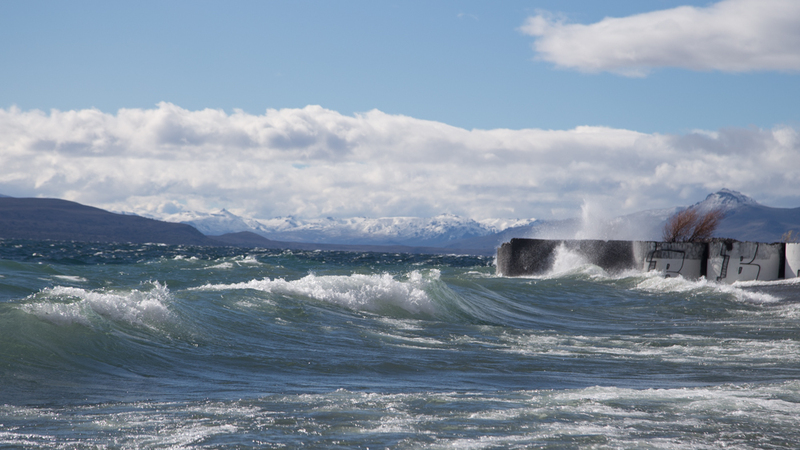 In the Bariloche area there are no less than 20 ceverzerias. Here, being a ceverzeria means that you make your own beer, which is kind of like a micro-brew in California, except the beer they make here they call “artesenal” and it is basically homebrew. 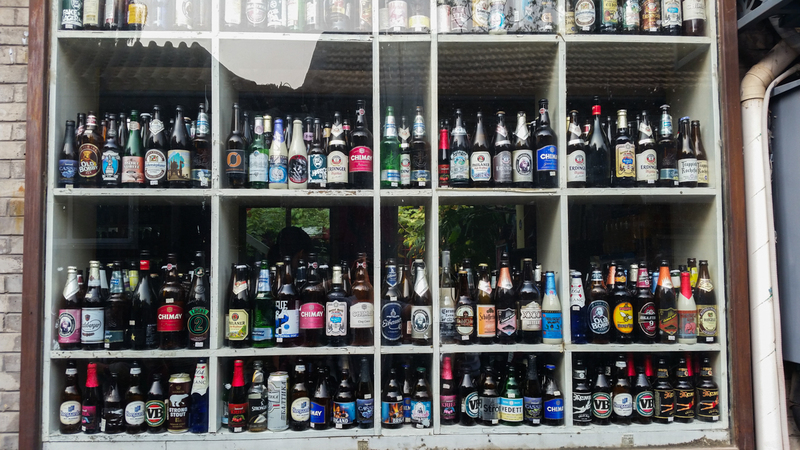 Each of the ceverzerias makes an assortment of different beers, with negros (black Stouts and Porters), ales (pale ale, IPA, blondes), and rubias (reds, Scottish) being the most popular. Brandon has tried about 30 different kinds of beers so far like he is on some kind of crusade to try them all. Also, for us the beer is cheap! Everyplace has happy hours that begin around 6pm and go until about 9pm and you can get pints for $2. So awesome! 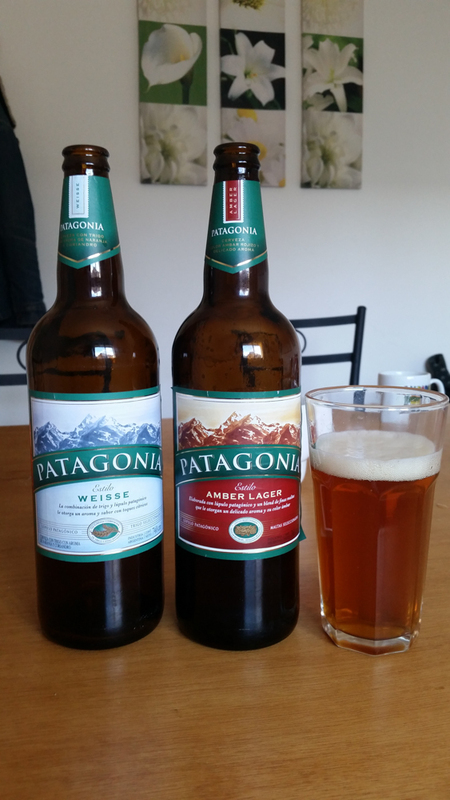 A colorful assortment of Patagonia Cervezas! 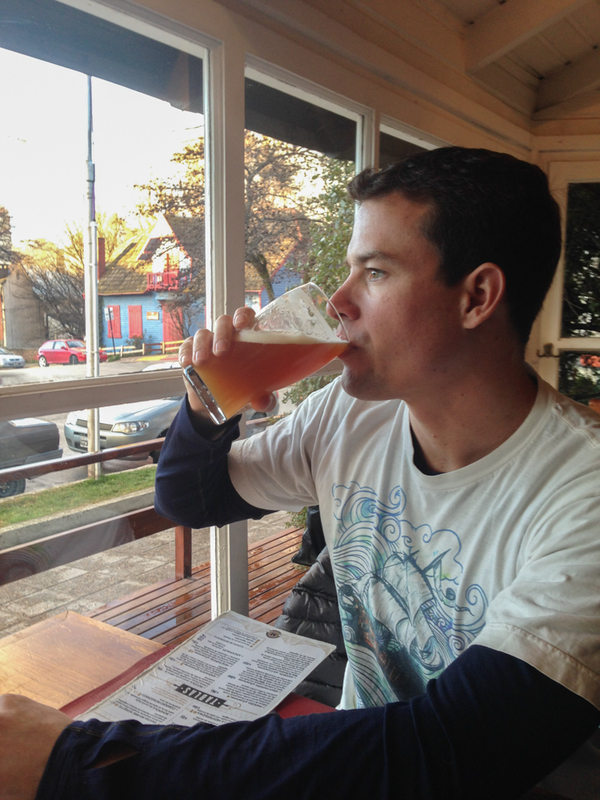 Brandon enjoying a Cerveza at one of our favorite Cervezaria’s in town, Manush. Beer flows like water in this town (and costs just as much)! 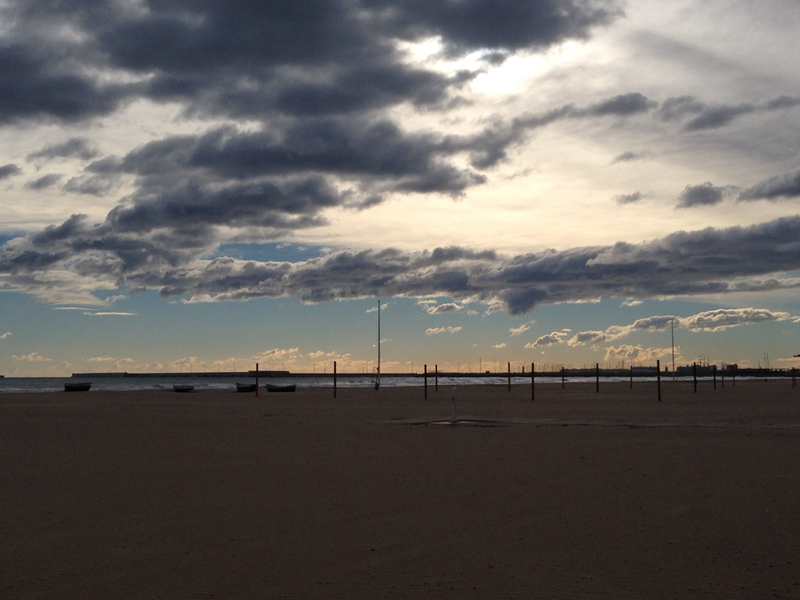 Finally, one last fun activity that filled an afternoon was biking El Circuito. 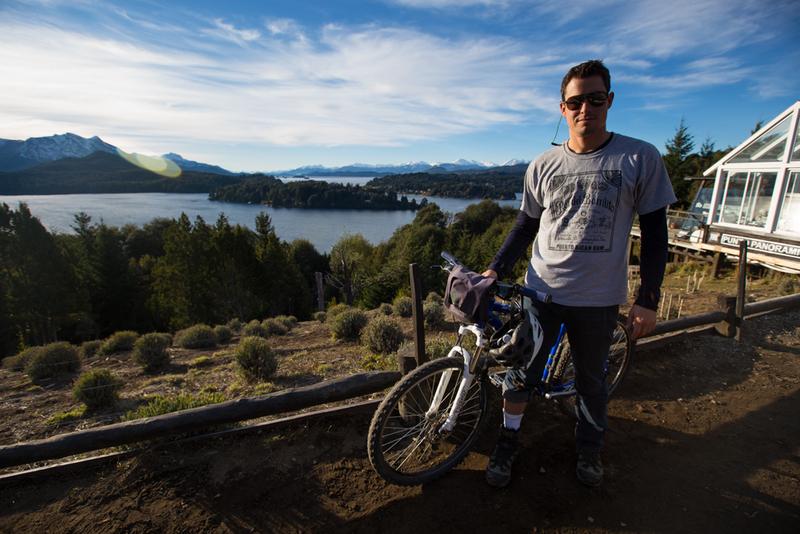 This was about a 25km ride that loops around the western part of Bariloche, half of which is a protected, undeveloped forest. The glacier carved land here is rather with frequent ups and downs which made the ride a tad harder than perhaps we expected. 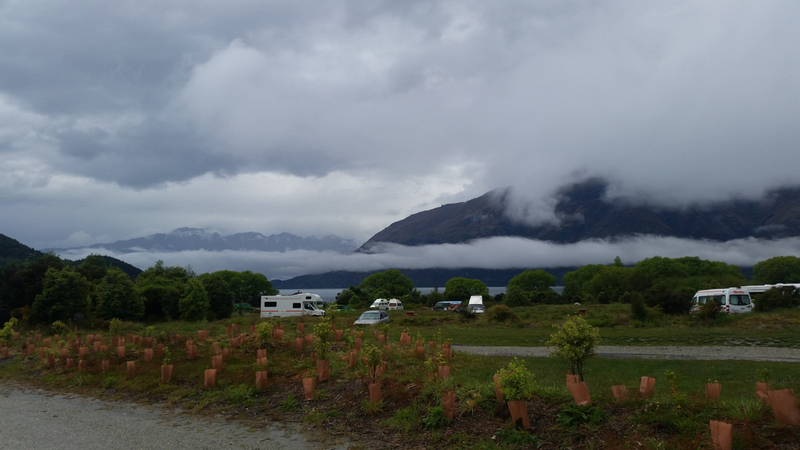 During the ride we visited the famous Loao Loao hotel, made frequent stops to “take it all in”, found Lago Escondida (Hidden Lake), and were able to get a real feel for the land. 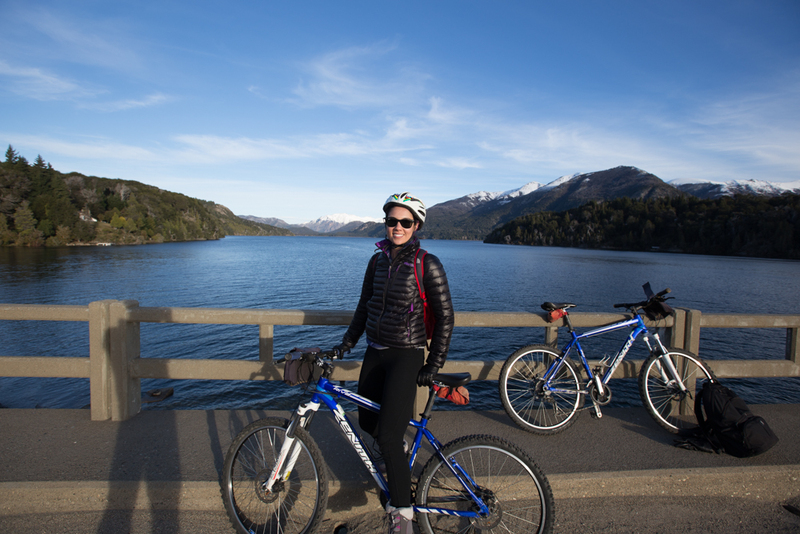 I think I originally thought that everything would be too cold and snowy for biking here in Bariloche, but the lake is only about 1500 feet in elevation and so even in the winter it has proven warm and nice enough to go biking. I love Bariloche! 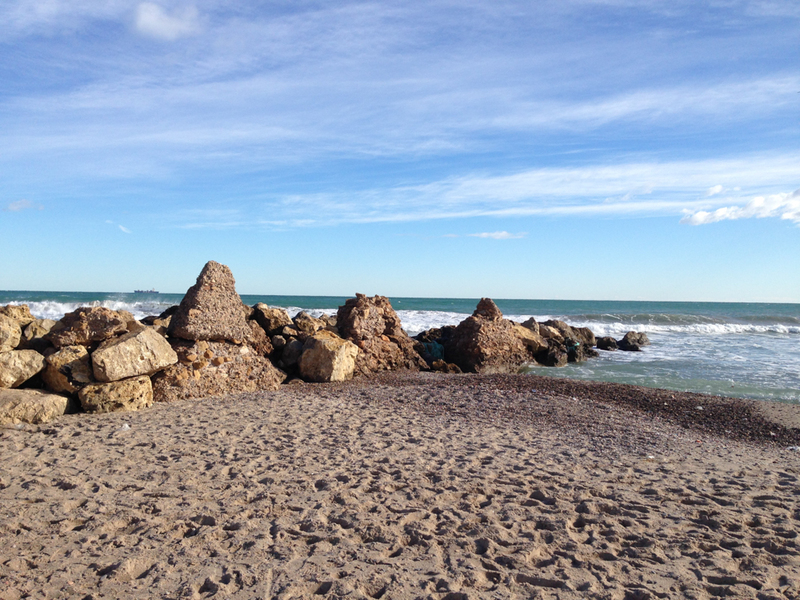 Taking a panoramic break along El Circuto. 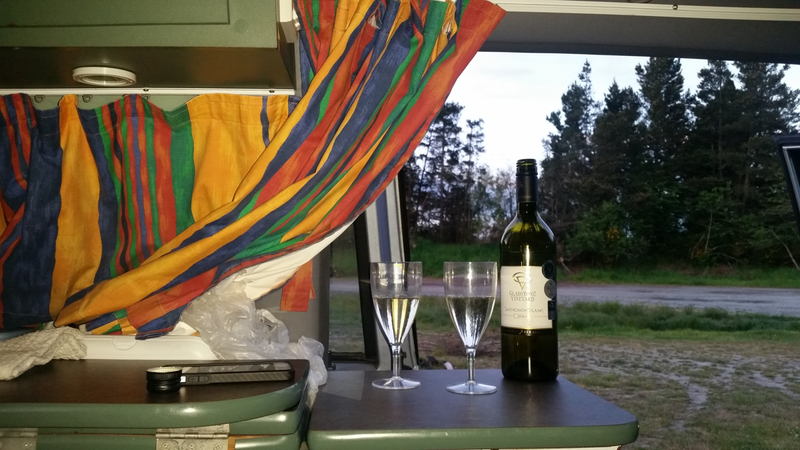 After a long journey from San Francisco to Argentina, Brandon and I were very excited to have arrived in Buenos Aires on July 31st to begin our travels! 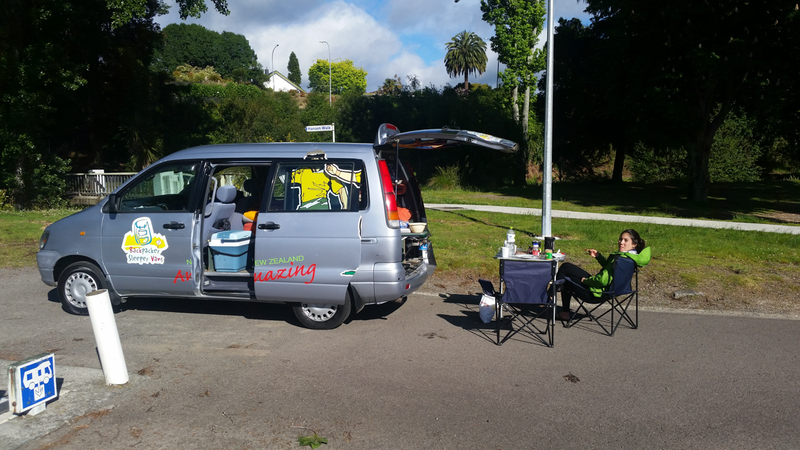 The moment we landed, we booked an airbnb in the Palermo district of Buenos Aires where we dropped our bags and immediately crashed for 12 hours. Sleep had never felt so good. 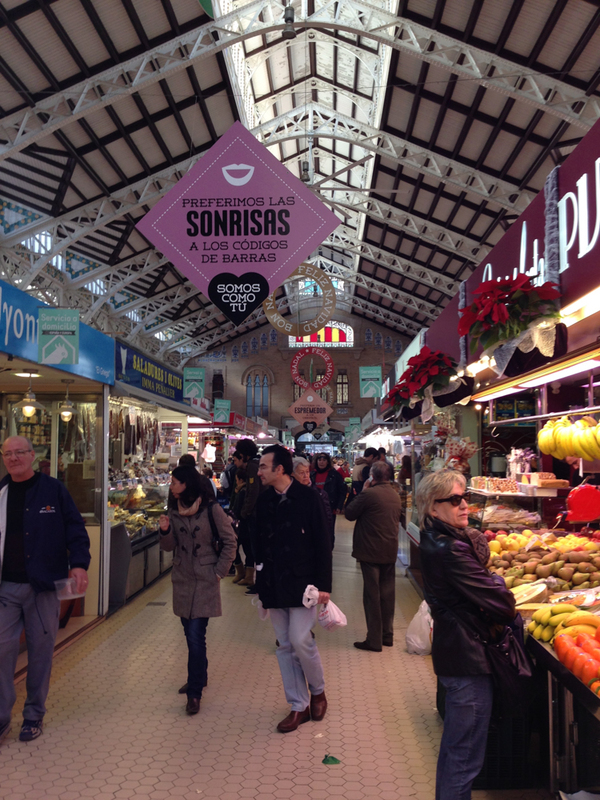 Once we were well rested, it was time to tour the city and enjoy traditional Argentinian meals. Of course, before we could do anything, we needed to exchange USD for pesos. Heeding advice from our friend, Grant, who recently planned to visit Argentina and had learned the ropes while in Chile, we brought with us crisp, sequential $100 bills to exchange for pesos. Because of the capital controls in place in Argentina and the government’s control of the exchange rate, we learned we could find a better rate in the “black market” for pesos in the city. However, first we had to use Brandon’s debit card to get only a small amount pesos from an ATM at the airport so we could catch a cab into the city. The exchange rate at the ATM was a paltry 8 pesos per $1. We quickly learned that Argentina is desperate for USDs as its own currency continues to lose value (nearly) by day, and because the Argentinian government makes it incredibly difficult for the Argentine’s to retrieve USD from their banks. Not to mention, Argentina was in the midst of a default against the US, which literally happened the day we arrived! This meant that in the black market, we were able to achieve a more favorable exchange rate of 12 pesos to 1 USD. In reality, Argentinians consider this so-called “blue rate” the true exchange rate. 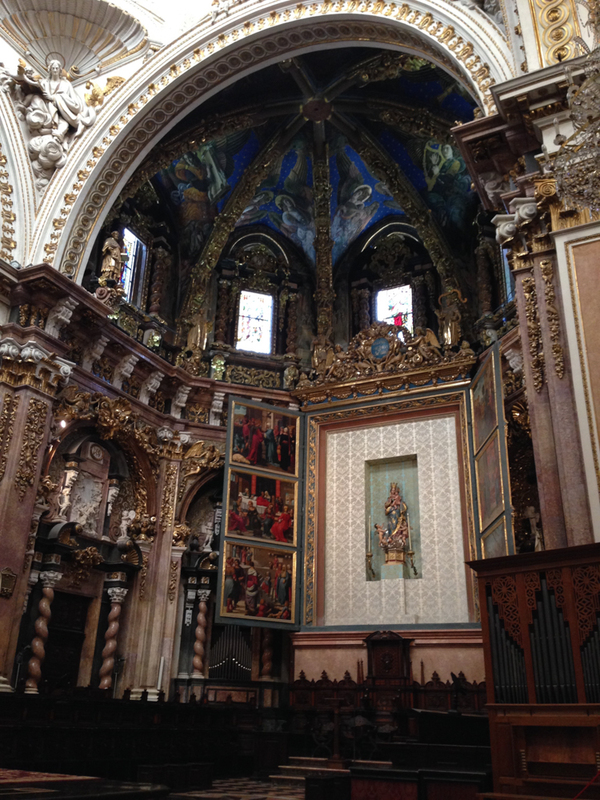 With pesos in hand, we first toured around the Palermo District and had lunch near our place. 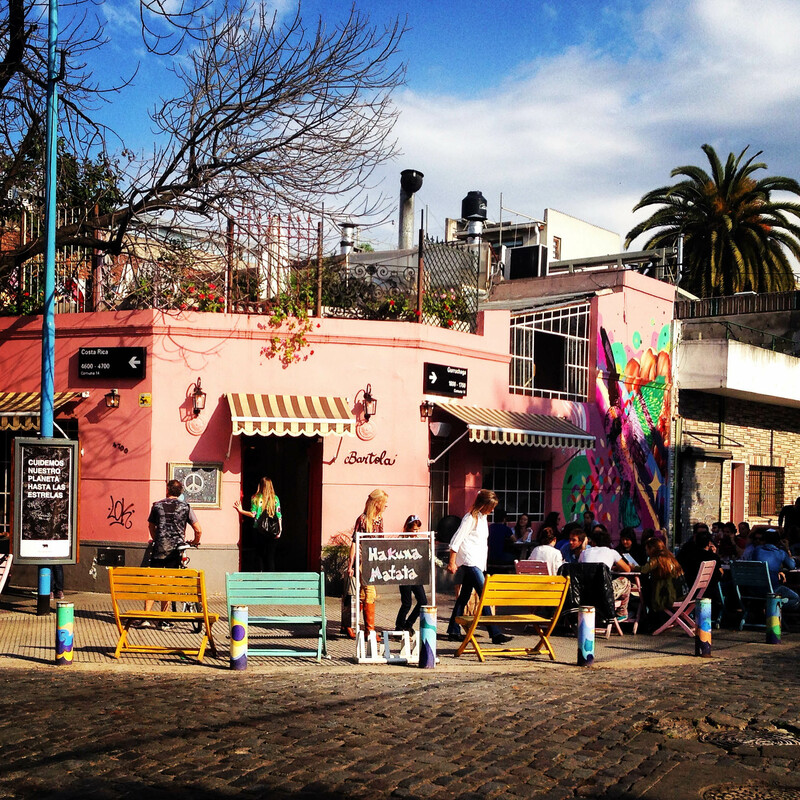 Wow is the food good in Buenos Aires – from vegetarian dishes to steak and chorizo options, you cannot go wrong in this city. After lunch, we walked towards the downtown area of BA and came upon city bikes, which we learned were free for both the locals and for tourists. By simply bringing a copy of our passports to any city bike rental station, we were able to use the bikes for an hour at a time. We took advantage, riding around what is considered their Central Park, taking in the city around us. This was a typical night in Buenos Aires?? Even my years in NYC just after graduation didn’t yield nights past 4am! My blood sugar levels fell just listening to his proposed schedule for Saturday night, but we followed his expert suggestions, and it turns out that Agustin was spot on. Brandon and I kicked off our night at Don Julio’s Argentinian steakhouse at 11pm, following an awesome recommendation from Todd Evans. Then we meet up with Agustin for a drink at 1am. Finally at 2:30am we found ourselves in front of the first disco-tech, The Rose Bar. The dance floor was empty inside. 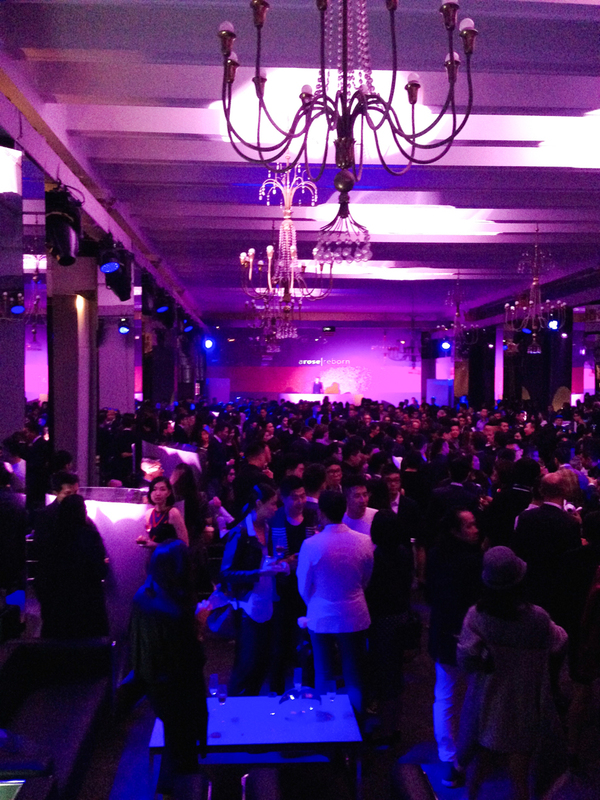 Augustin explained that most people won’t start showing up until after 3am… and again, he was right. We switched to another disco-tech, Keki, which was going CRAZY at 4am as if the party had just begun! 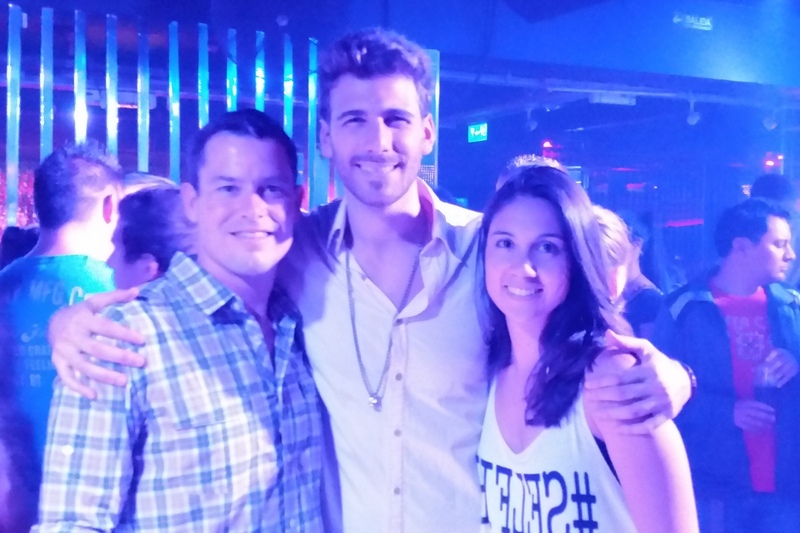 We had a great time thanks to Agustin who showed us the best of the Argentinian nightlife. Utilizing Buenos Aires’ Free City Bikes Rentals. All that’s needed is a copy of your passport! A view looking down Guatamala street in the Palermo district. Banco De La Nacion Argentina the day the bank defaulted! No one in the city seemed phased. Enjoying a traditional Argentinian steak dinner at Don Julios. Check out the menu, it is SF’s Bobo’s at 1/4 the price! 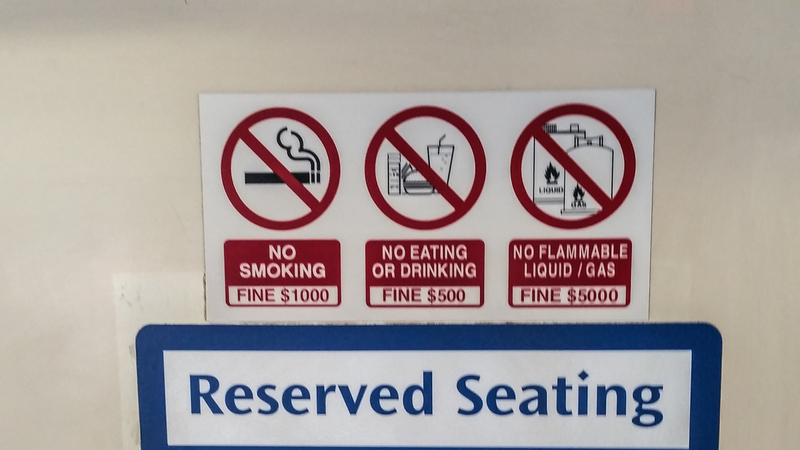 (divide all the prices by 12 to get the dollar cost). Thanks for the recommendation Todd Evans! A standard night out in BA – picture taken at 4am (the height of the party). This country knows how to party!! 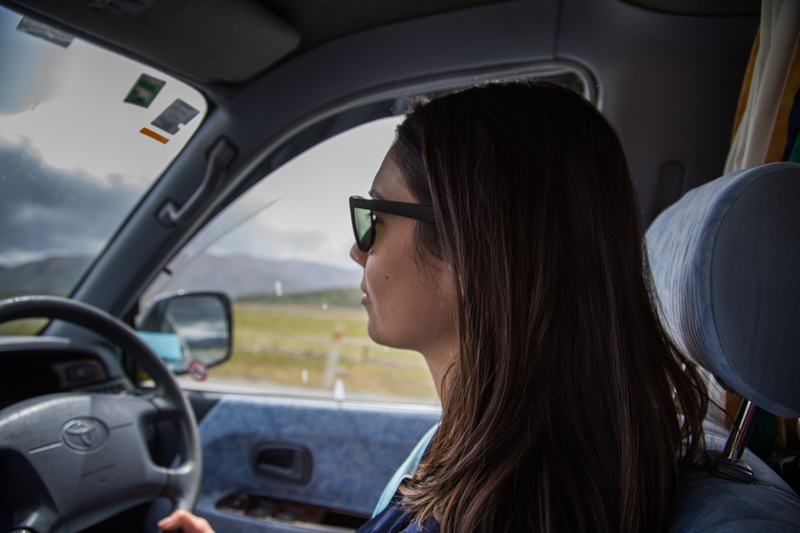 The Radical Sabbatical unofficially kicked off in April 2014 when we visited the West Fjords of Iceland for a week-long backcountry tour of Hornstrandir with good friends. We were fortunate to have a friend of Brandon’s, Einar Svensson, hook us up with Borea Adventures to build out the week of exploring and pushing beyond our physical (and emotional in my case at least) limits! In the end, we all had an amazing time in Iceland. 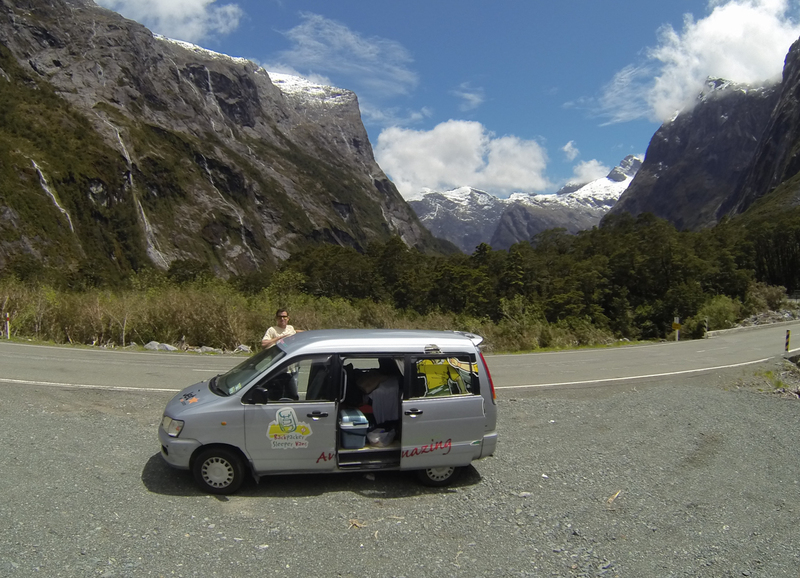 Check out this 64 second clip of our trip!